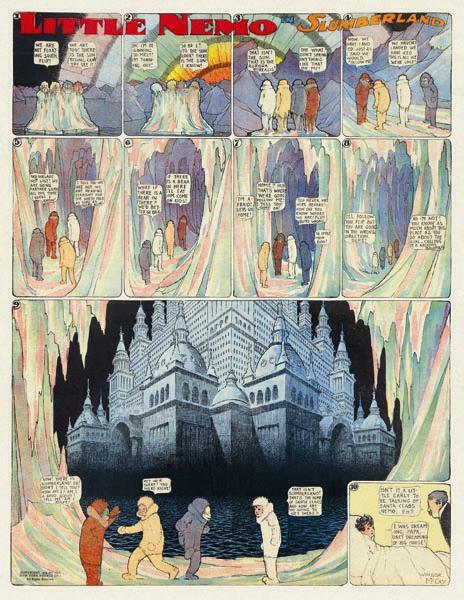 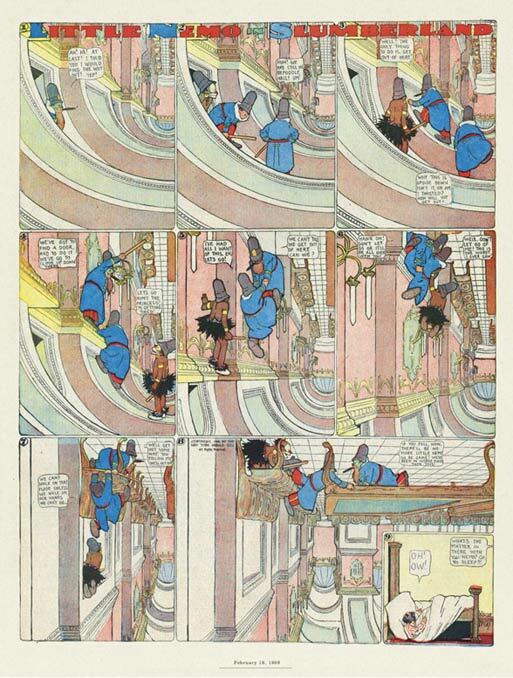 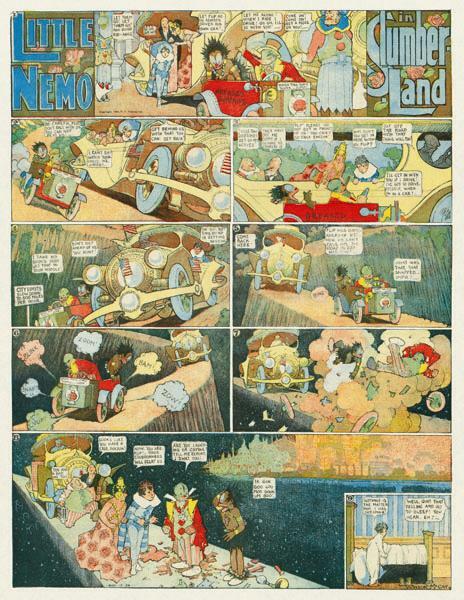 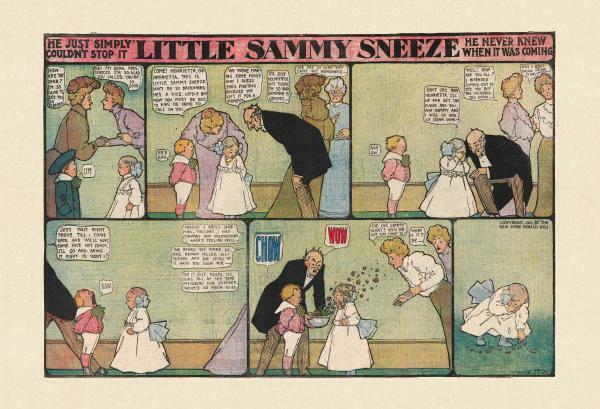 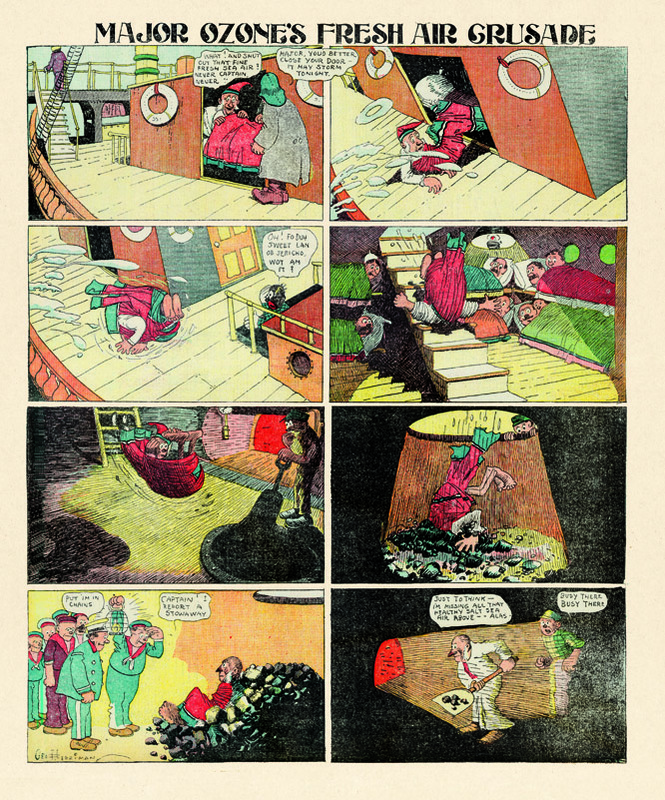 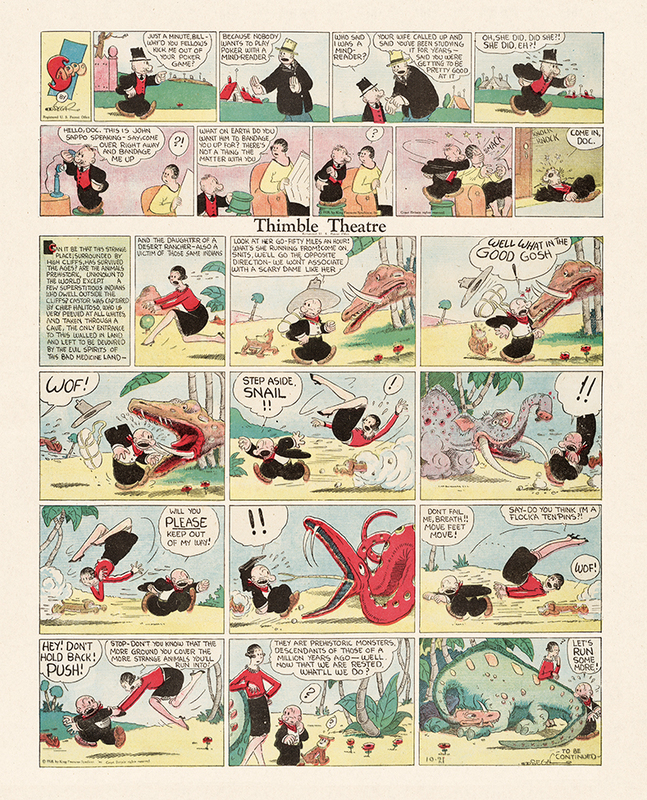 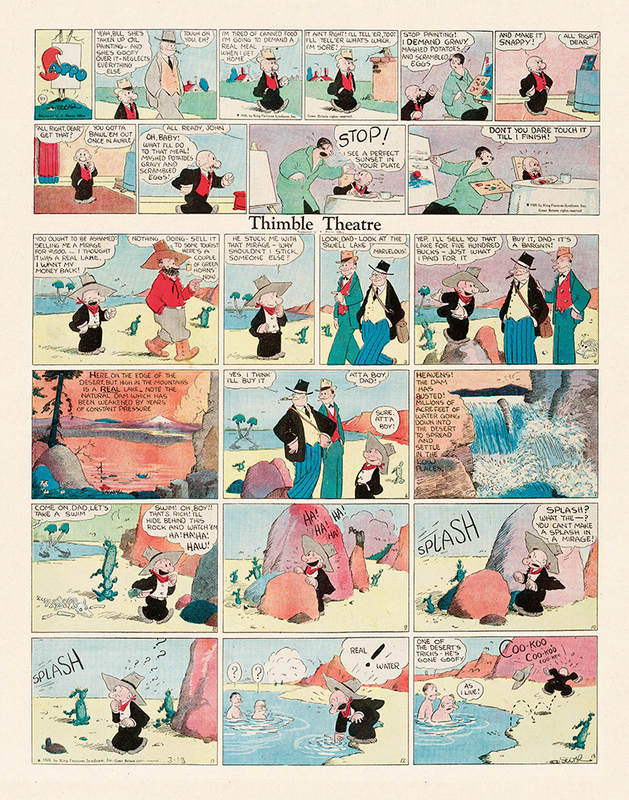 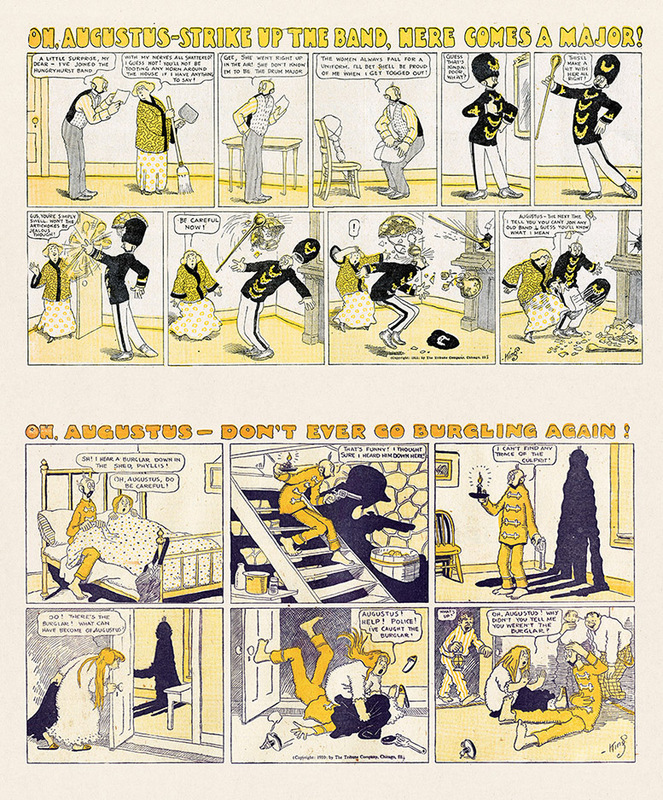 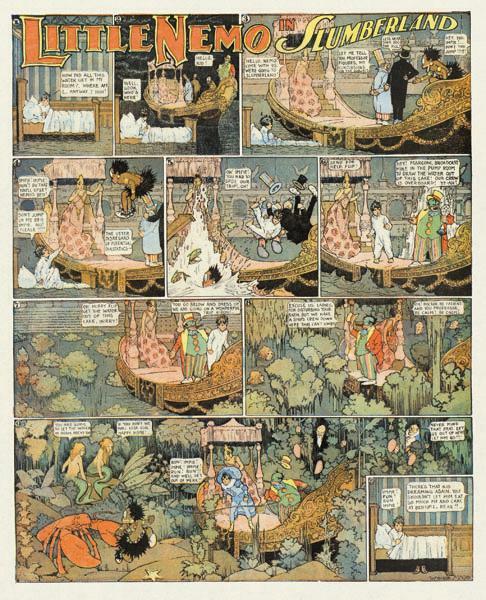 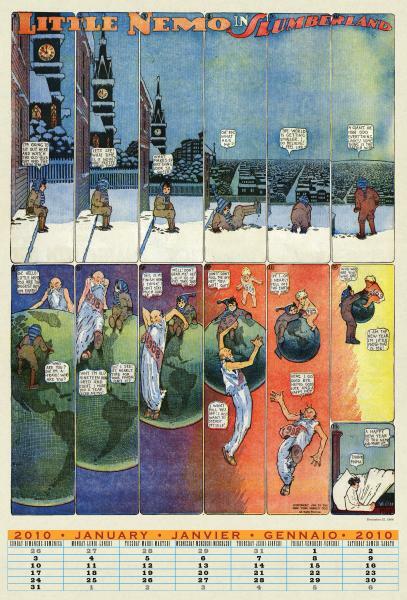 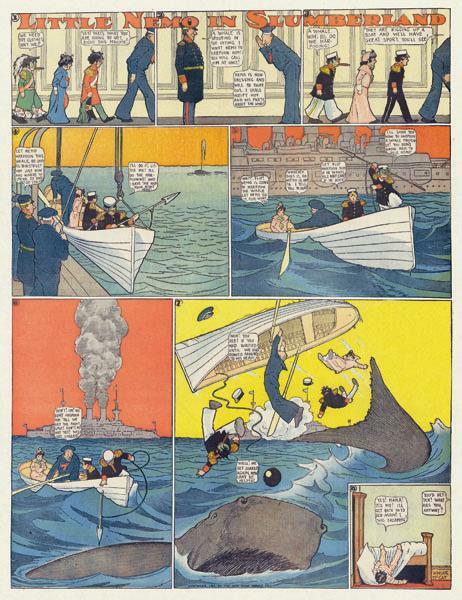 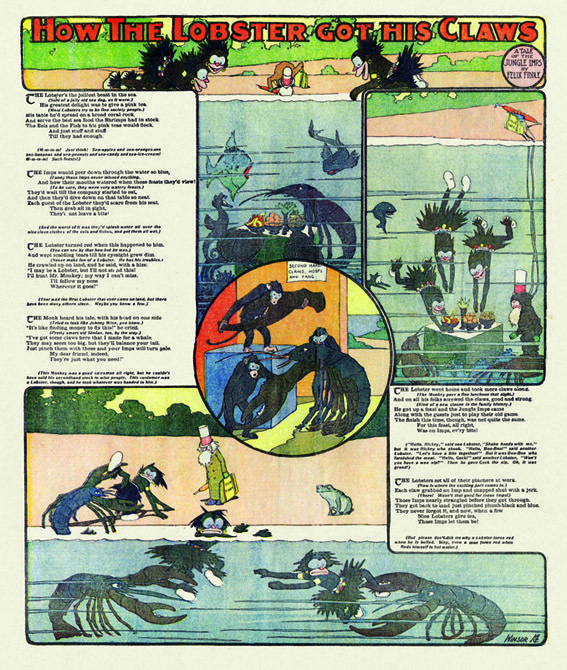 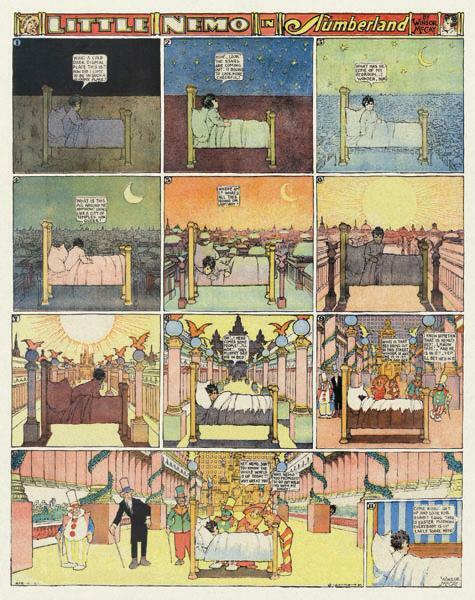 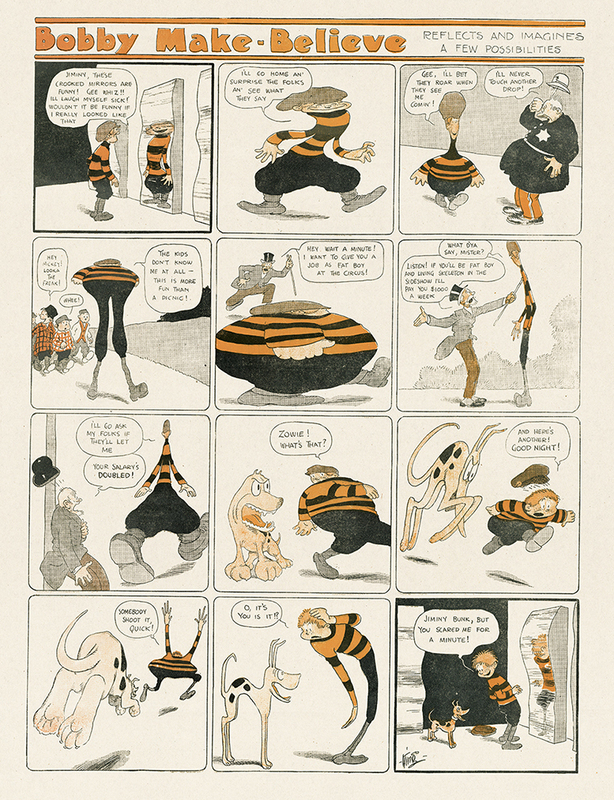 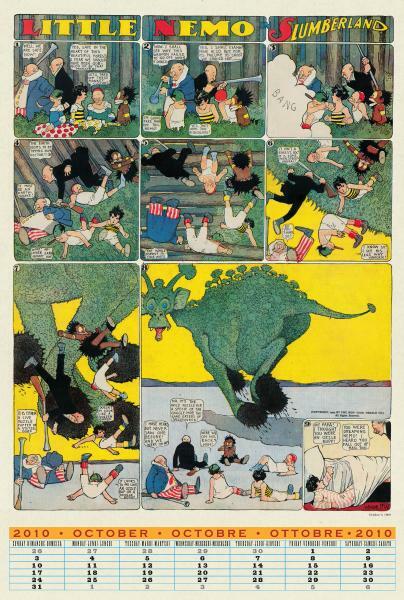 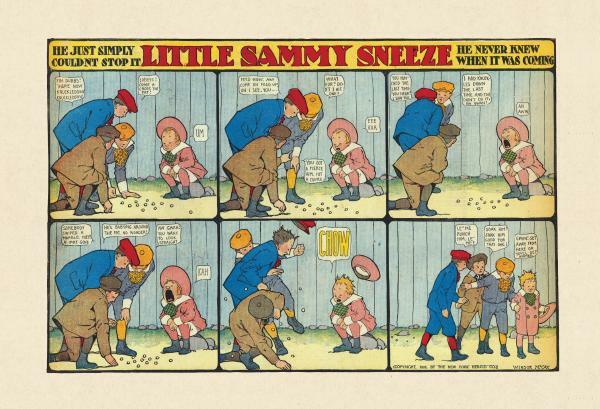 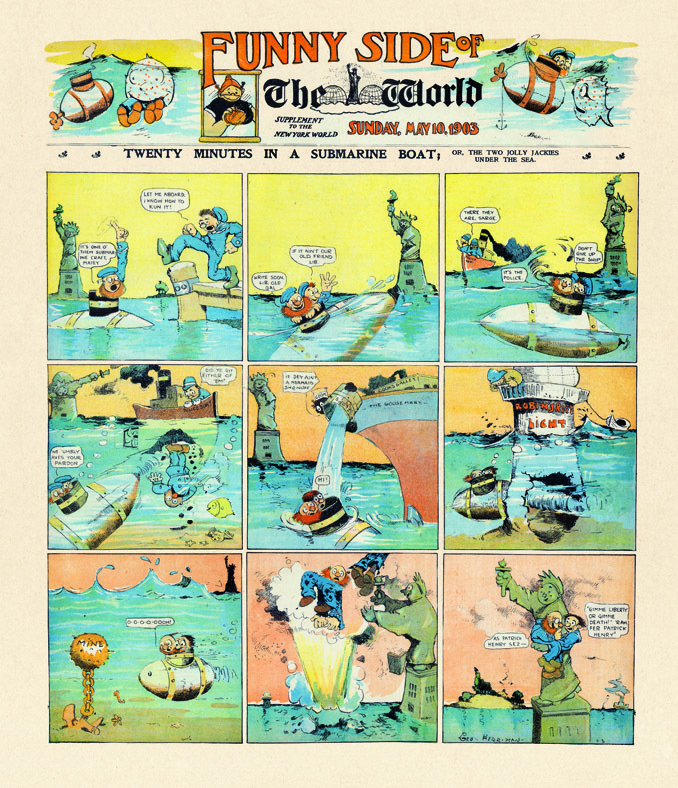 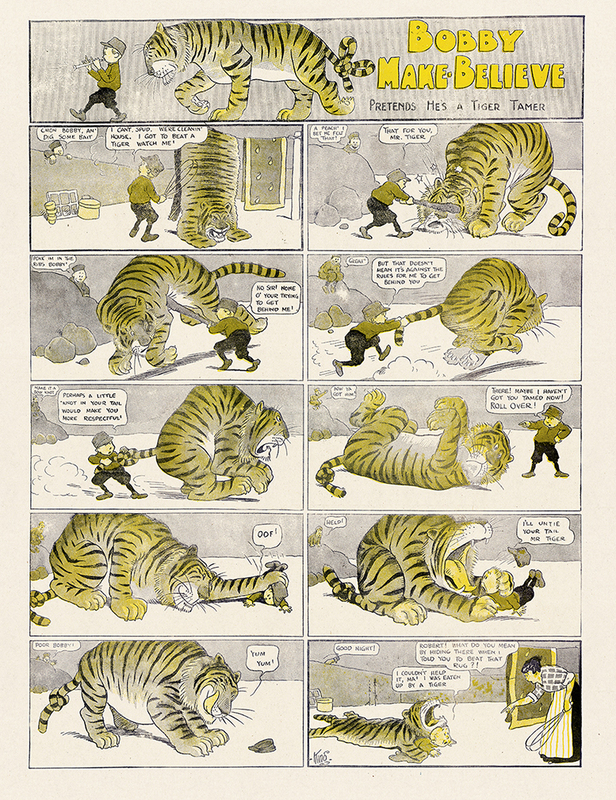 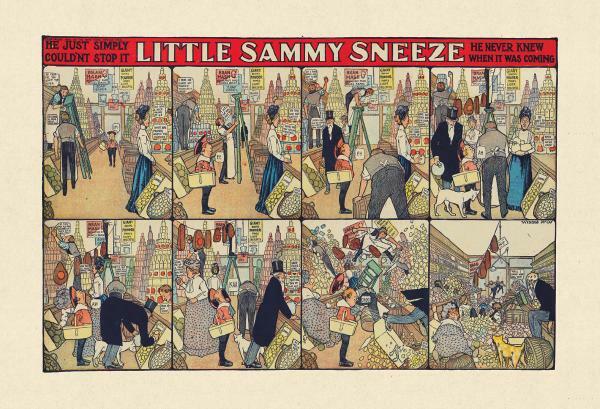 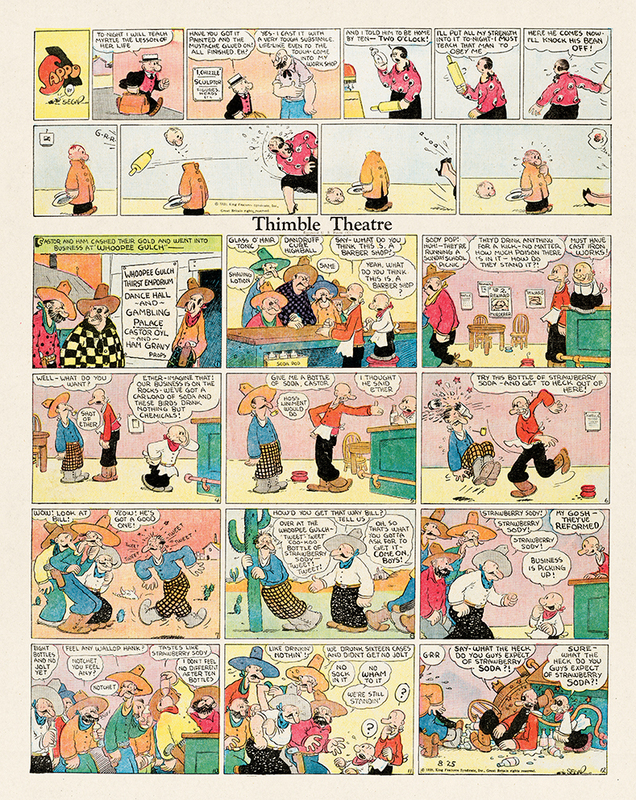 Reprinted in full color for the first time since 1904! 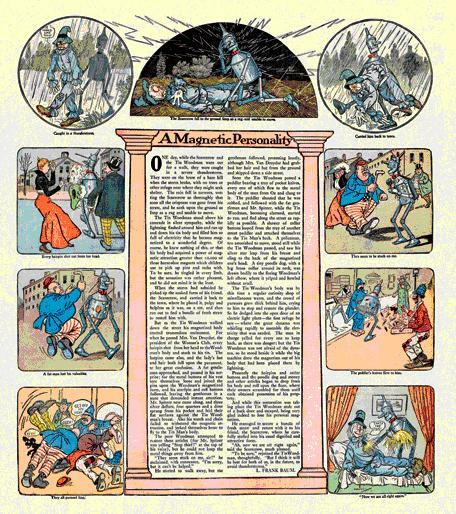 At the dawn of the 20th century, L. Frank Baum created a world of wonders that was to hold a permanent place in the culture of America: The Wonderful Wizard of Oz . 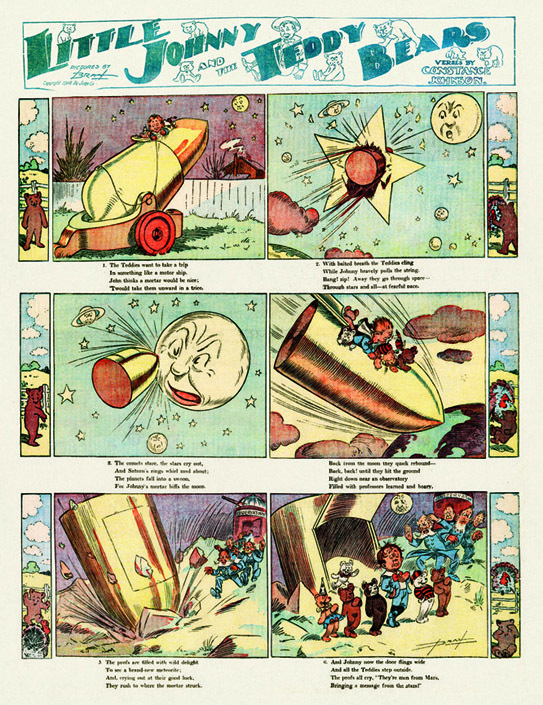 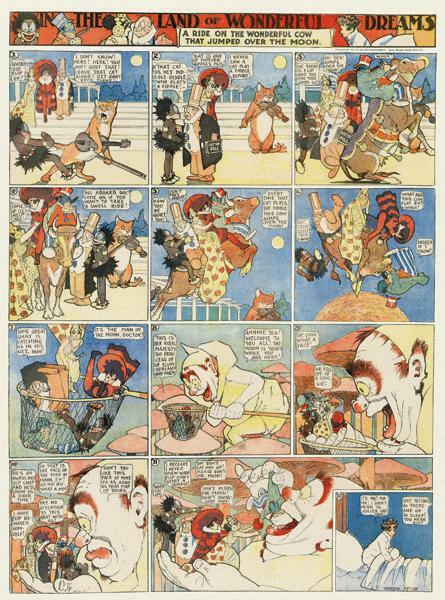 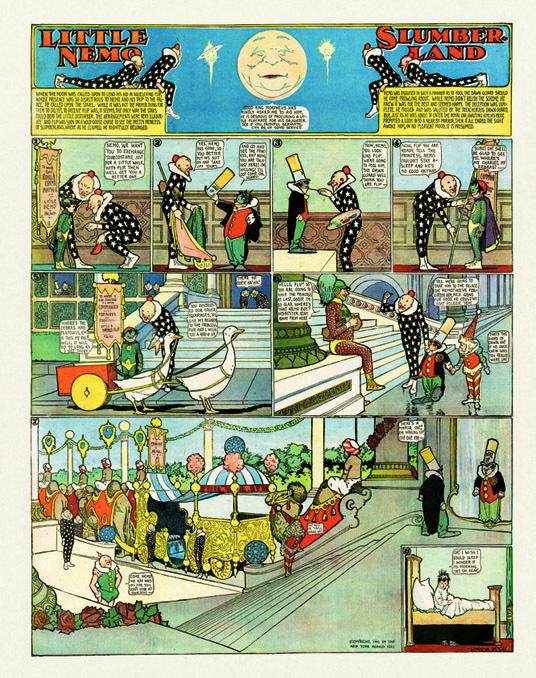 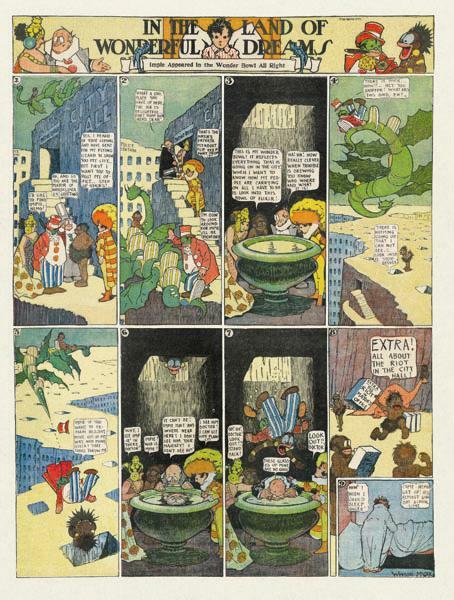 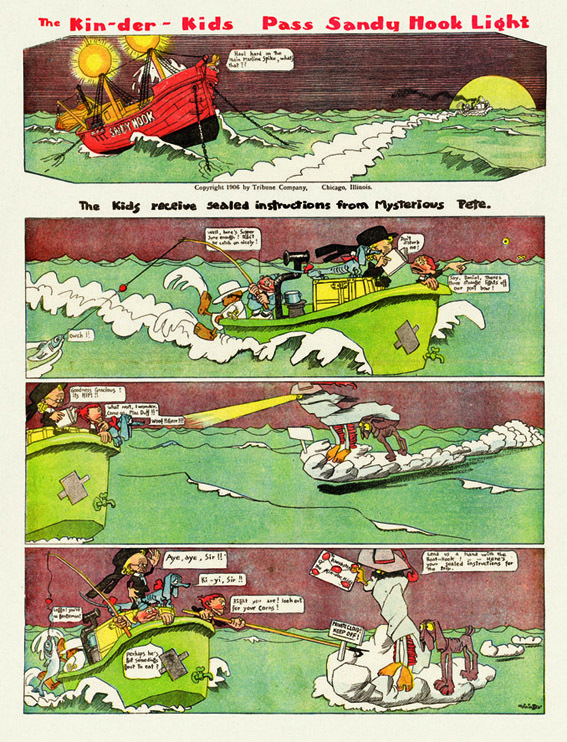 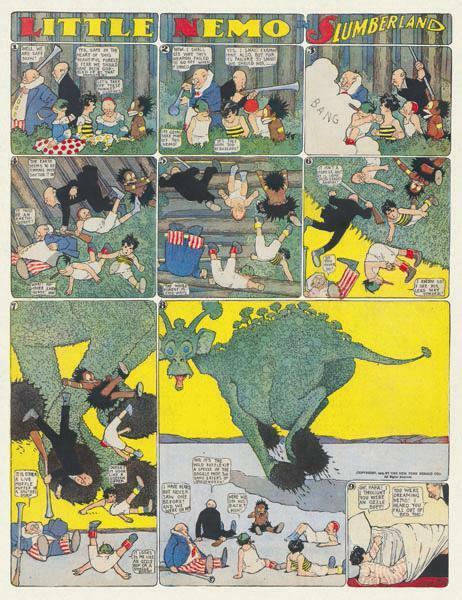 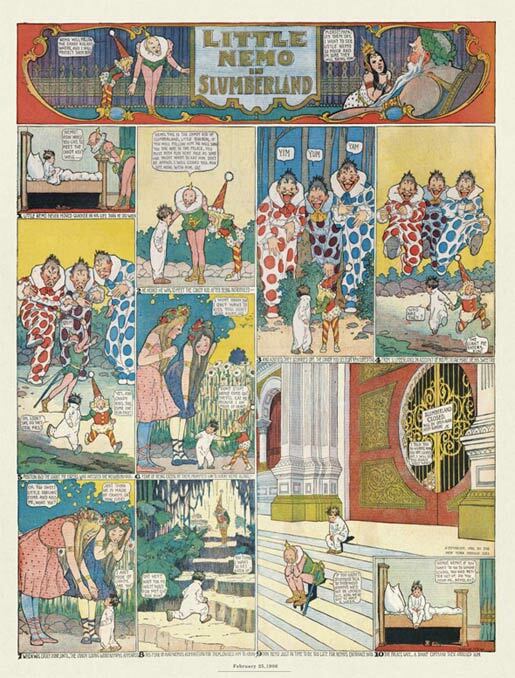 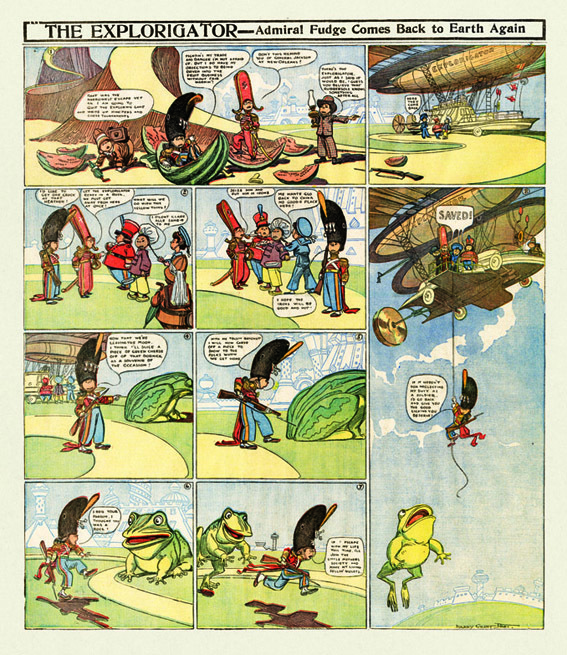 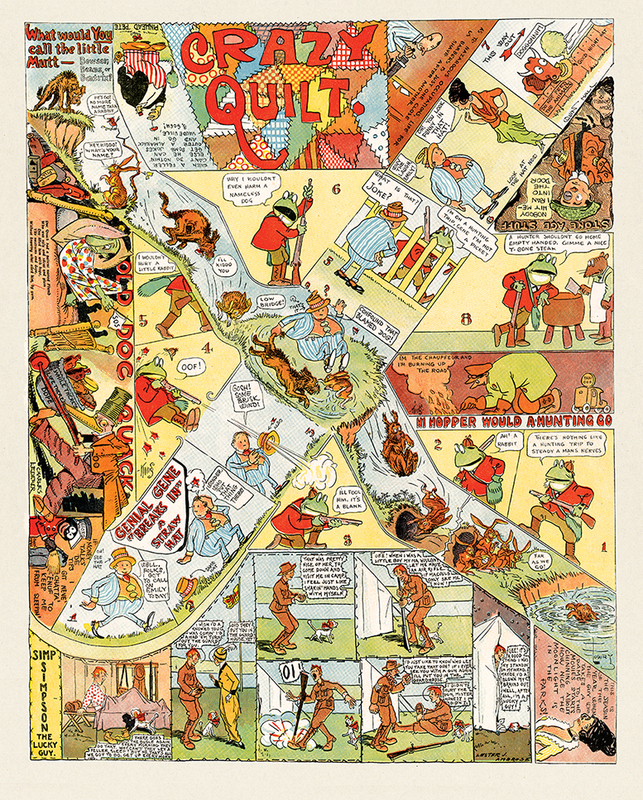 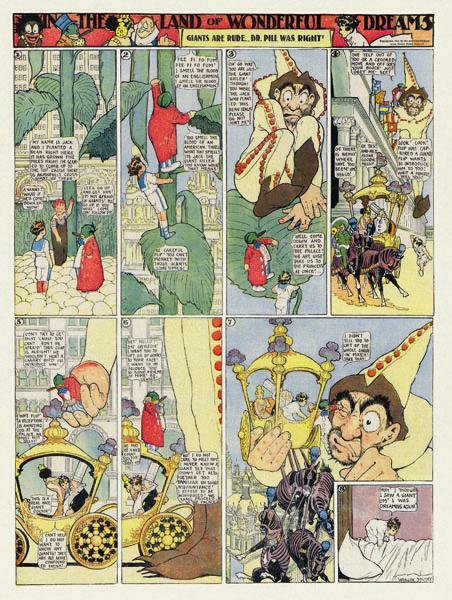 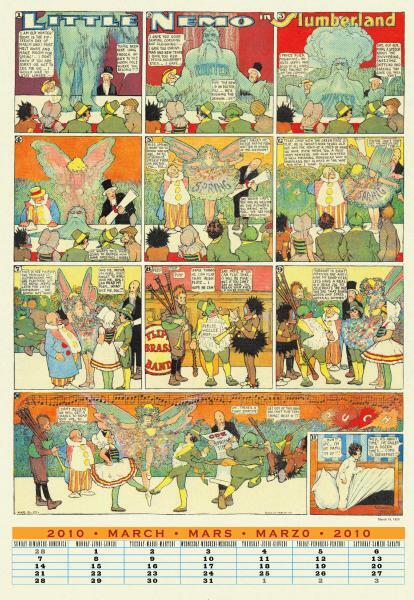 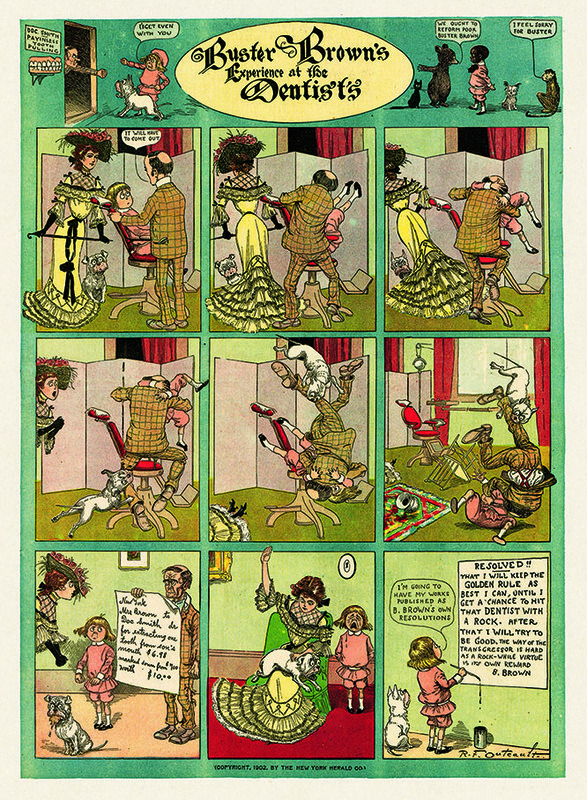 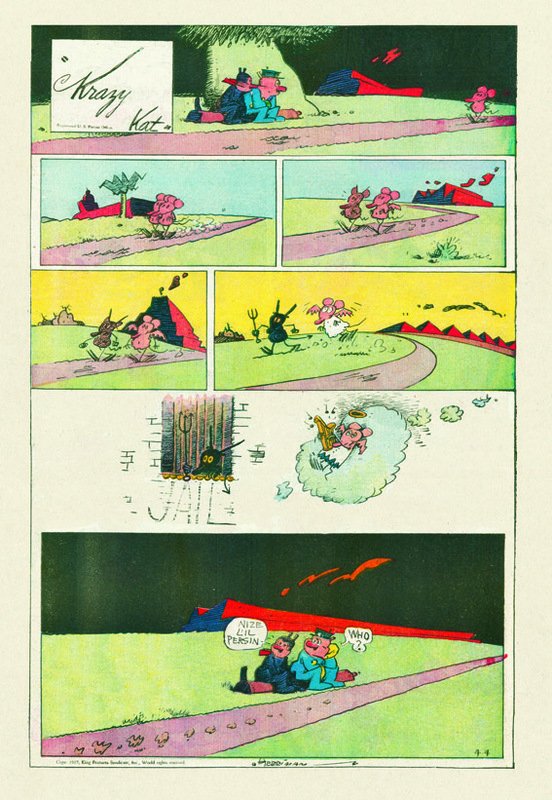 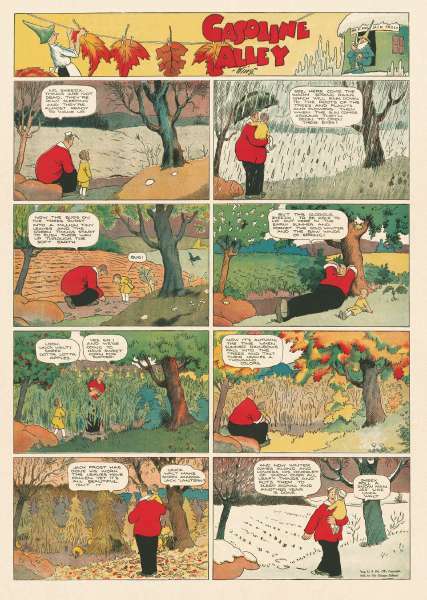 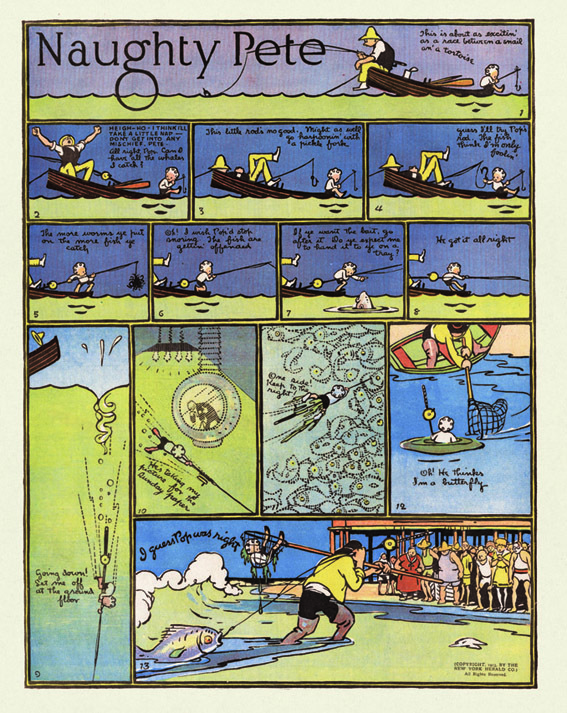 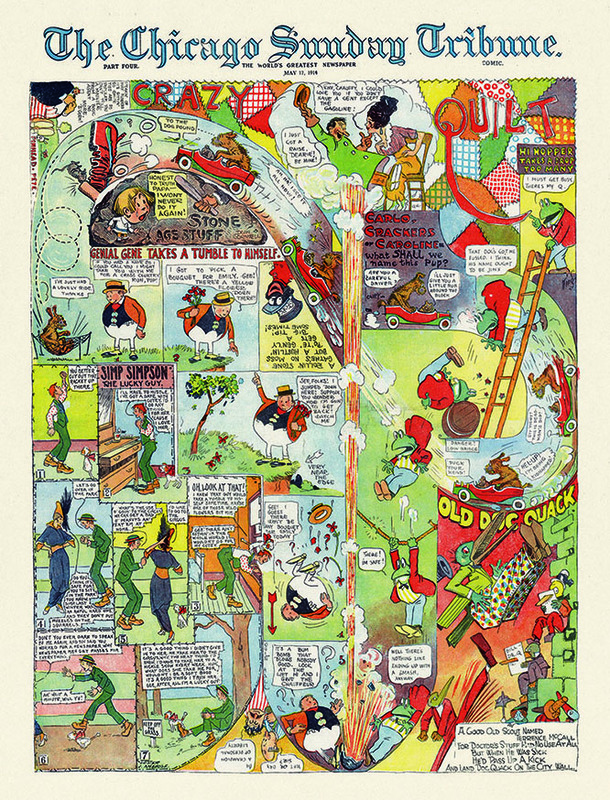 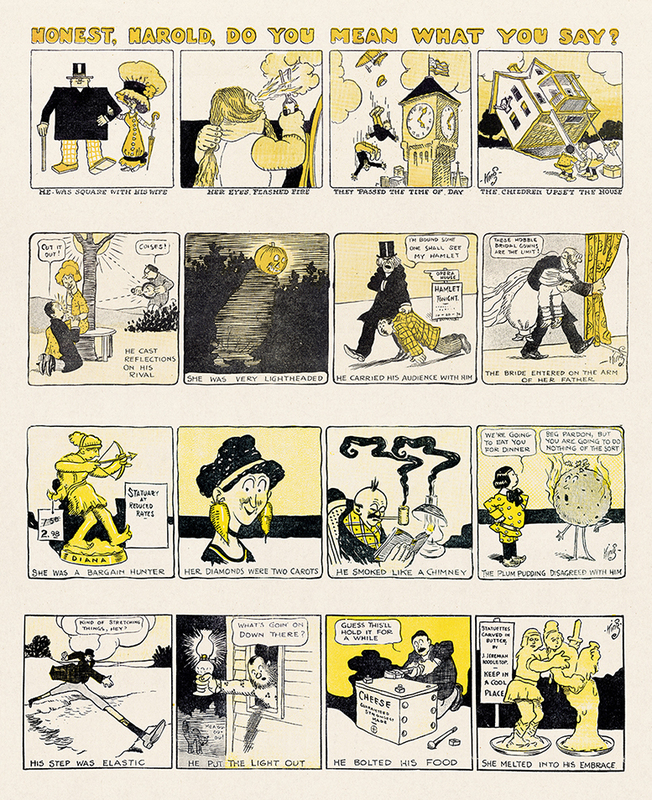 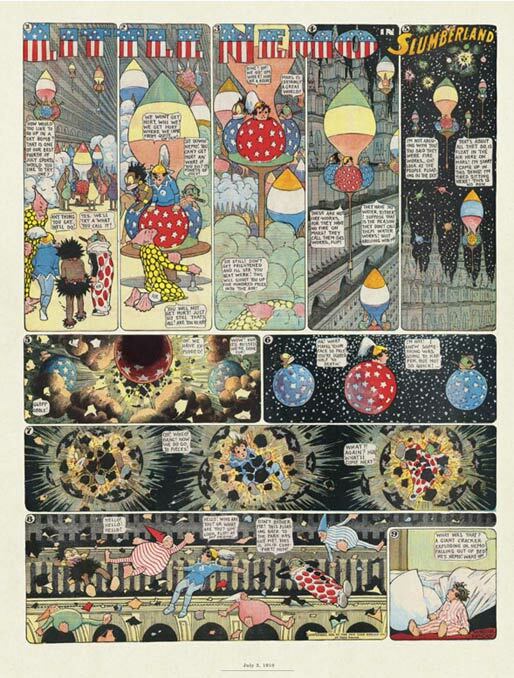 Then in 1904, to promote his second book, Baum, along with master cartoonist Walt McDougall, brought his famed characters to Earth in a new medium, the comic strip. 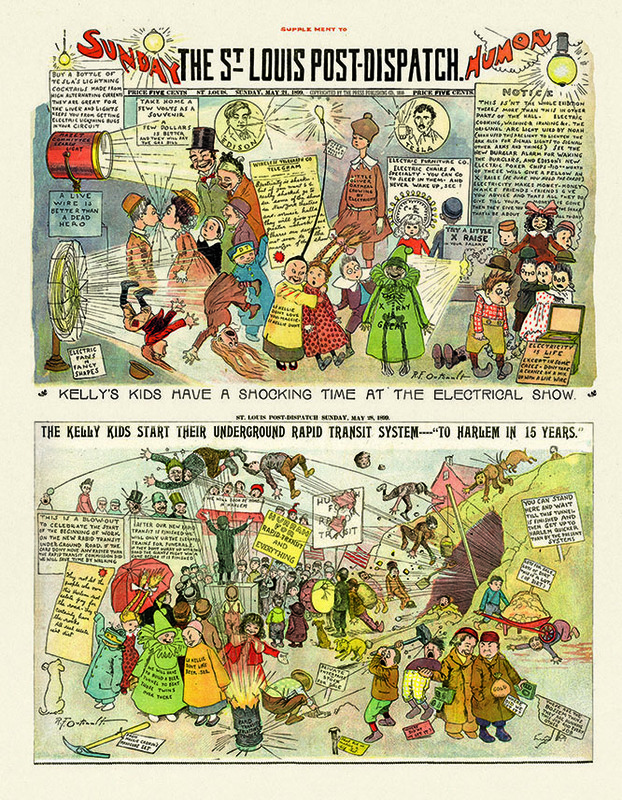 Queer Visitors from Marvelous Land of Oz had arrived. 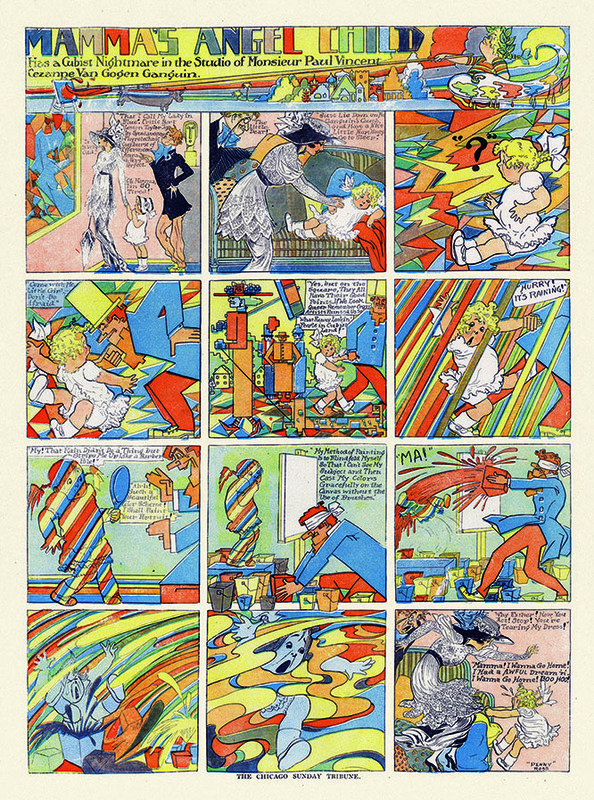 At this same time, Oz illustrator W.W. Denslow, offered his own Sunday feature, Scarecrow and the Tinman. 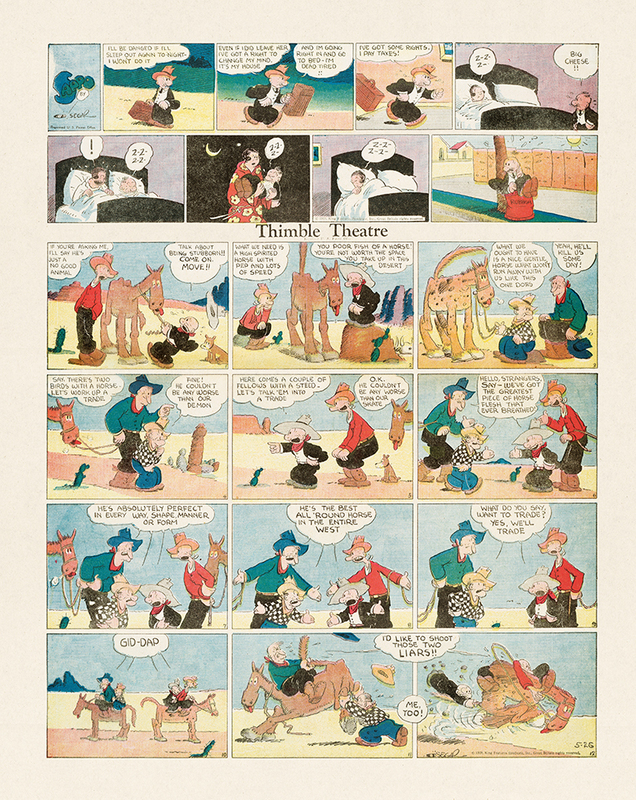 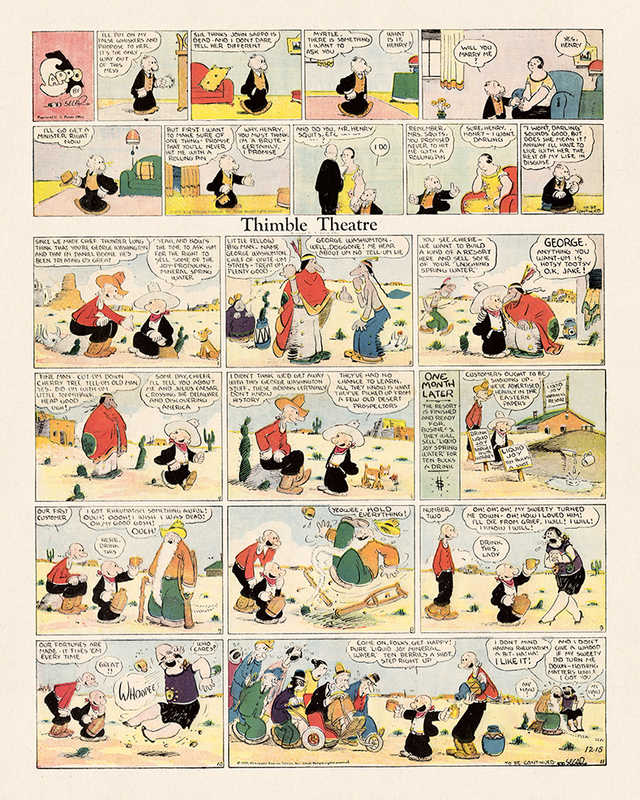 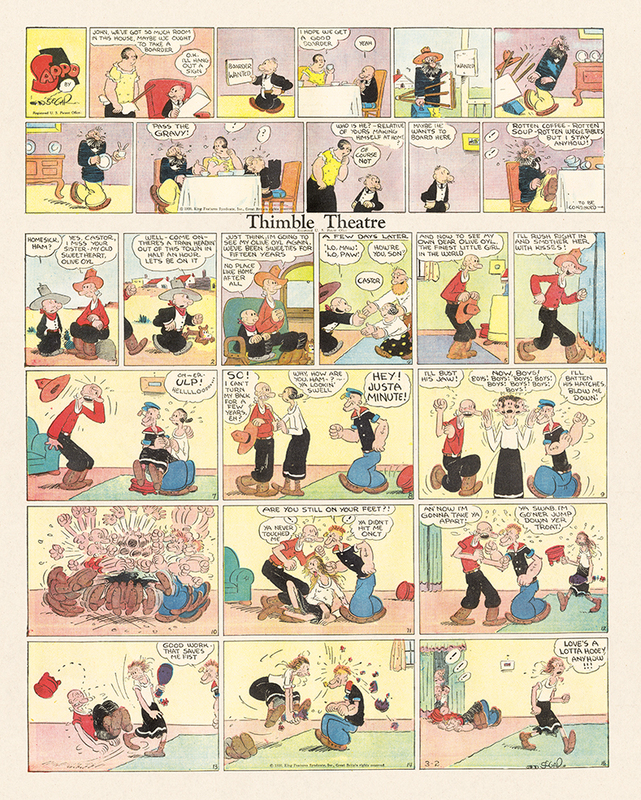 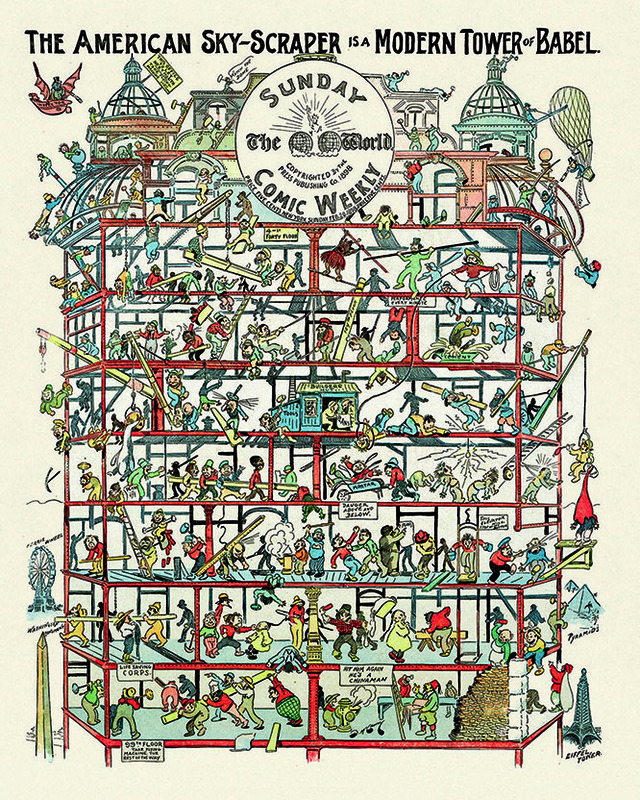 Now both of these rare cartoon features are collected for the first time, magnificently restored and presented in full broadsheet size. 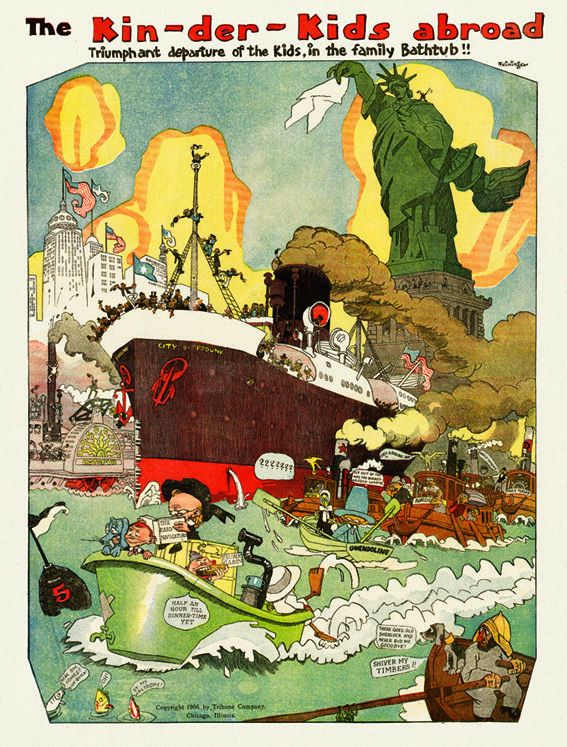 Join these timeless characters and explore the culture that was America over 100 years ago. 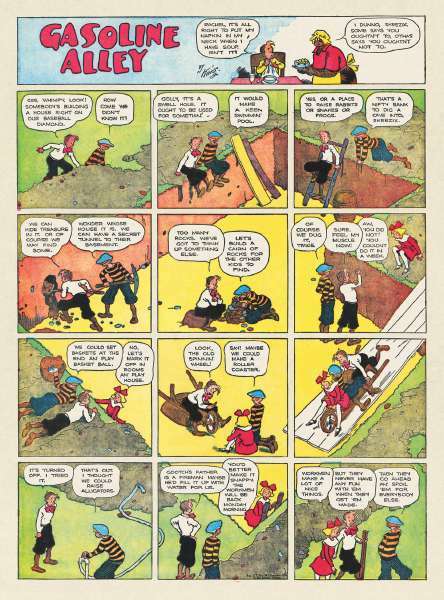 You surely won't be in Kansas (or anyplace like it) anymore! 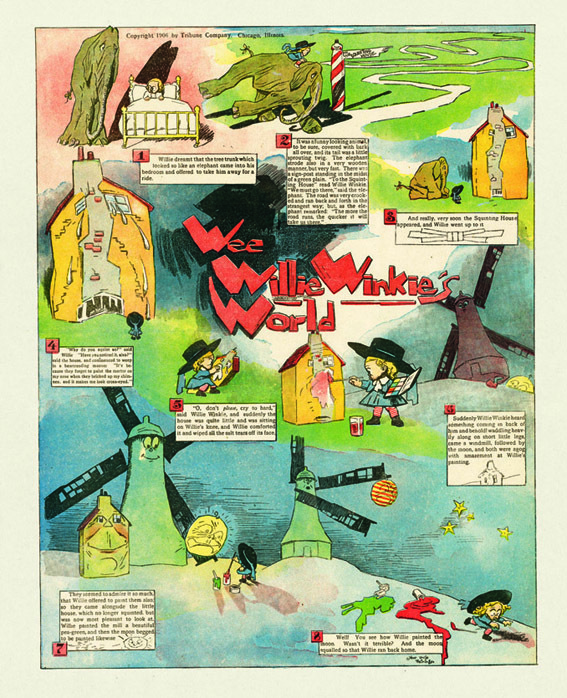 Like most of my generation, I was introduced to the world of Oz through television broadcasts of the 1939 film, The Wizard of Oz . 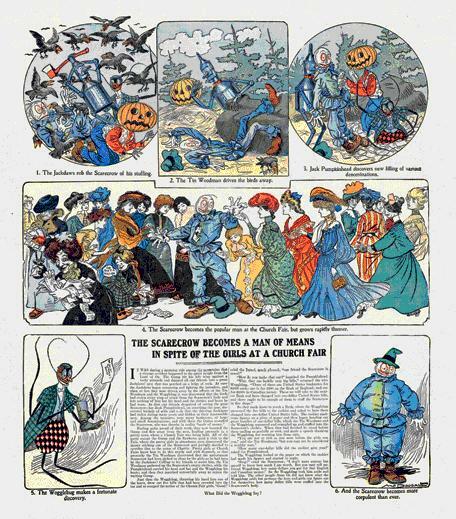 It was an eagerly awaited event, appearing only once each year. 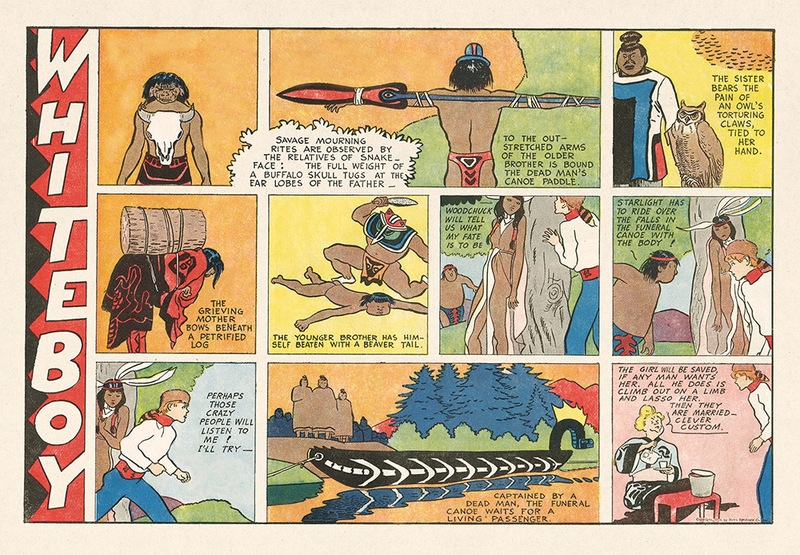 This shared cultural experience had much in common with the Sunday pages in this book. 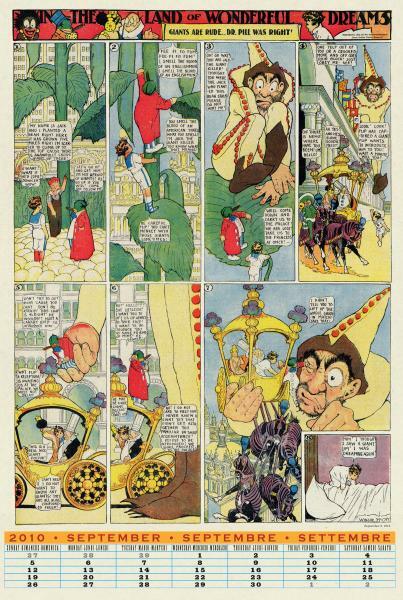 At the dawn of the 20th century, readers across the country enjoyed this continuing illustrated adventure - a new episode each Sunday. 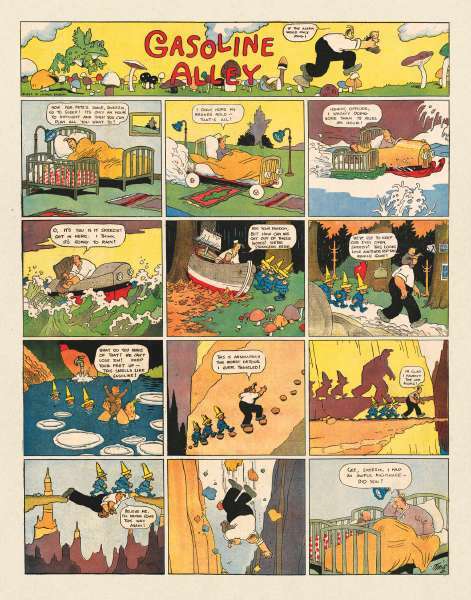 And just as home video can now replicate the 1939 theatrical film experience, this book recreates the experience of reading Oz stories in the Sunday newspaper comics of 1904-05. 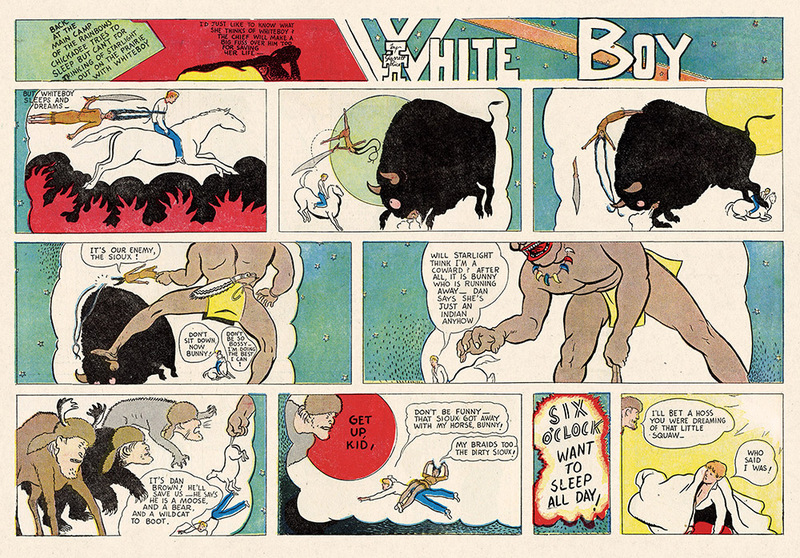 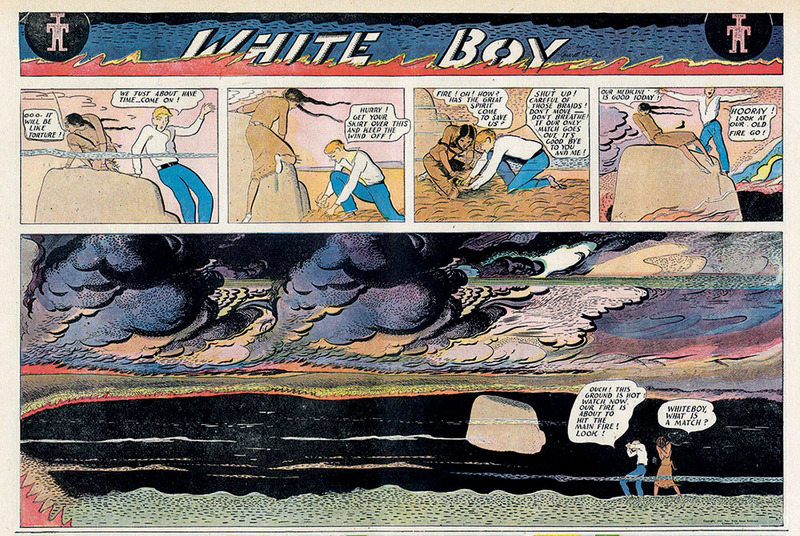 Although relatively unknown in the world of comics, Queer Visitors from the Marvelous Land of Oz plays an important part in the history of the comic strip. 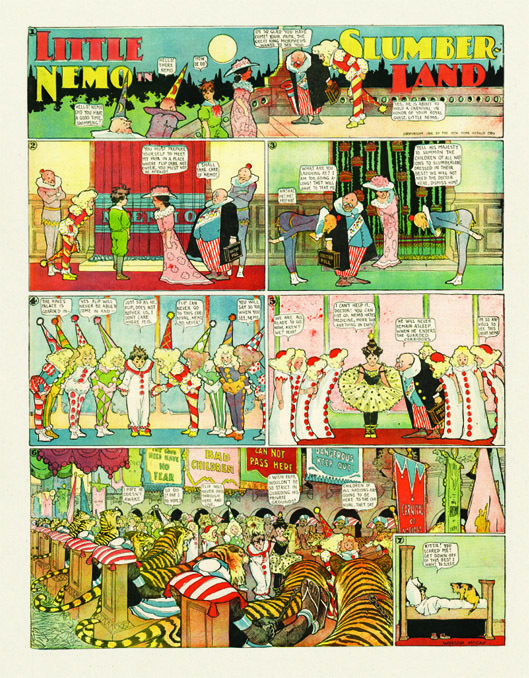 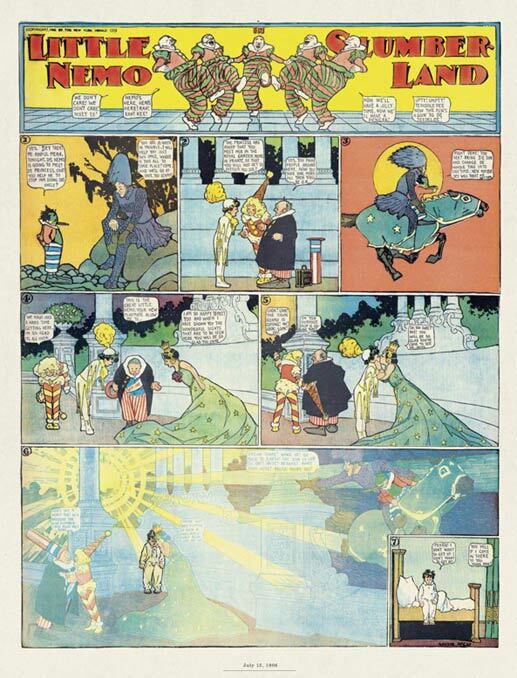 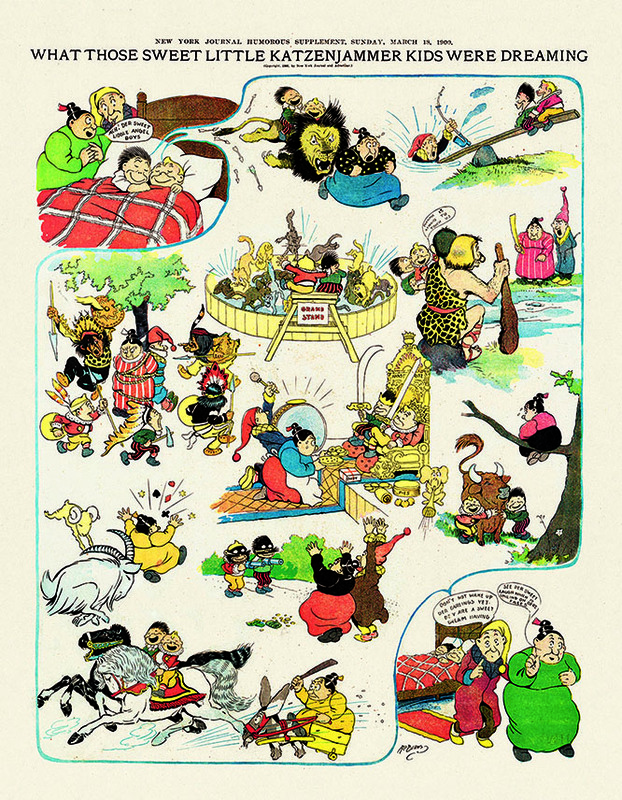 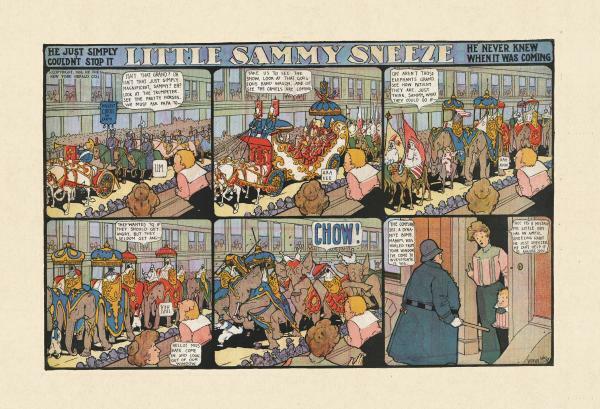 It was the first ongoing strip to be based on a current work of popular fiction, and the first to be a promotional tool - a marketing vehicle for Baum's upcoming sequel to his tremendously successful Wizard of Oz. 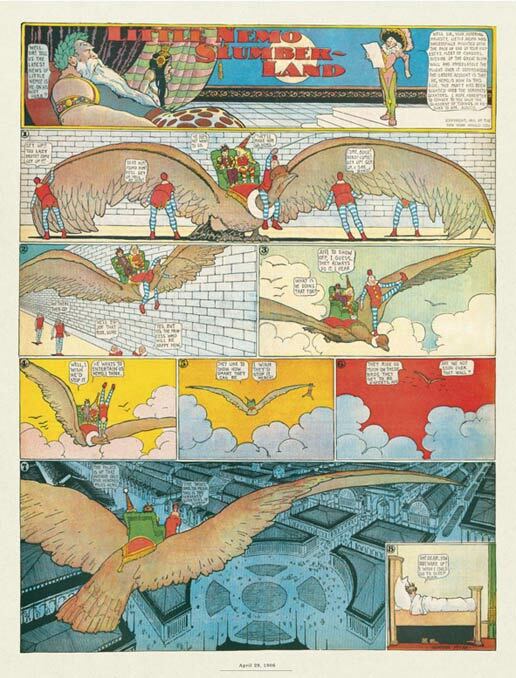 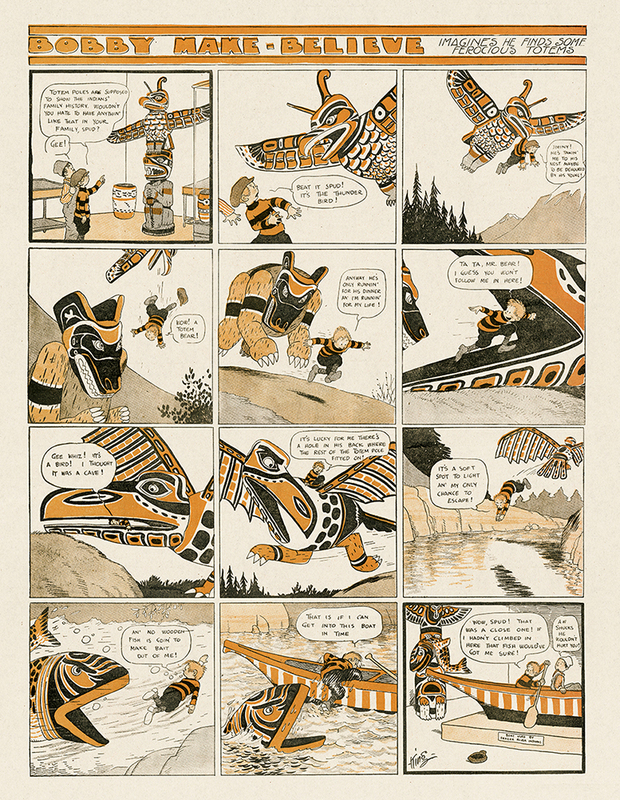 Complimenting Baum's delightful tales in Visitors , the detailed drawing and unique layouts by McDougall offer a series of undiscovered treasures of early comic art. 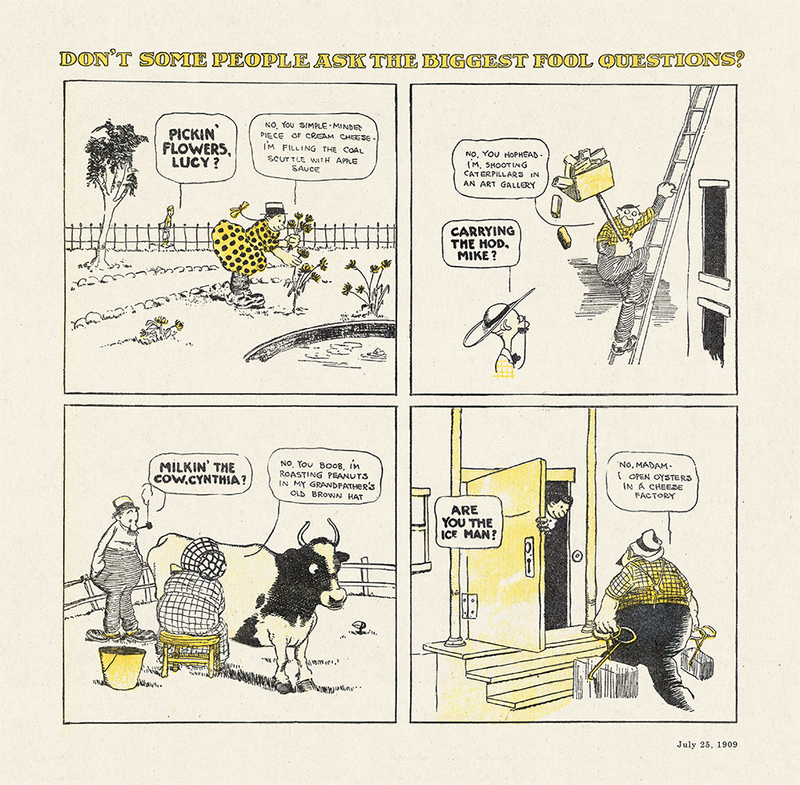 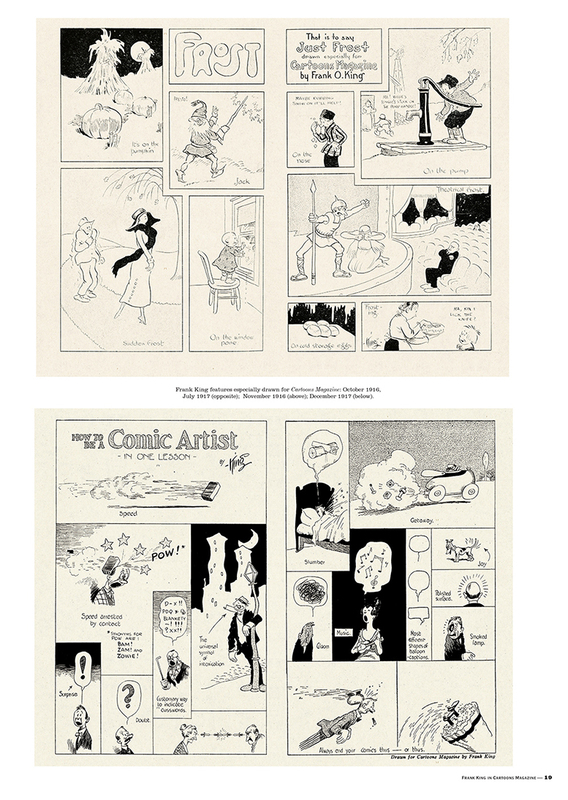 Each page is a curious hybrid of illustrated stories and the new medium of newspaper comics; with text, captions and balloons and art all telling the story. 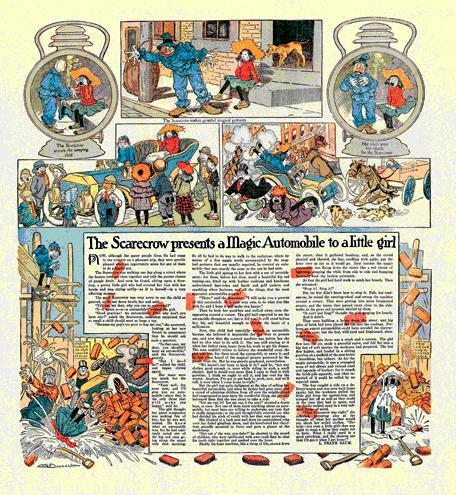 The competing Oz Sunday feature in this book, Scarecrow and the Tinman , is less known than Visitors , due to limited syndication, and displays the stunning artwork of W.W. Denslow. 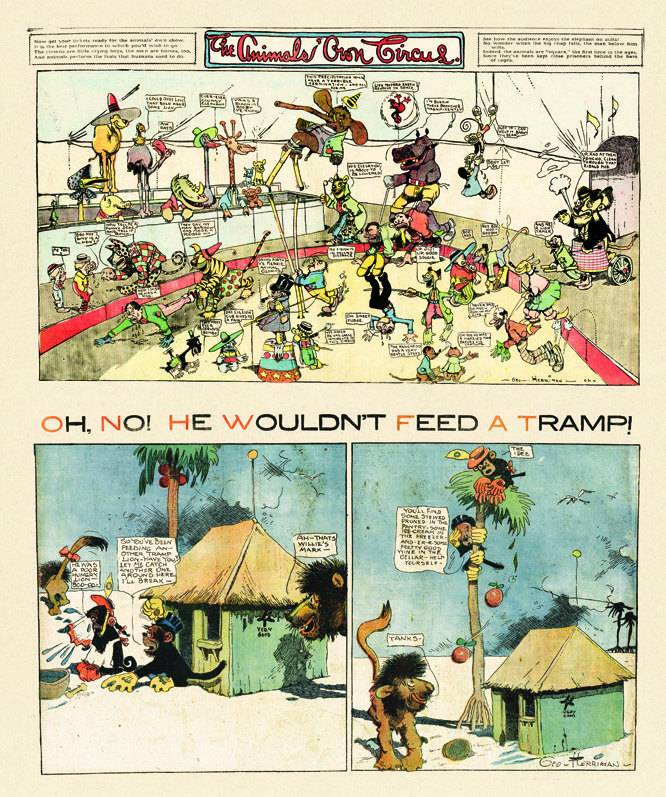 His illustrations for the first OZ book, in their simplicity and expressiveness, show a sophisticated comic-art style ahead of its time. 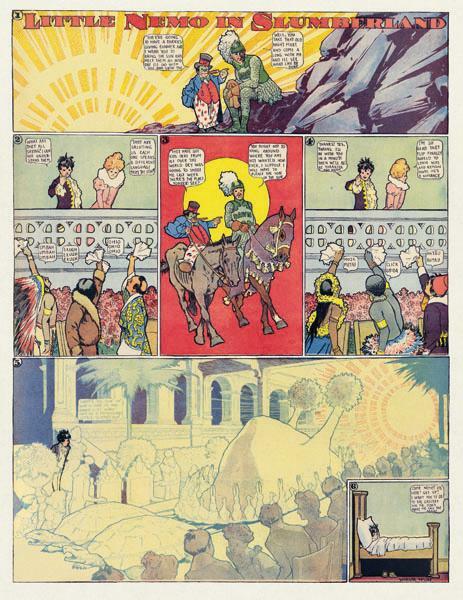 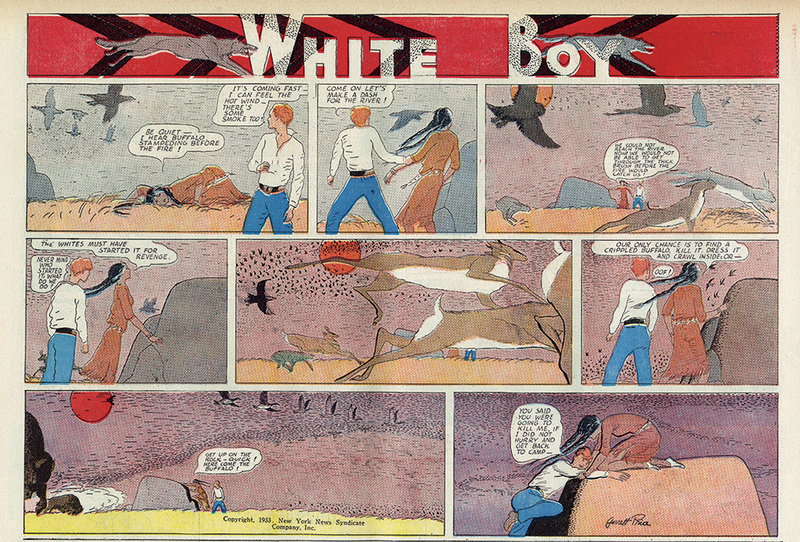 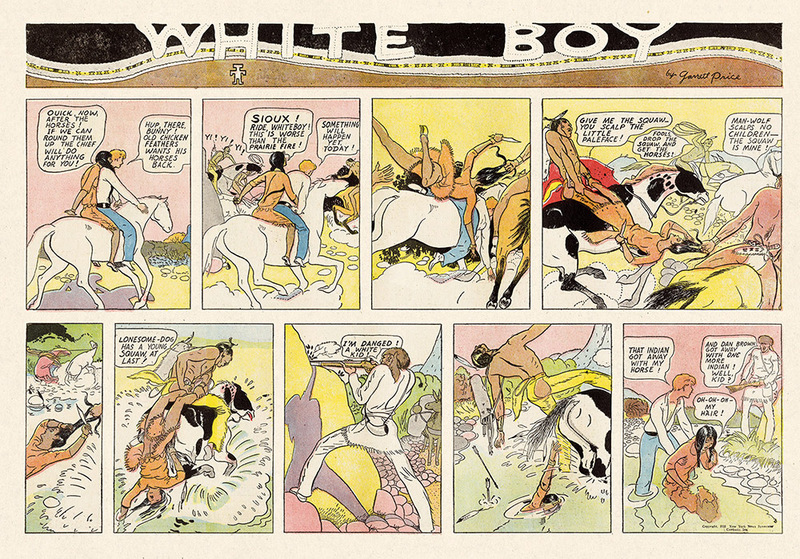 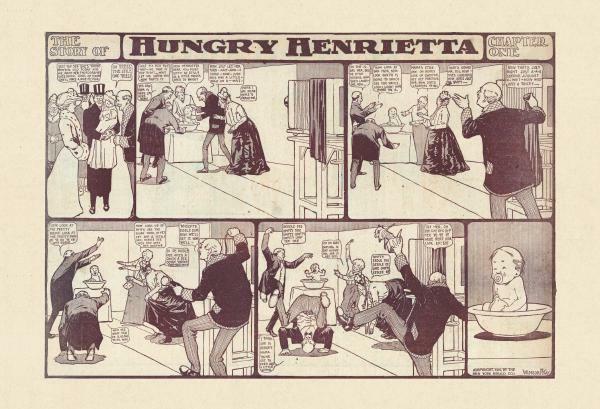 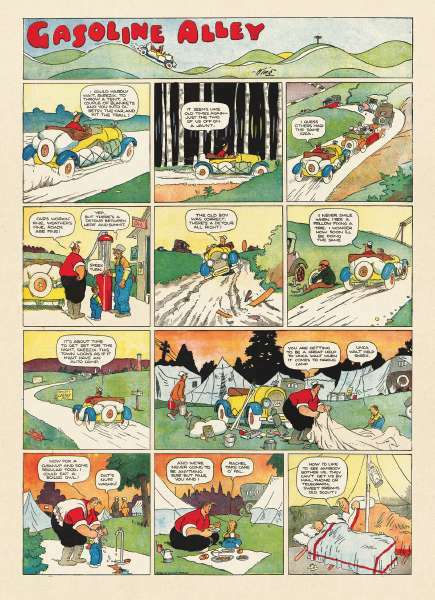 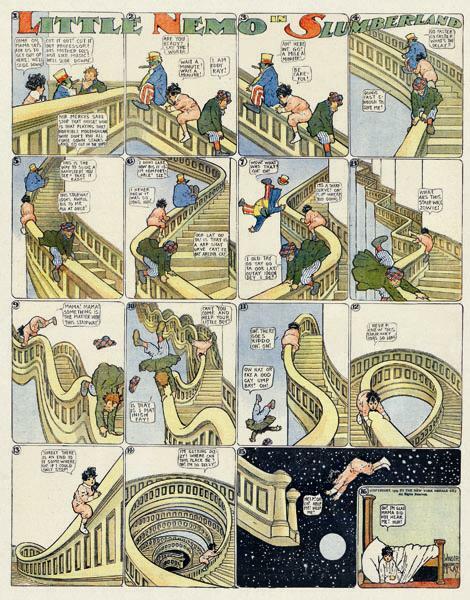 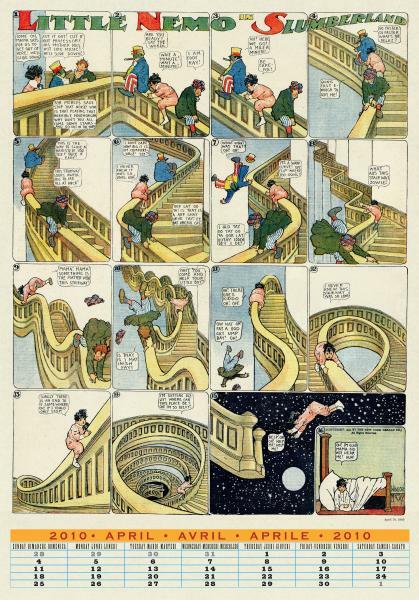 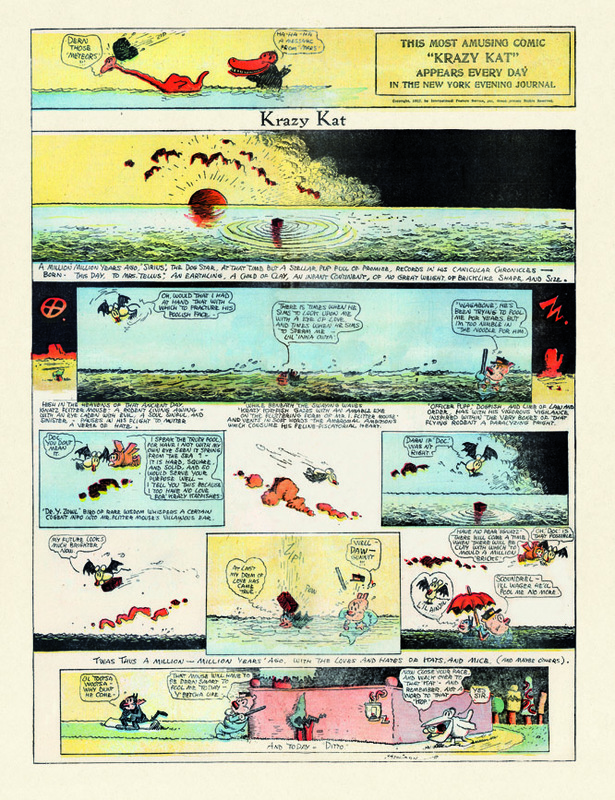 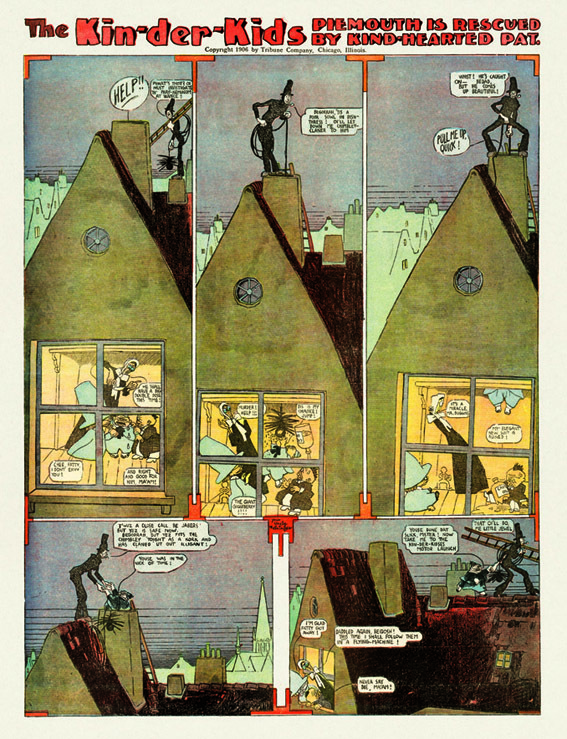 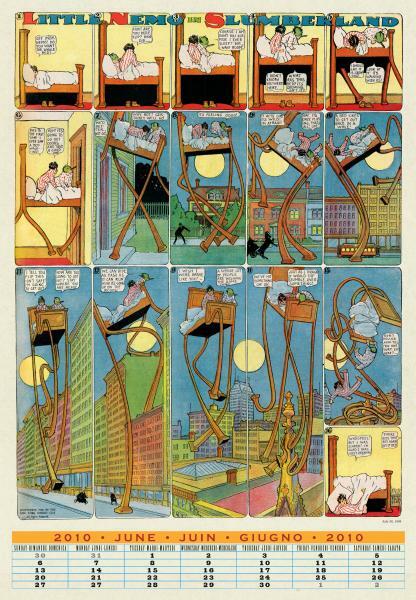 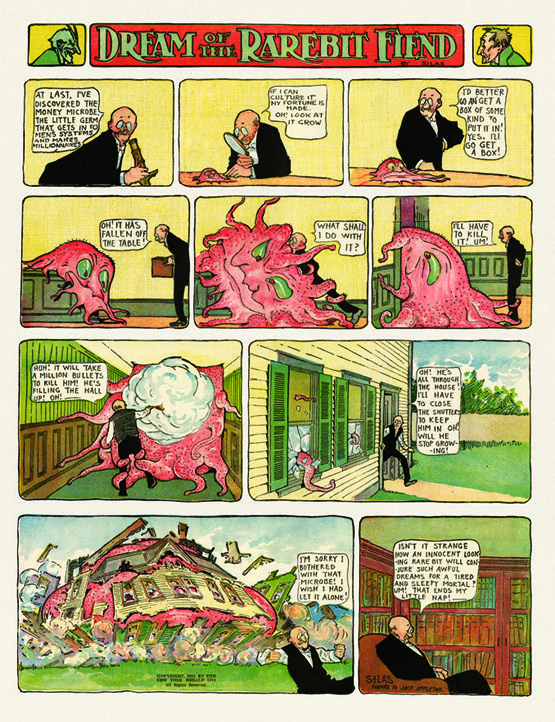 His work in comics from 1900-1905 was an inspiration to many comics creators in later years. 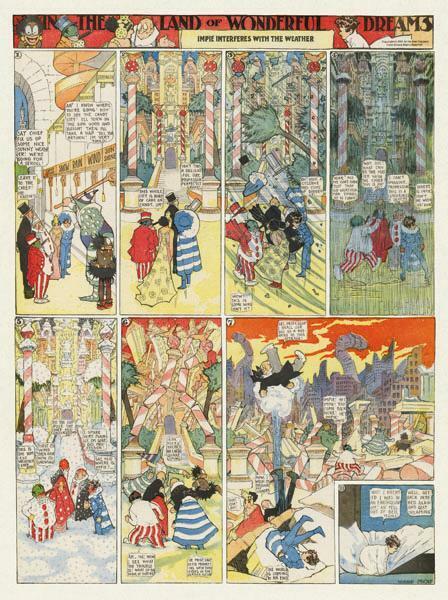 As with other Sunday Press collections, these pages are presented in the originally size and colors. 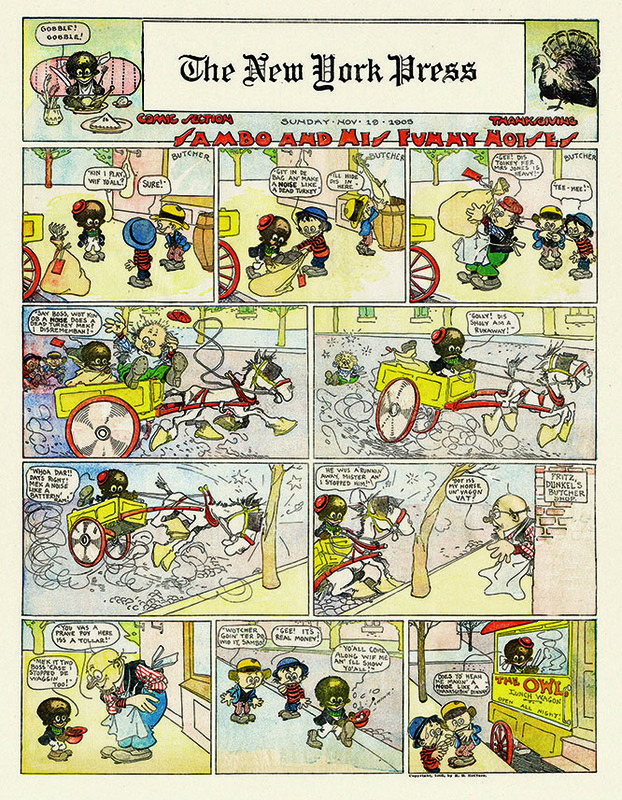 Most of the flaws and irregularities found in newsprint reproduction (ink smudges, off-register colors) remain, while those caused by time and mishandling (tears, excessive yellowing) have been repaired. 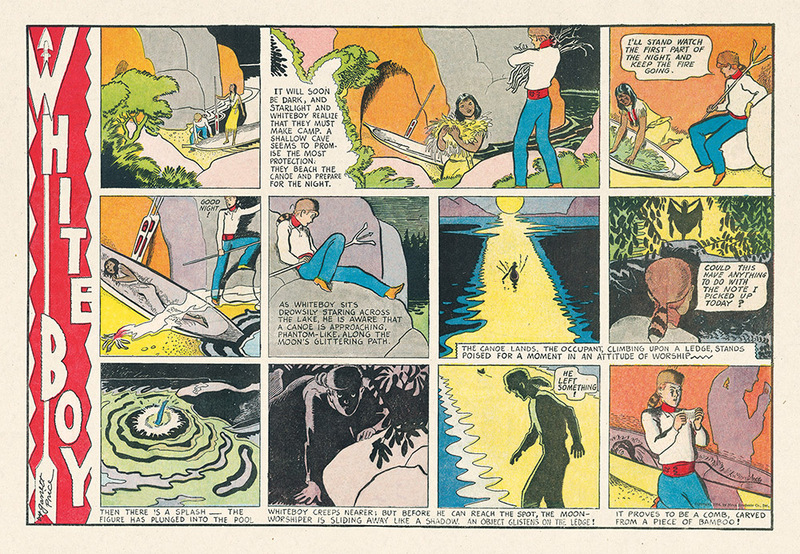 The result is a chance for Oz lovers and comics fans alike to experience these lost masterpieces as they were meant to be seen. 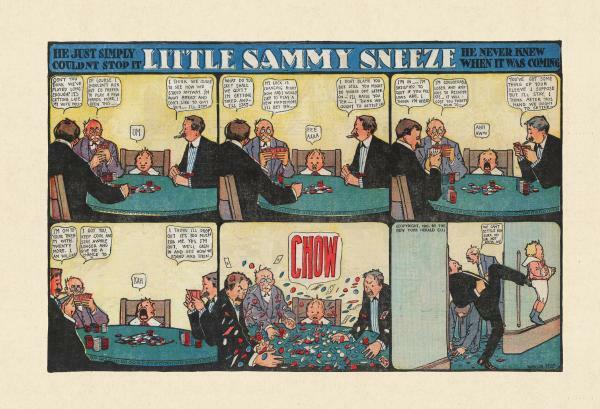 The children were gathered on the living room floor, Frank's four boys among them. 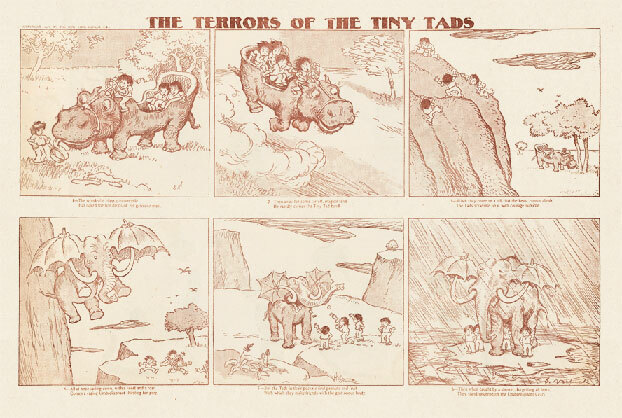 They were eager to hear more of the new story Frank had started to tell them. 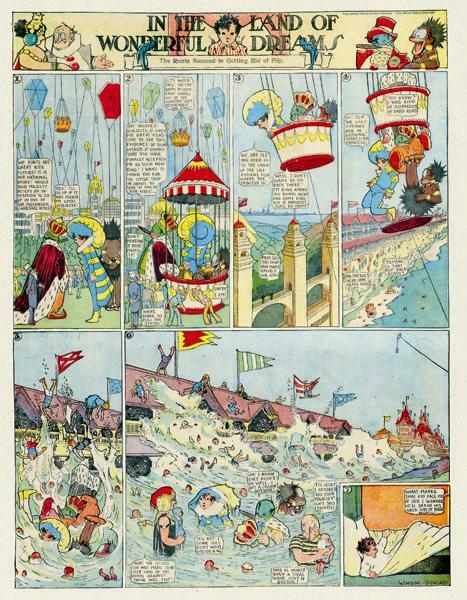 It was about a Kansas girl who, along with her dog, had traveled to a far away magic land after their house had been picked up by a tornado. 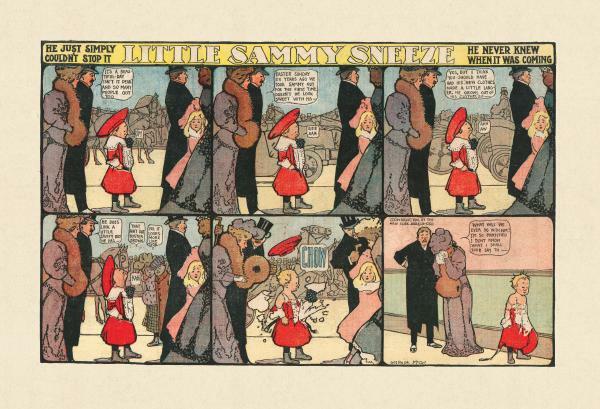 She had met some very small people who sent her off to see a wizard. 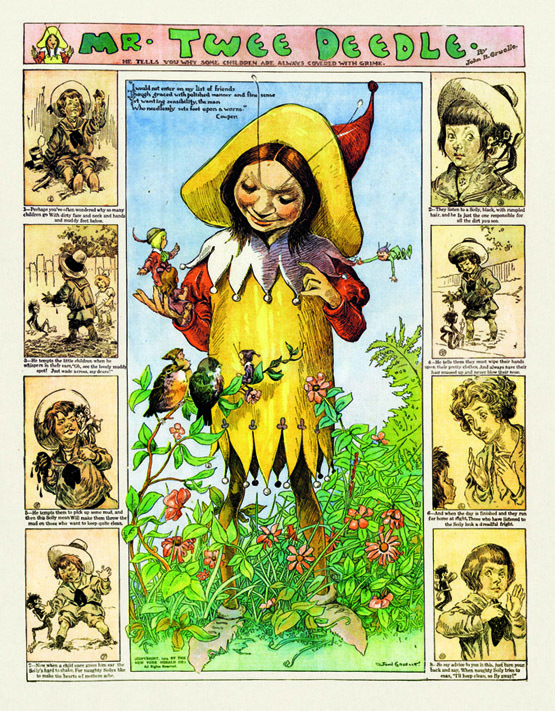 Along the way she met a man made of tin and a scarecrow that could talk. 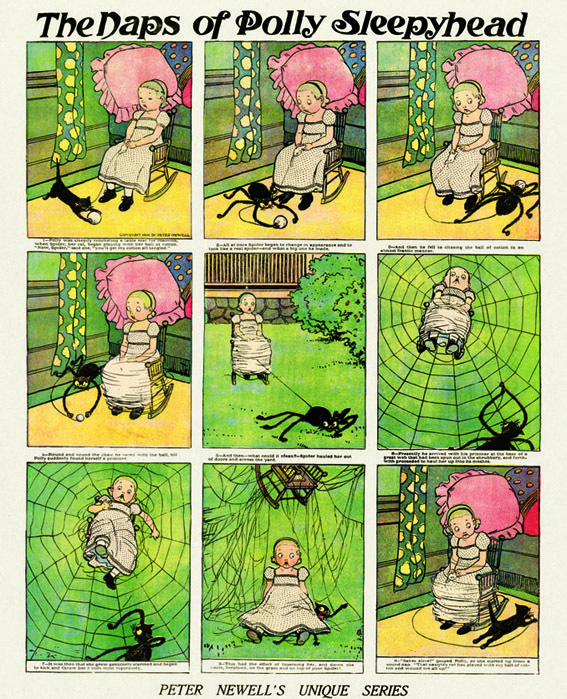 In last night's story, the three were traveling down the road made of yellow bricks. 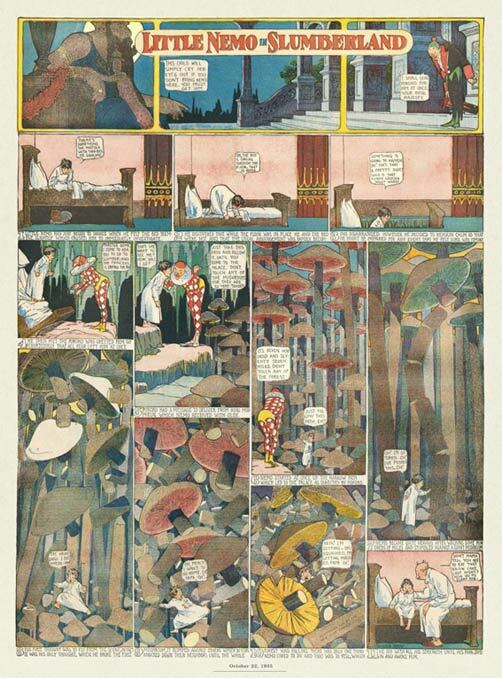 Frank leaned in to the children and began, "The Yellow Brick Road led them into a dark and scary forest. 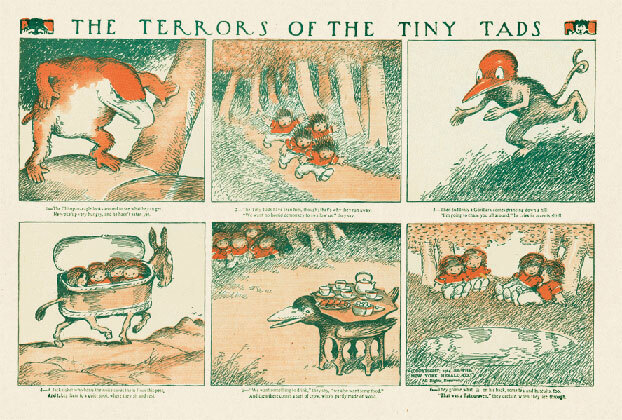 The further they walked into the forest, the darker it got. 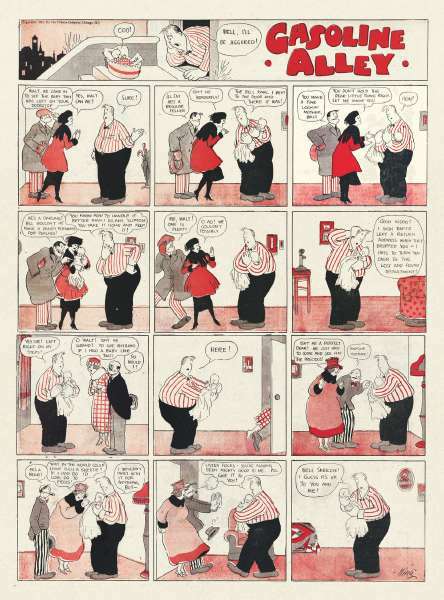 They held onto each other as they slowly kept walking. 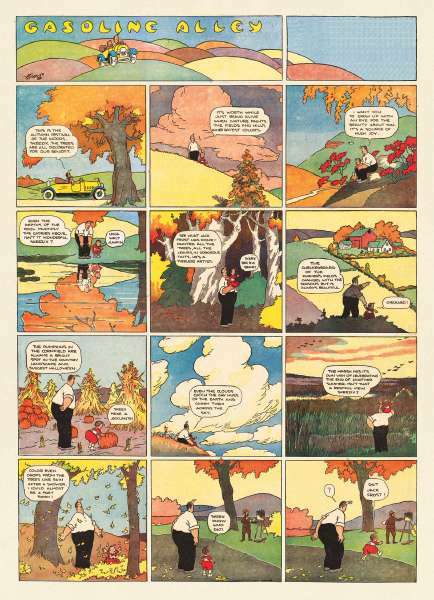 The trees almost looked like they were closing in on them, when...." Just then, one of the children asked, "Mr. Baum, Mr. Baum, where is this magic land?" 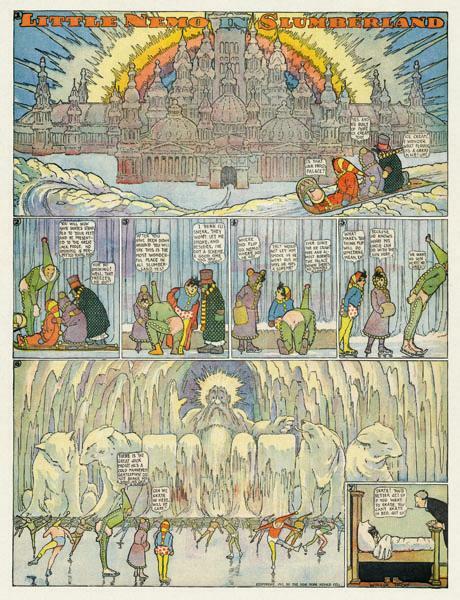 Even though Frank had been working on this story in his head for some time, the right name for the magic land had not yet come to him. 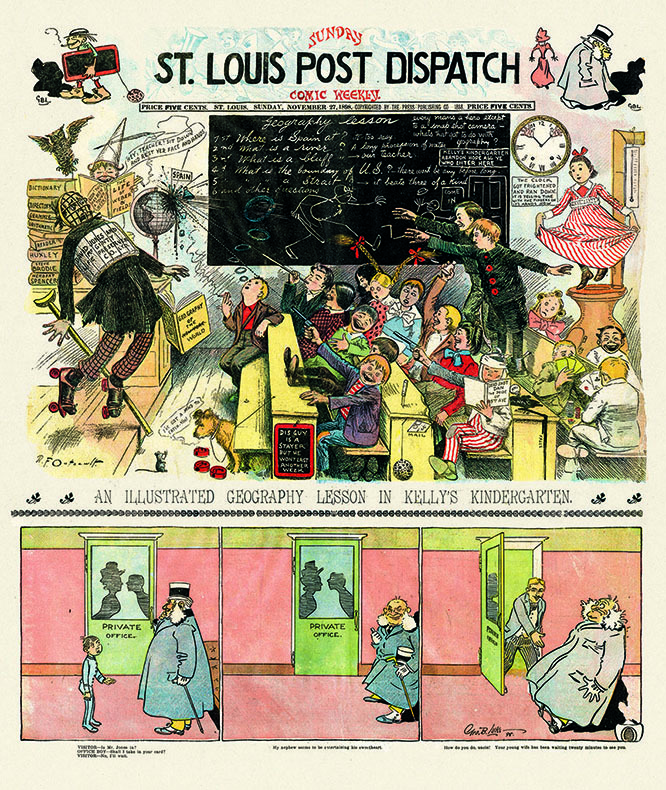 Looking around the room for the answer while still telling the story, he soon noticed his office filing cabinet in the next room. 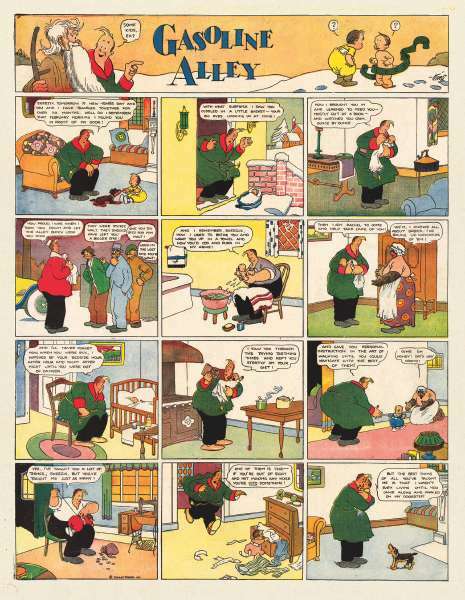 The top drawer was labeled A - N and the bottom drawer was labeled, well ...let Frank tell you. 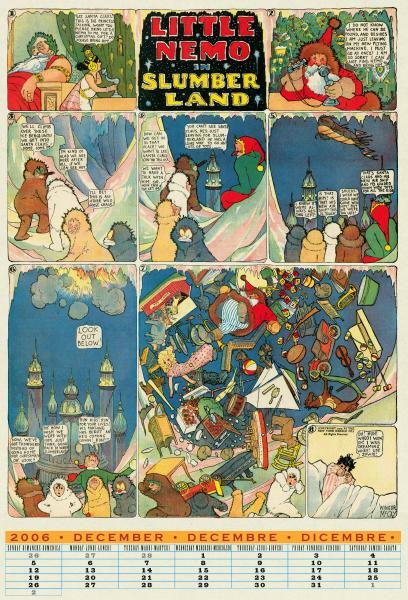 "Why it is called the Land of Oz," he said, smiling to himself. 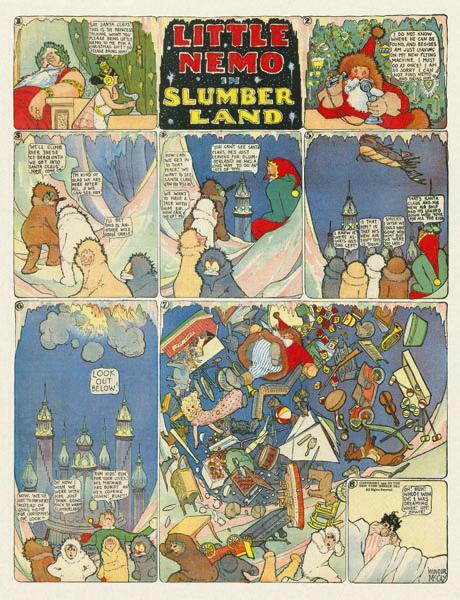 The oh's and ahs of the children told Frank he now had a name for his magic land. 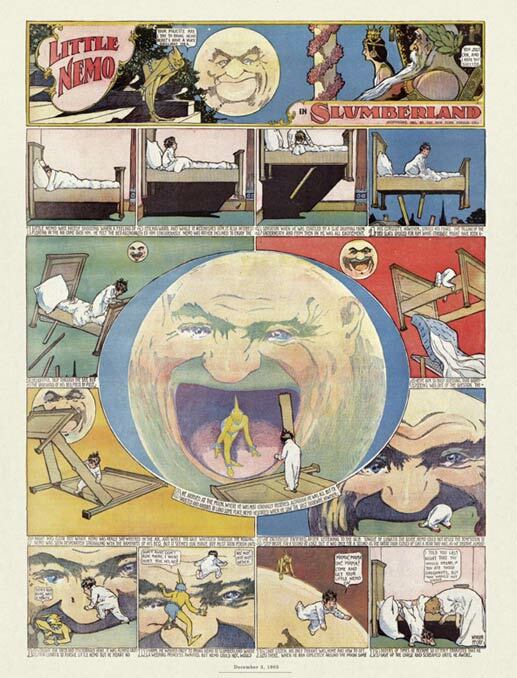 Little did my great grandfather realize what had just occurred, nor could he have foretold how this new story, The Wonderful Wizard of Oz , would take on a life of its own! 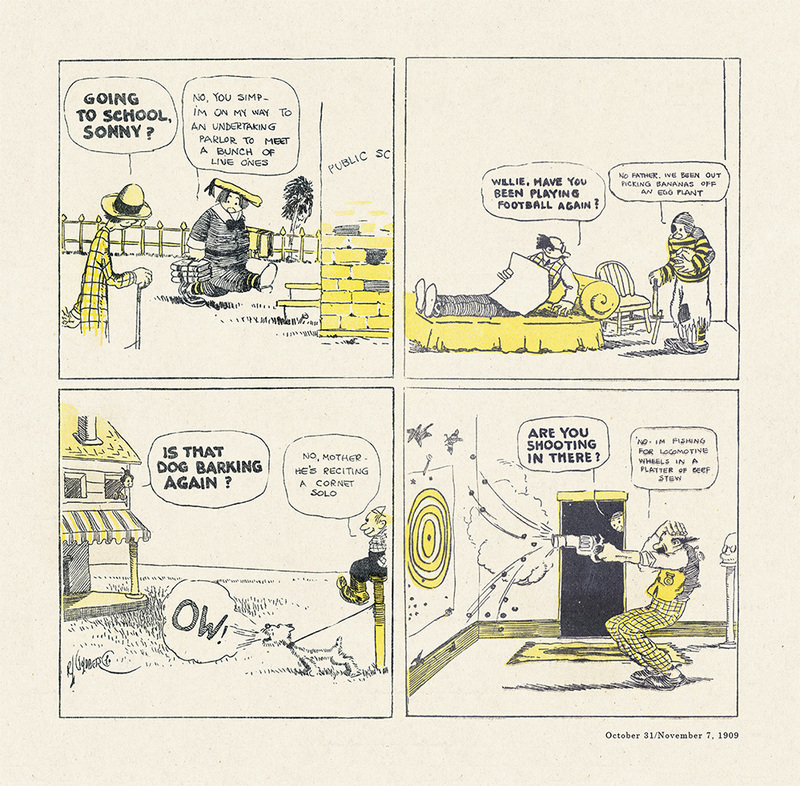 Frank tried being a traveling salesman. 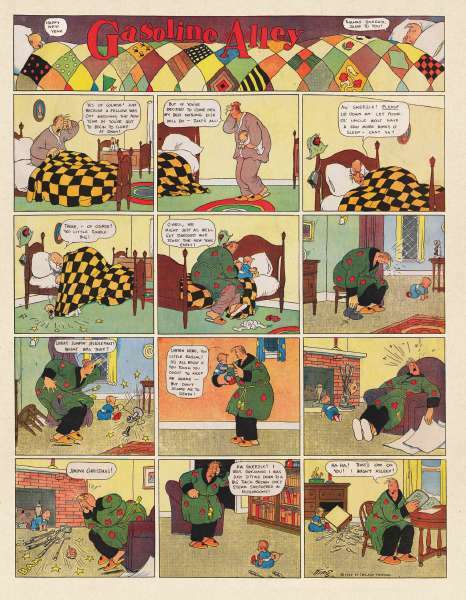 This was not a good job for him because it took him away from his family. 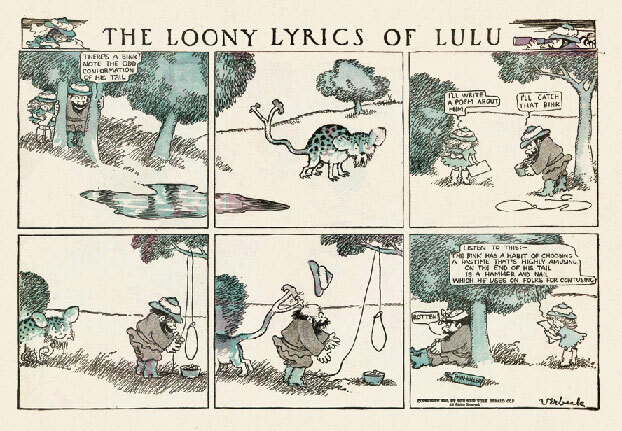 But while killing time in train stations, he scribbled stories and greeting-card-style rhymes. 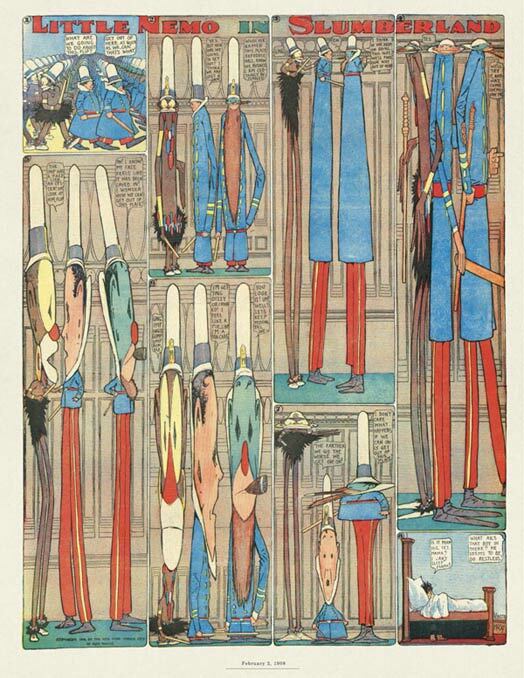 He collected his verse into a little book called By the Candelabra's Glare and published it himself. 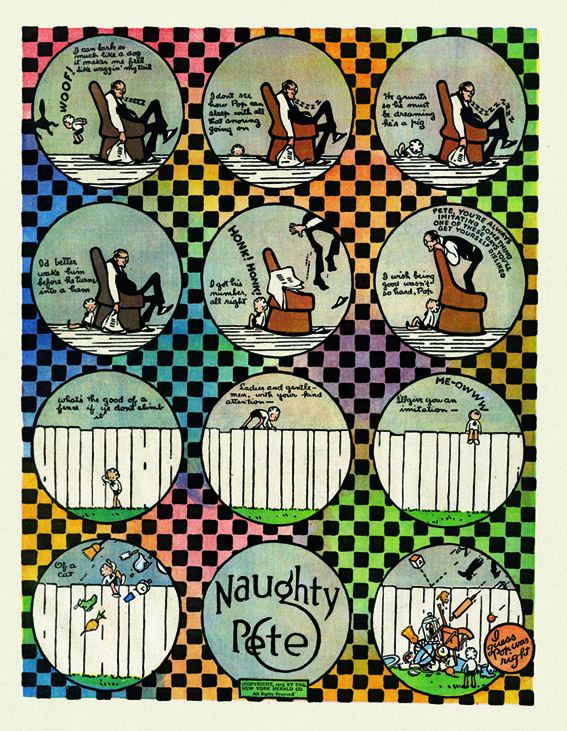 His mother-in-law forcefully suggested that he write down the nursery rhymes that he had improvised for his sons over the years. 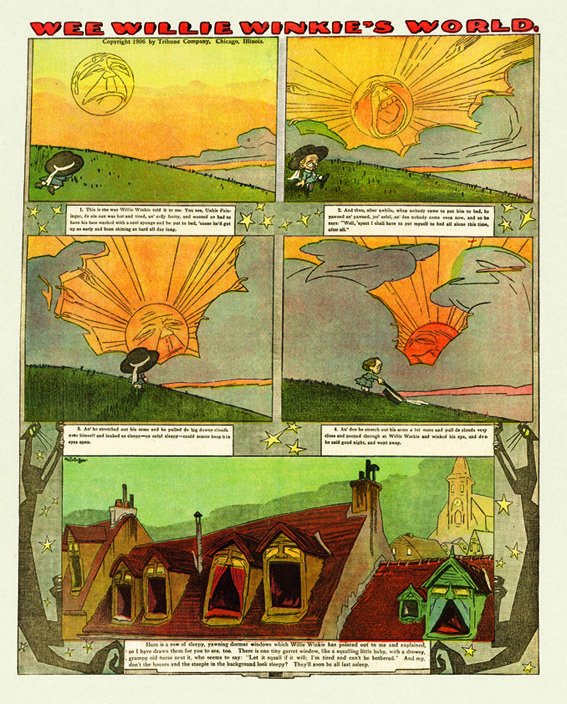 Baum followed her advice and was able to get Mother Goose in Prose published in 1897, with illustrations by the young Maxfield Parrish, who was at the start of his thriving career. 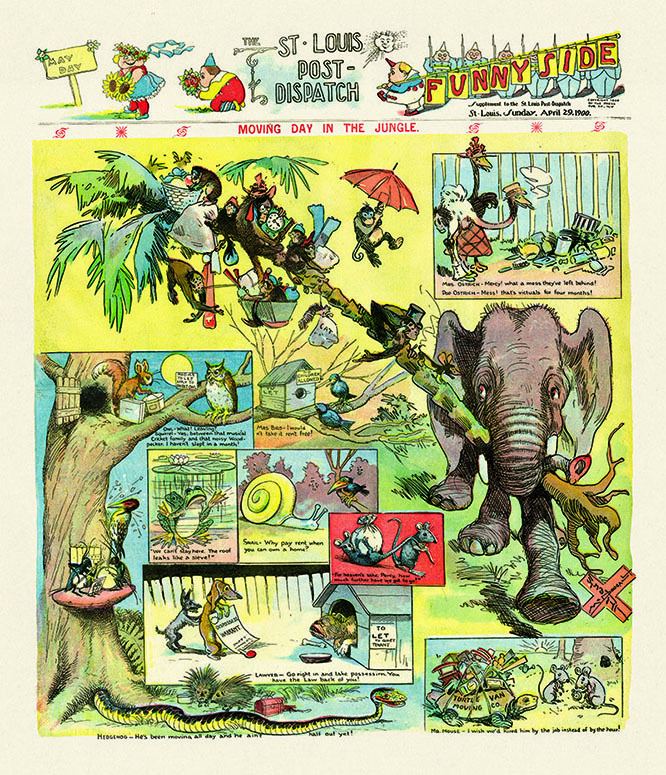 Next, he collaborated on a logical follow-up: Father Goose: His Book, created with his friend W. W. Denslow, an artist famous for his posters . 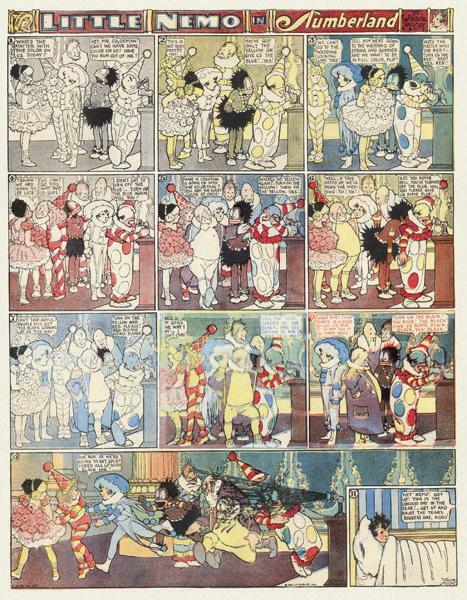 But Baum also met with plenty of rejection. 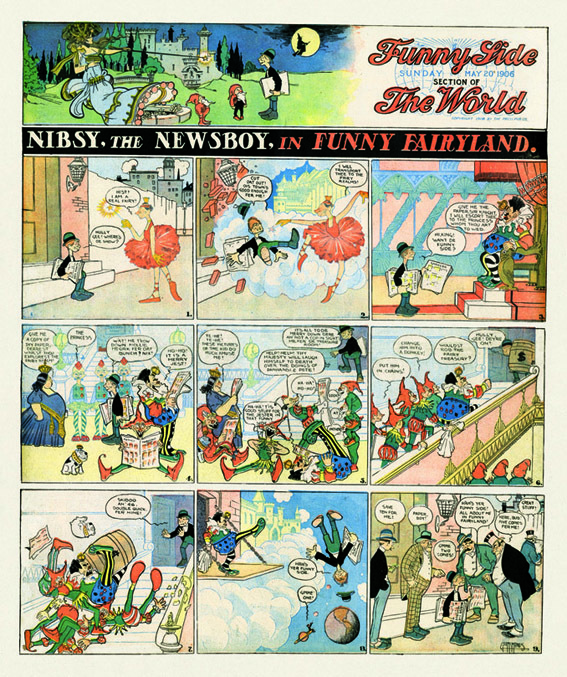 It took him seven years to find a publisher for Adventures in Phunnyland , his first book of fairy tales. 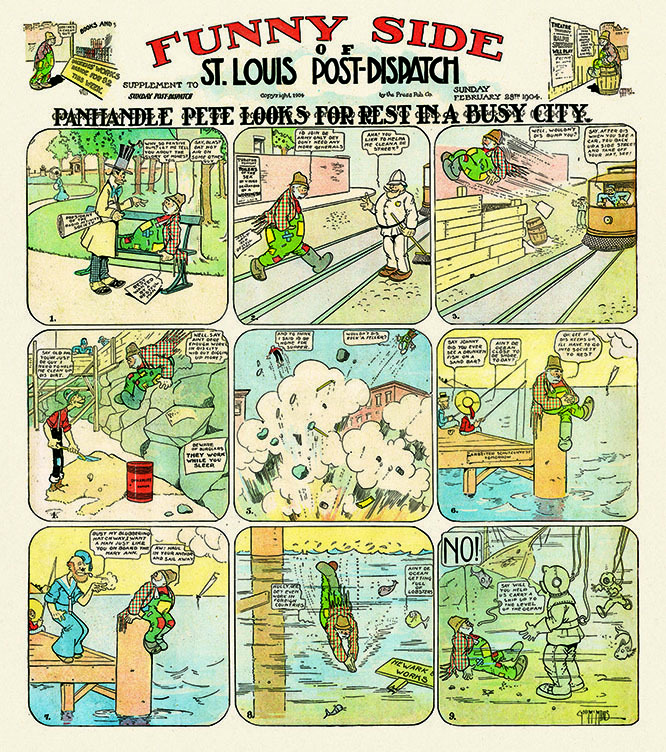 For some time he had been noodling around with a story he was calling "The Emerald City." 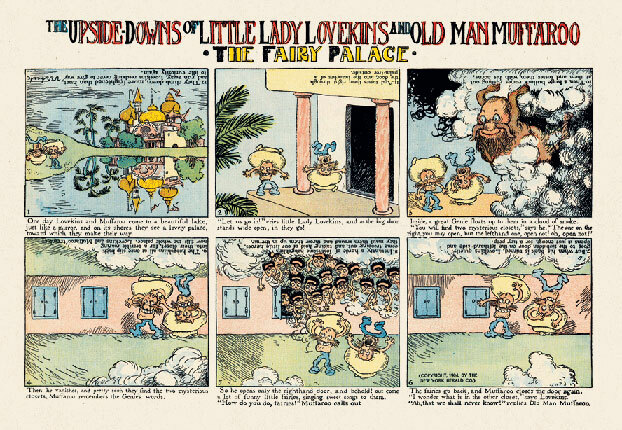 It took place in a magical land where women were all-powerful, and it featured a girl from Kansas named Dorothy, her little dog Toto, a talking scarecrow, a tin woodman, and a timid lion. 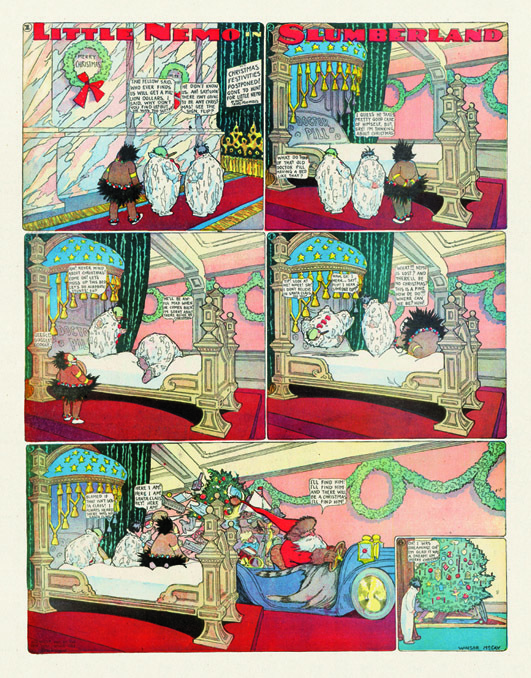 He thought of it as a modern fairy tale for "our wide-awake youngsters." 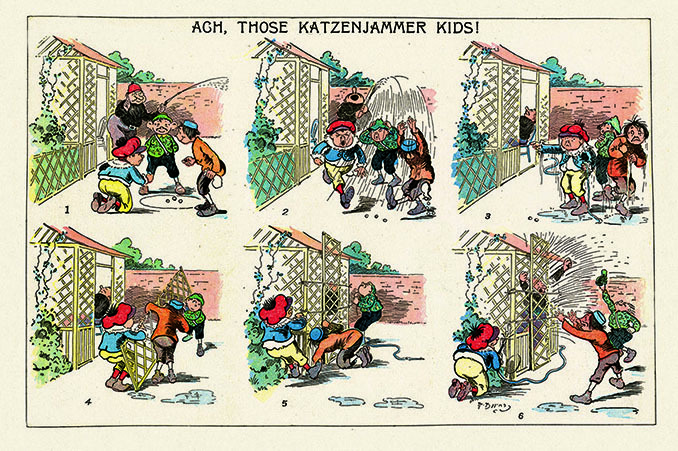 More and more neighborhood children were visiting the Baum house to hear the latest installment, and he started telling people it was the best thing he had ever written. 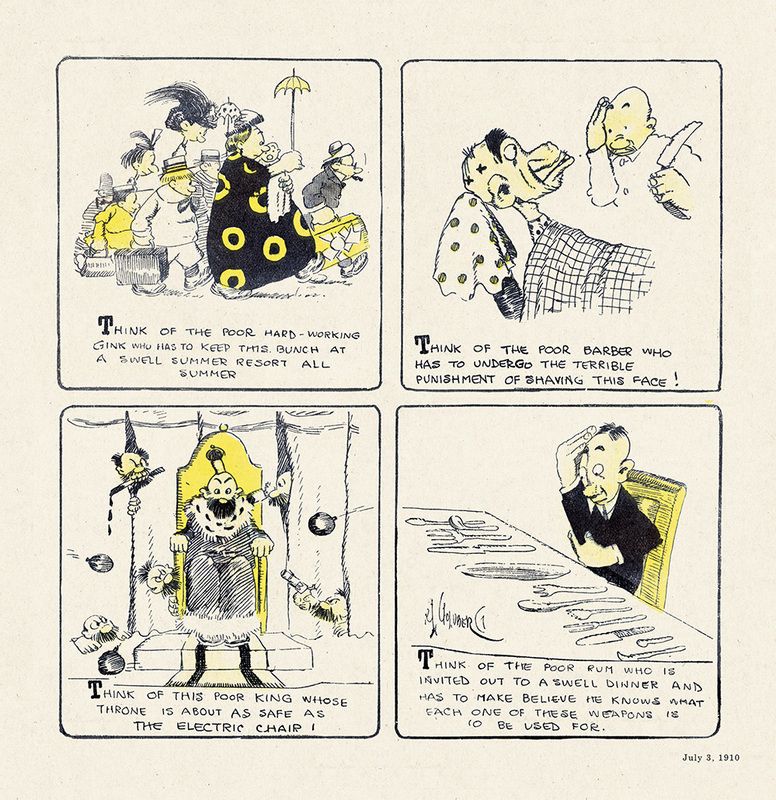 W. W. Denslow is best remembered today as the original illustrator of L. Frank Baum’s The Wonderful Wizard of Oz. 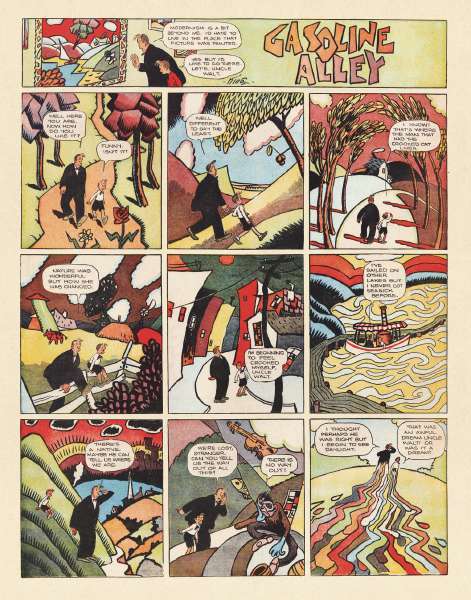 Baum, of course, was the creator of Oz, but Denslow’s illustrations in the extraordinarily beautiful first printings were largely responsible for making the book, and indeed Oz, a success. 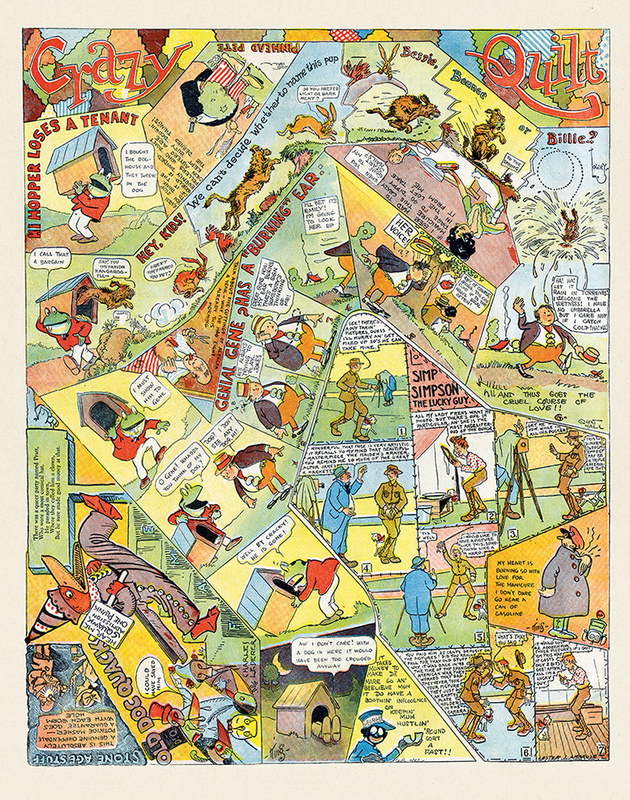 Baum and Denslow had collaborated closely on The Wonderful Wizard of Oz. 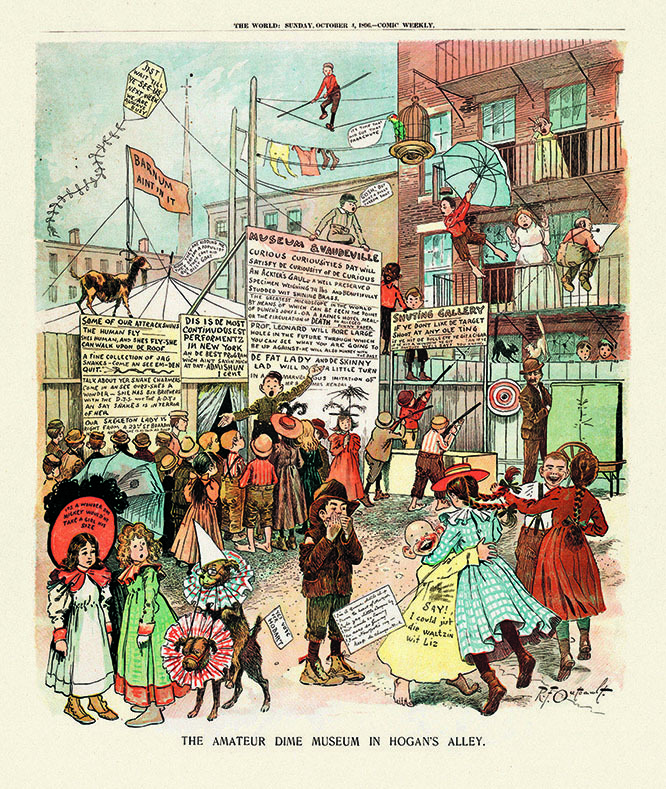 Soon after the book’s 1900 publication, the two men began plans for turning it into a stage musical. 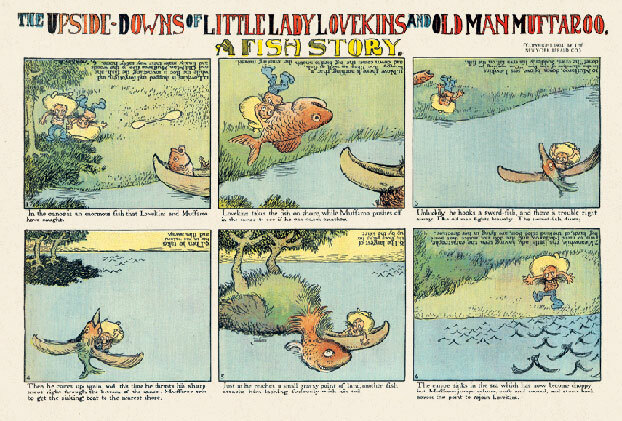 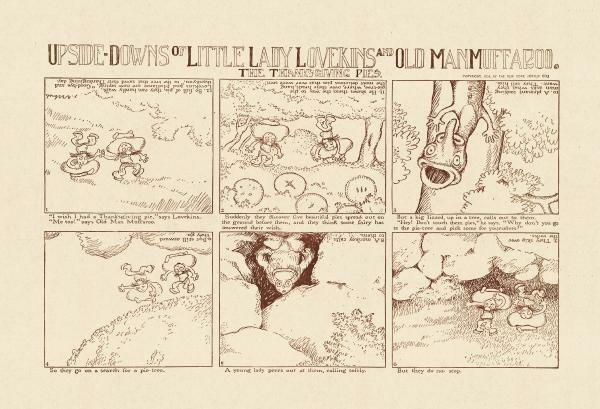 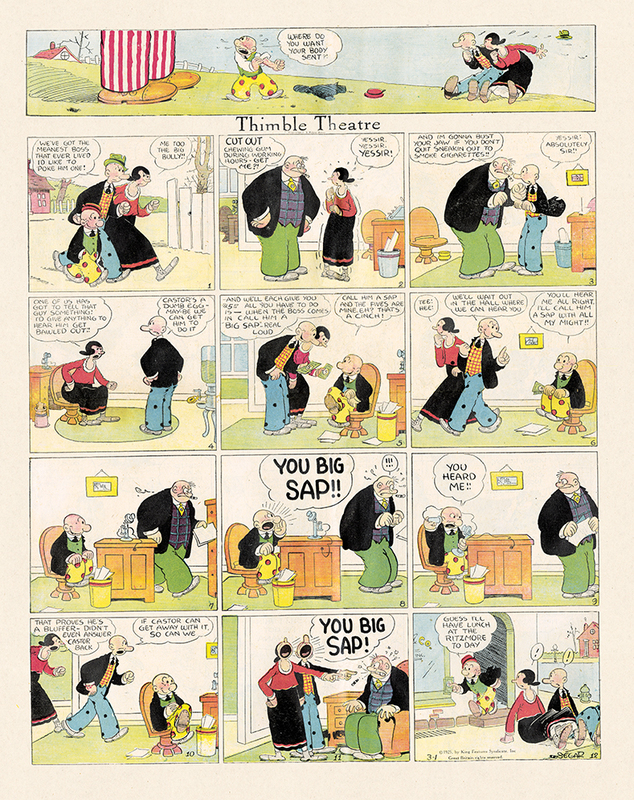 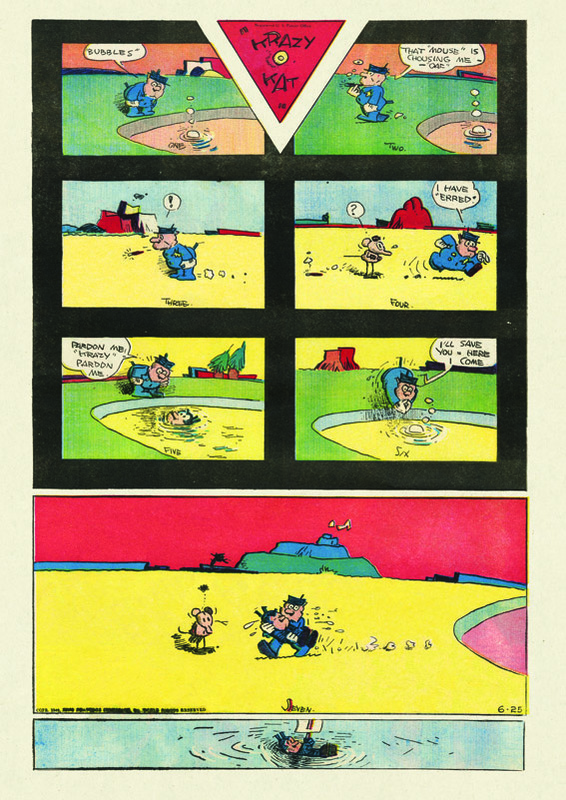 An ensuing fight over royalties led to a falling out between Baum and Denslow. 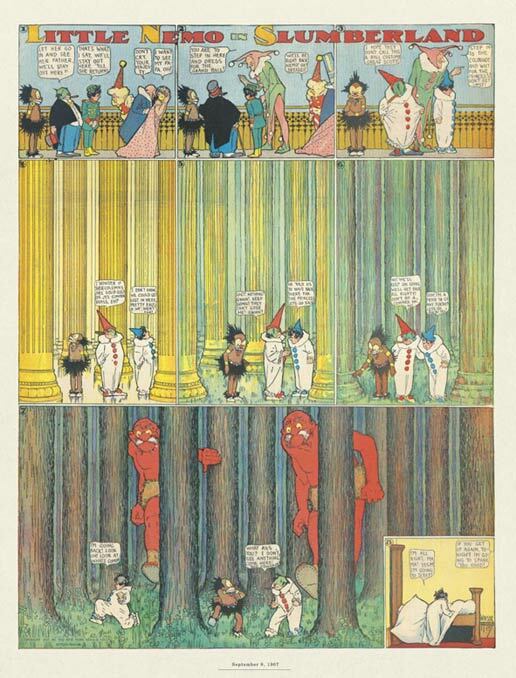 Each man held full copyright to the entire work, and each felt he could use the Oz material to his own best advantage. 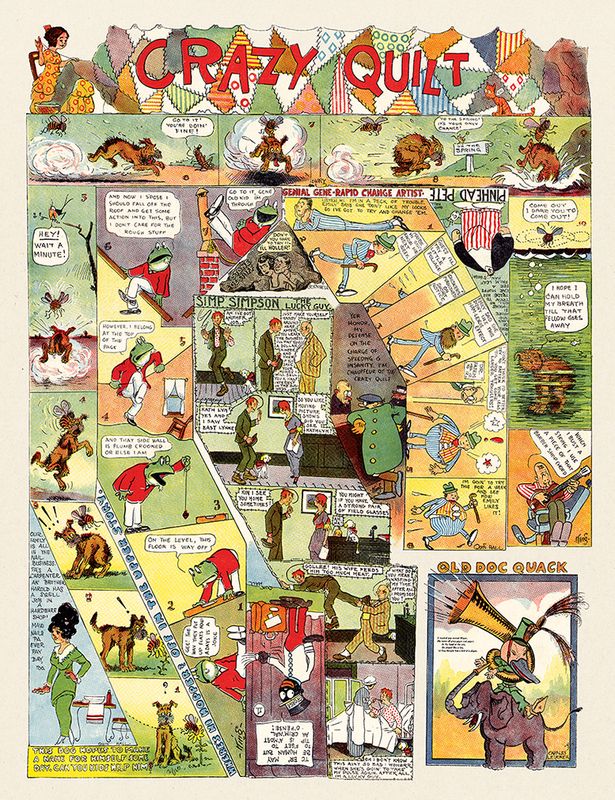 And in late 1904, each man claimed Oz as his own and began a series of newspaper stories that ran in Sunday comic sections around the nation. 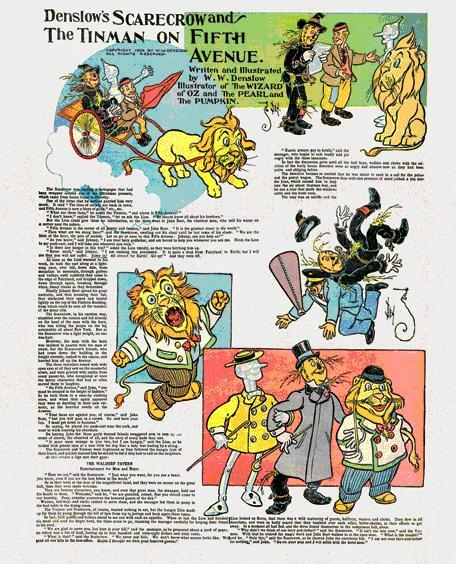 Baum’s, of course, was Queer Visitors from the Marvelous Land of Oz. 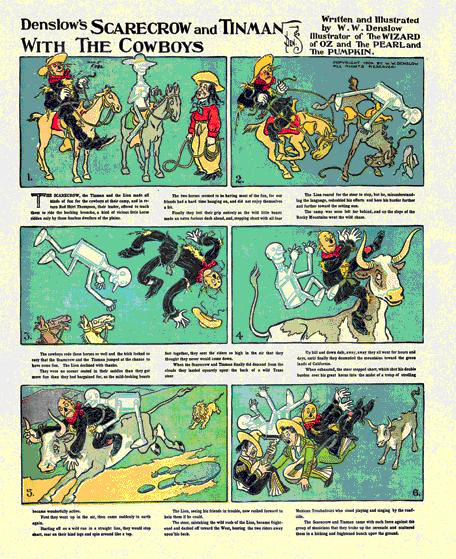 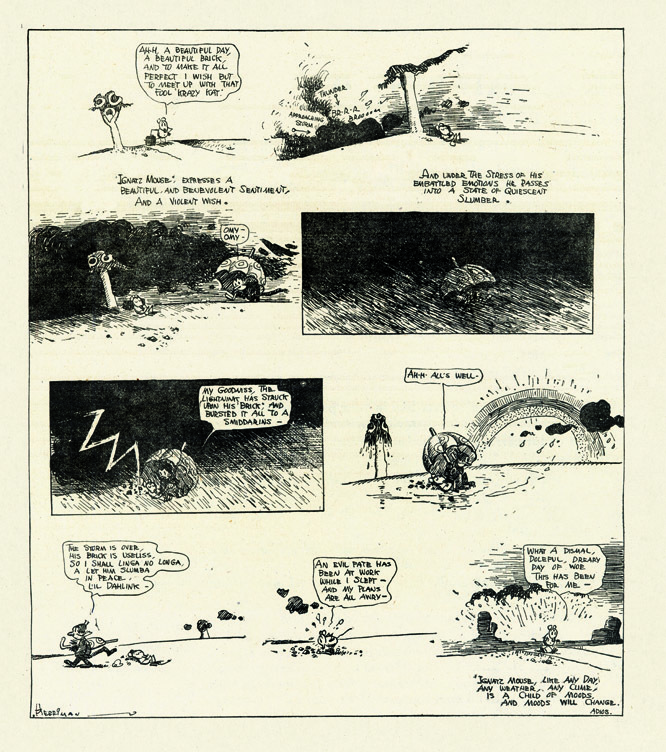 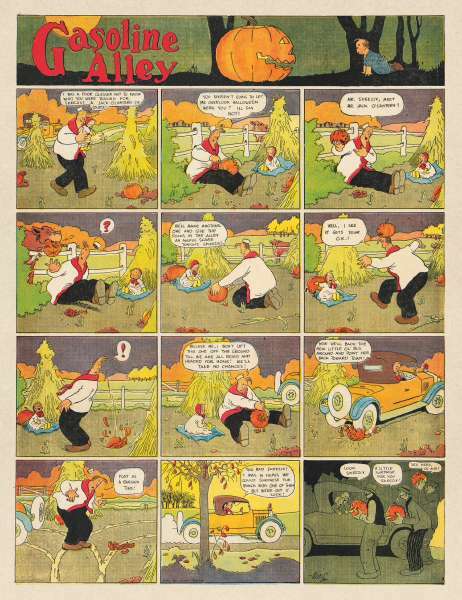 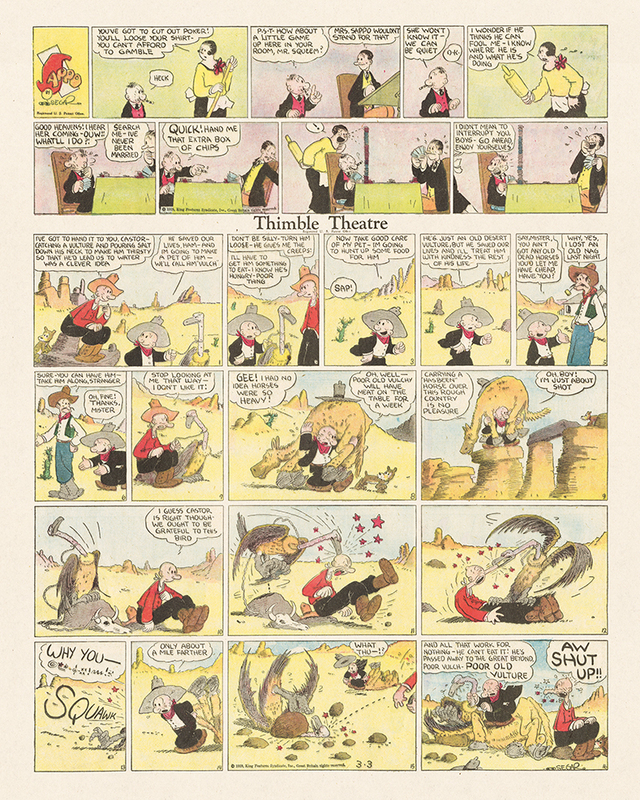 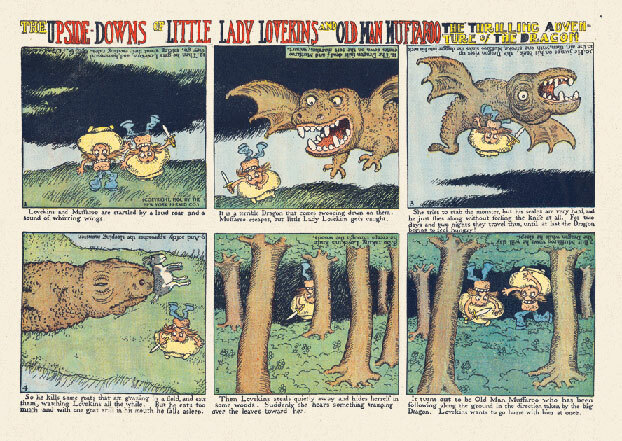 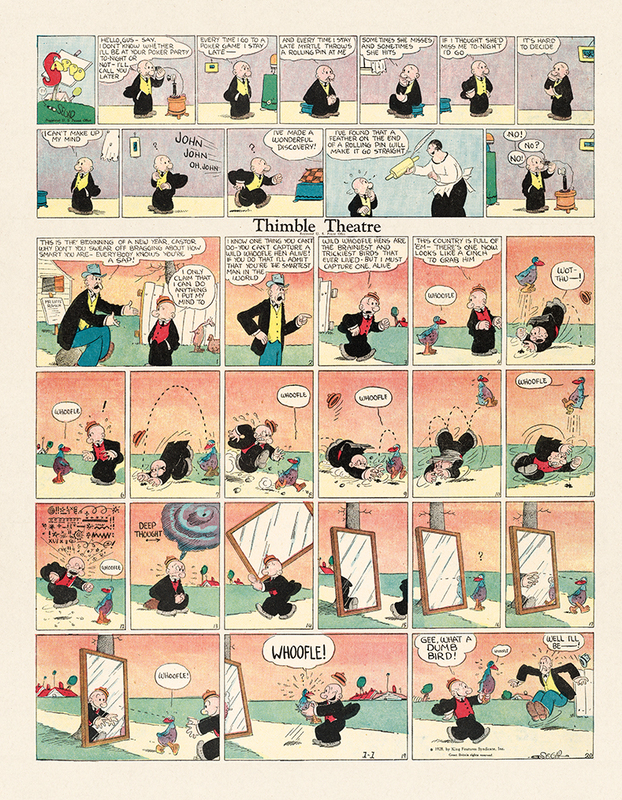 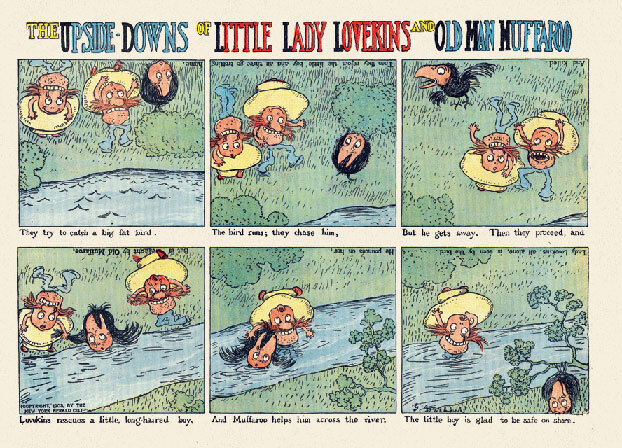 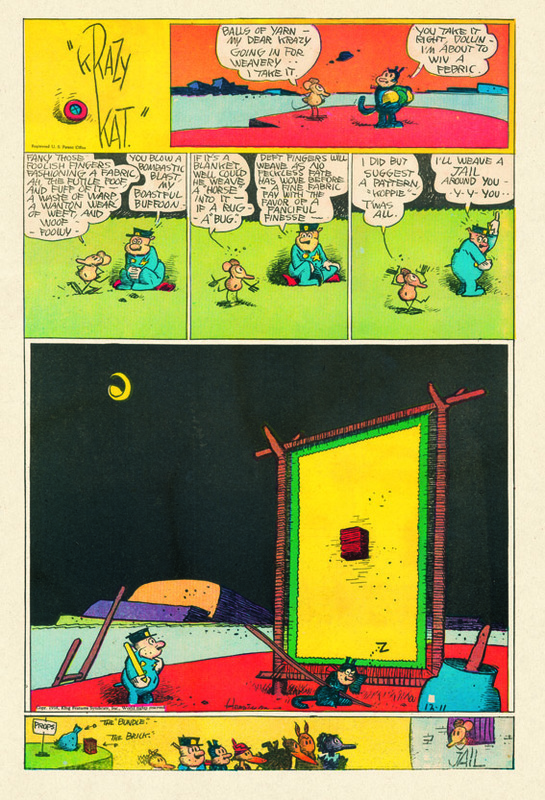 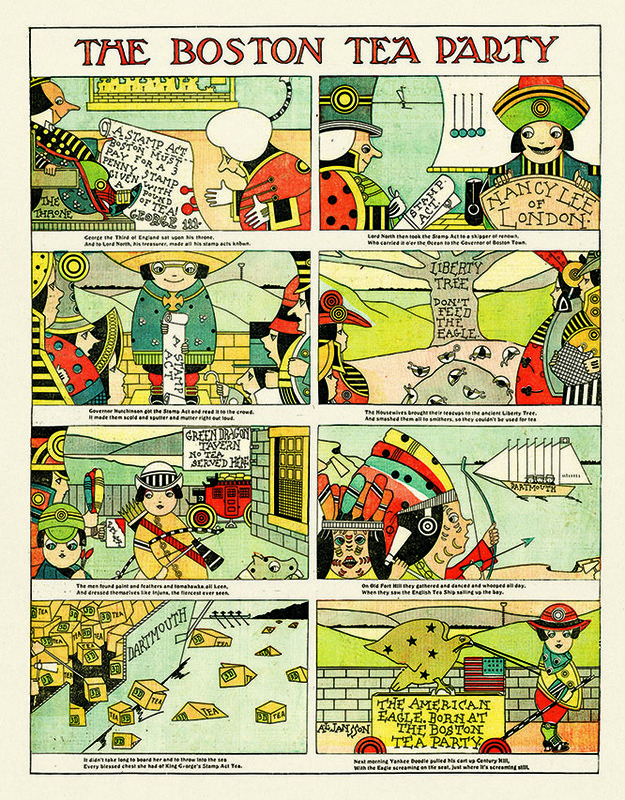 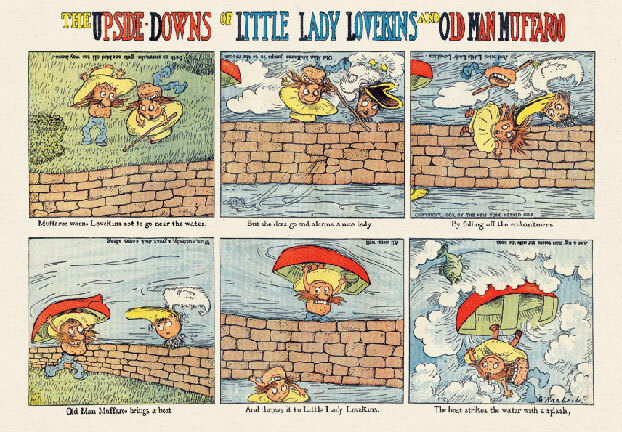 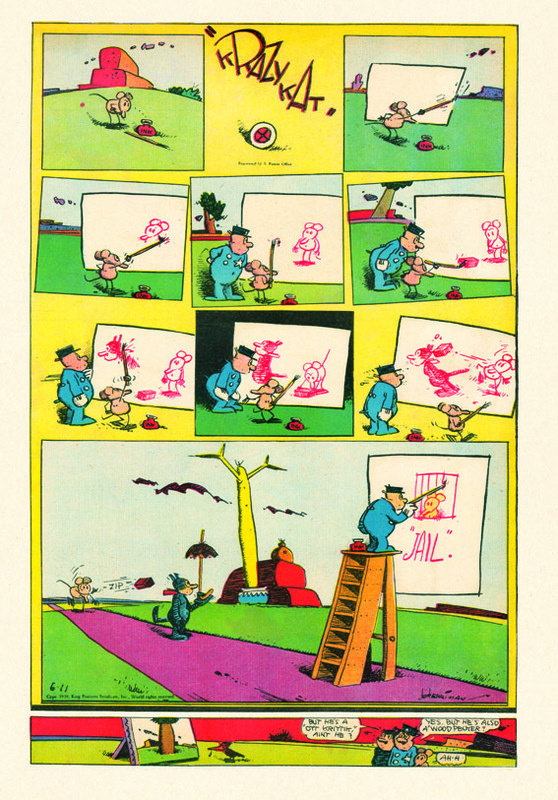 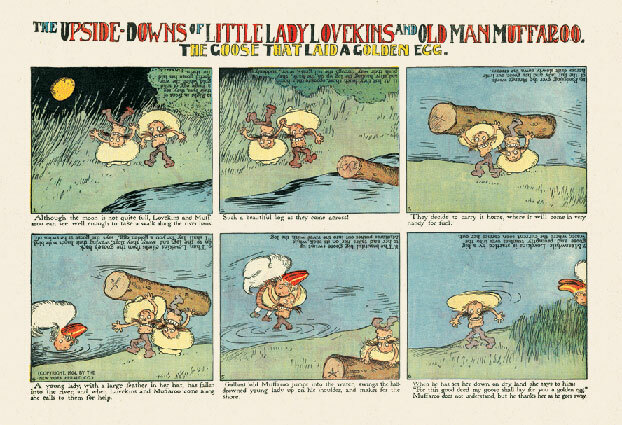 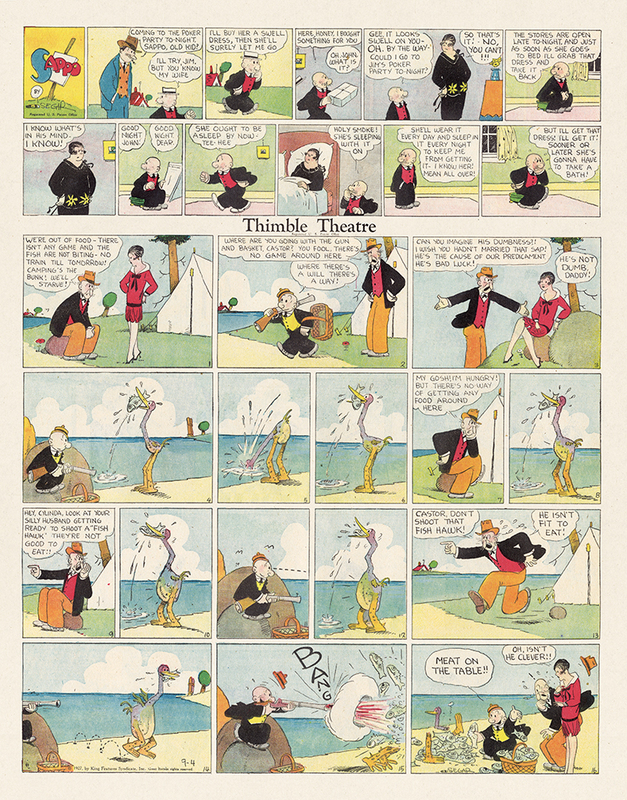 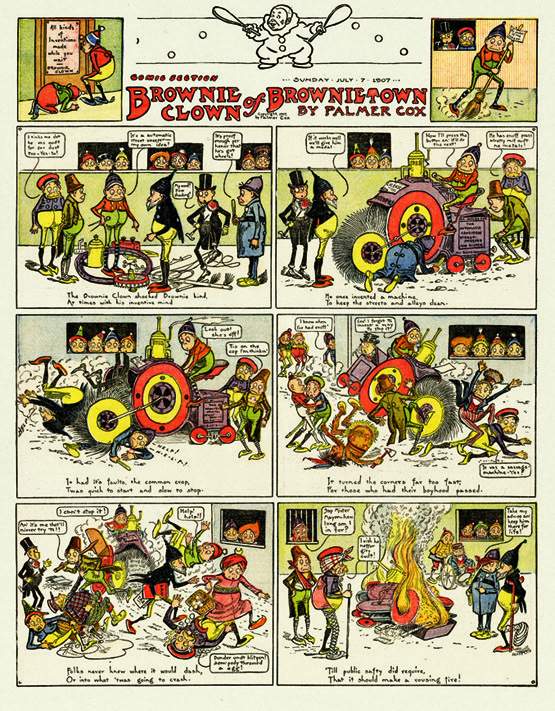 Denslow’s artistic reply was a series called Denslow’s Scarecrow and Tin-man, syndicated by the McClure Syndicate. 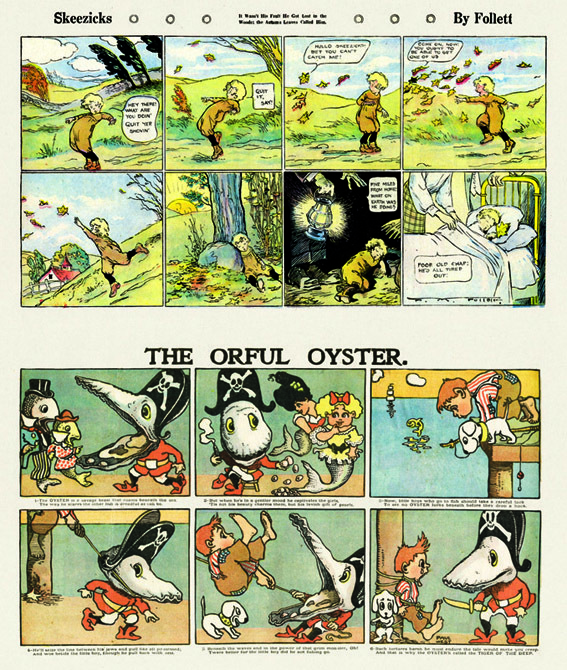 Denslow wrote twelve original short stories. 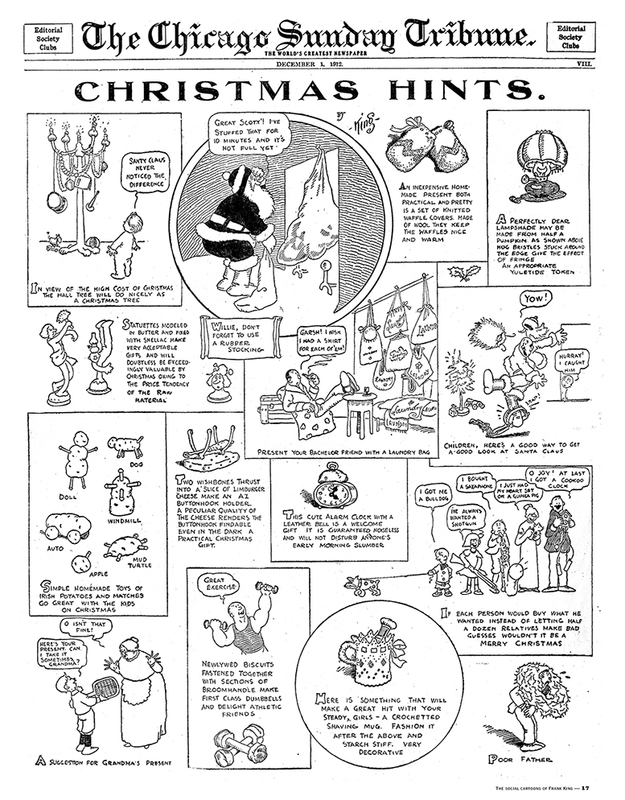 The first, “Dorothy’s Christmas Tree,” appeared in early December 1904; the series continued in papers through the middle of March 1905. 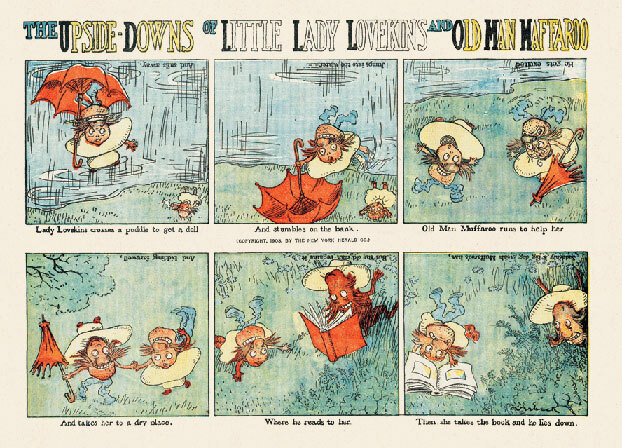 But early in the run, perhaps because he was running short on time, Denslow used his previously published 1904 G. W. Dillingham Co. picture book – also titled Denslow’s Scarecrow and Tin-man – as two of the installments, bringing out fourteen weeks’ worth of stories in all. 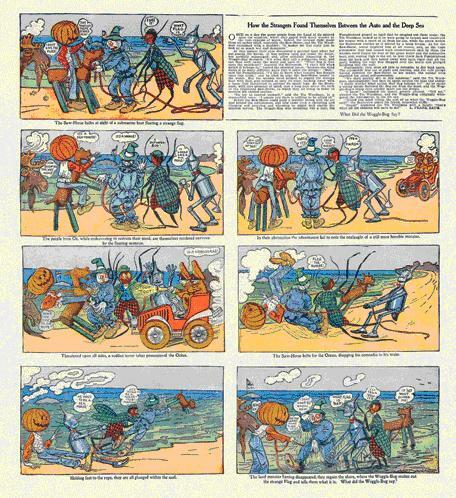 The Marvelous Land of Oz brings back the old friends the Scarecrow and the Tin Woodman, and introduces new characters - Jack Pumpkinhead, the Saw-Horse, and Mr. H. M. Wogglebug, T. E., an insect magnified to human size and whose opinion of himself is similarly enlarged. 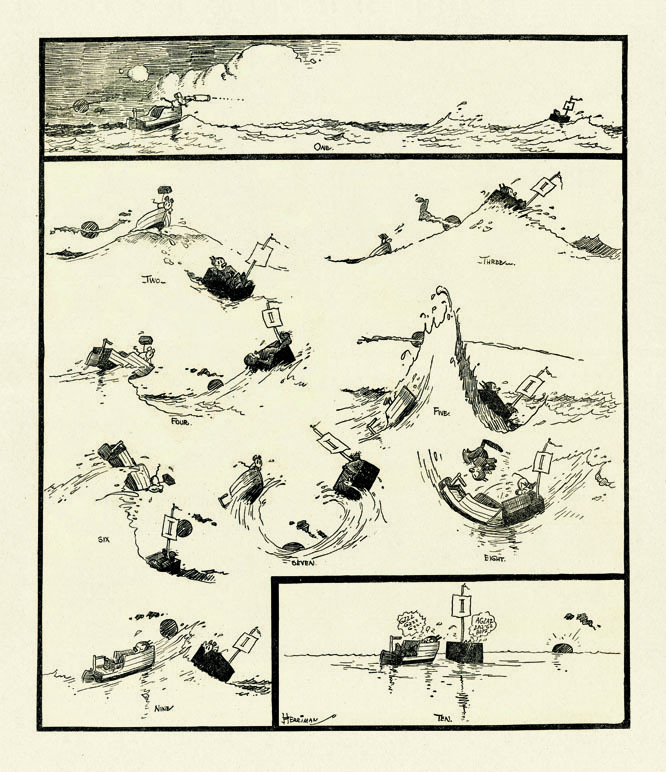 At one suspenseful point in the story, these desperate companions build a flying machine out of an unlikely collection of objects - a broom, two sofas, some palm leaves, and the stuffed head of a deer-like animal called a Gump - all tied together with rope. 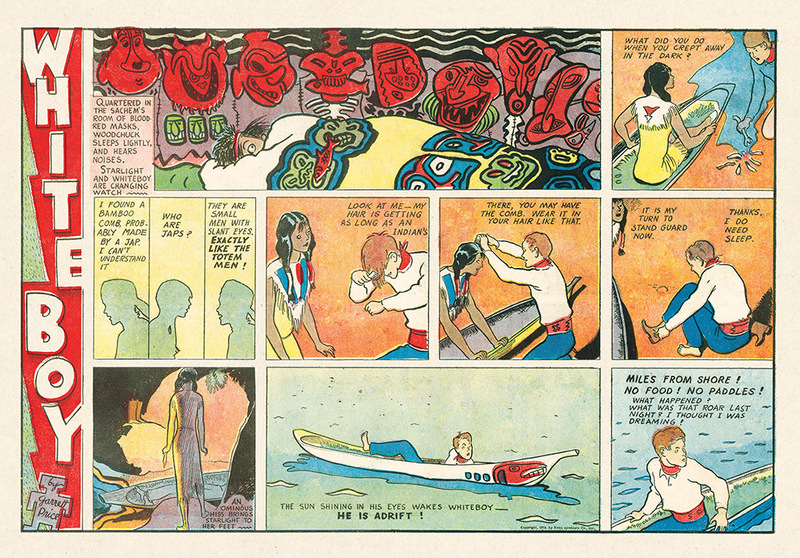 They bring it to life with a magic powder and the Gump becomes part of their adventures. 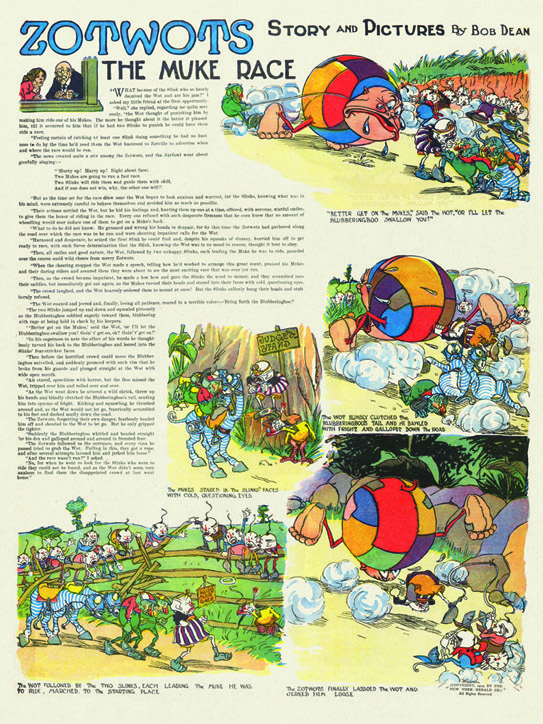 The publishers promoted The Marvelous Land of Oz heavily. 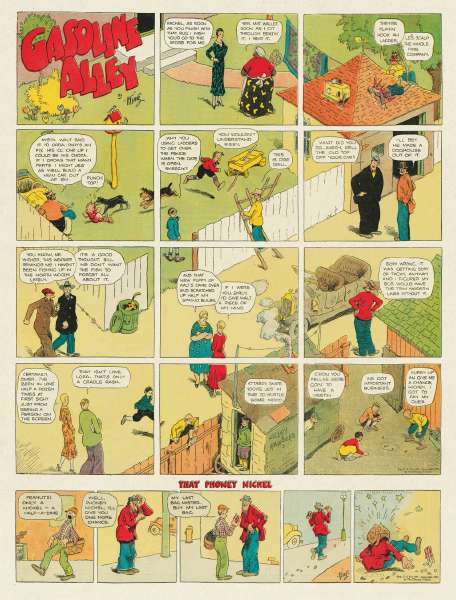 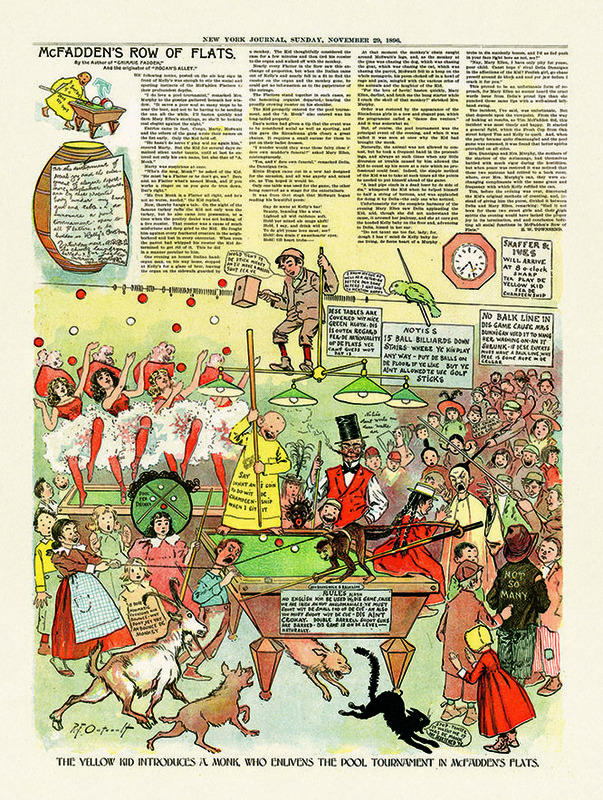 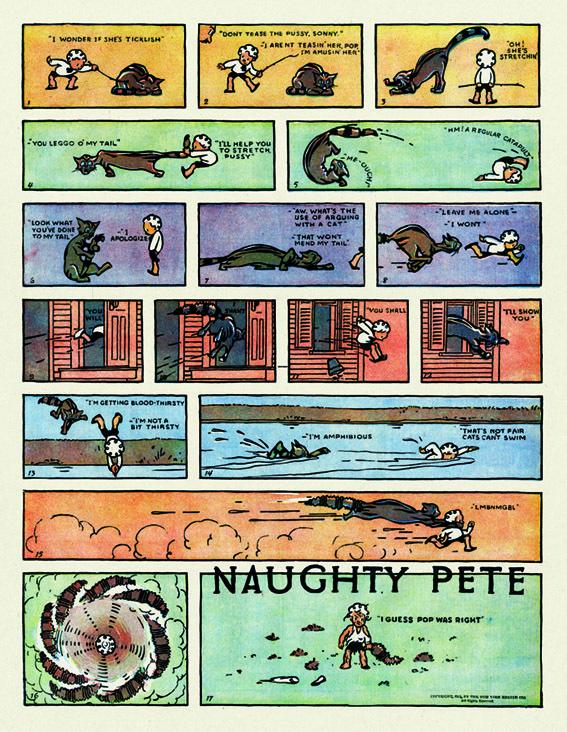 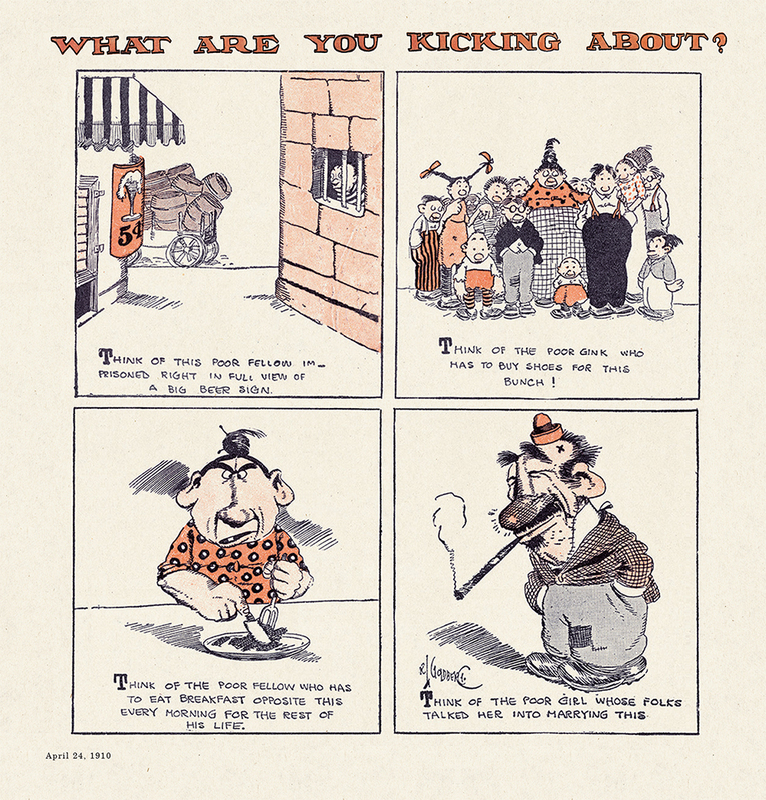 One publicity effort was a series of twenty-six stories by Baum, syndicated by the Philadelphia North American newspaper to the Sunday Comic Sections of newspapers across America. 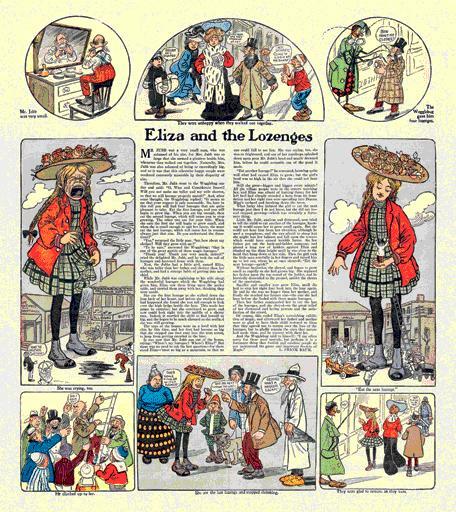 The series, titled Queer Visitors from the Marvelous Land of Oz, ran weekly from August 28, 1904, through February 26, 1905. 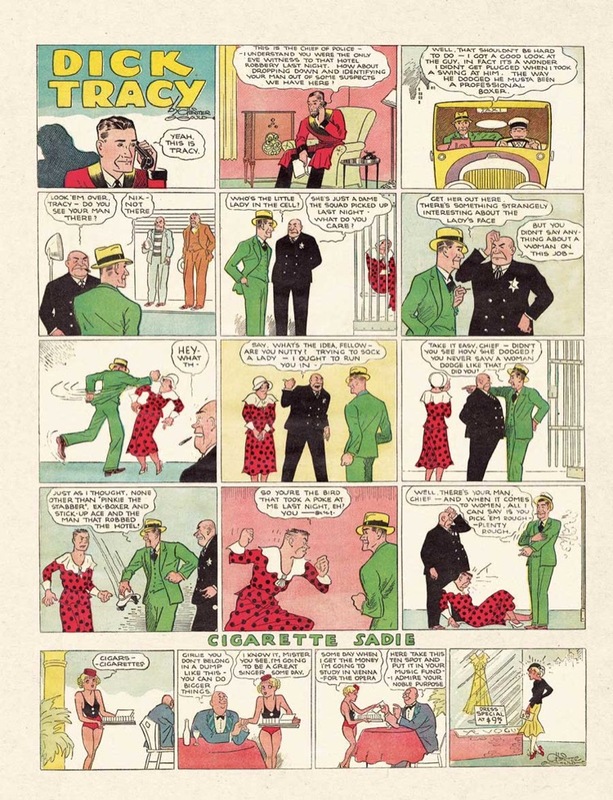 Queer Visitors was not exactly a comic strip--though the drawings often contain word balloons--but rather a comic page. 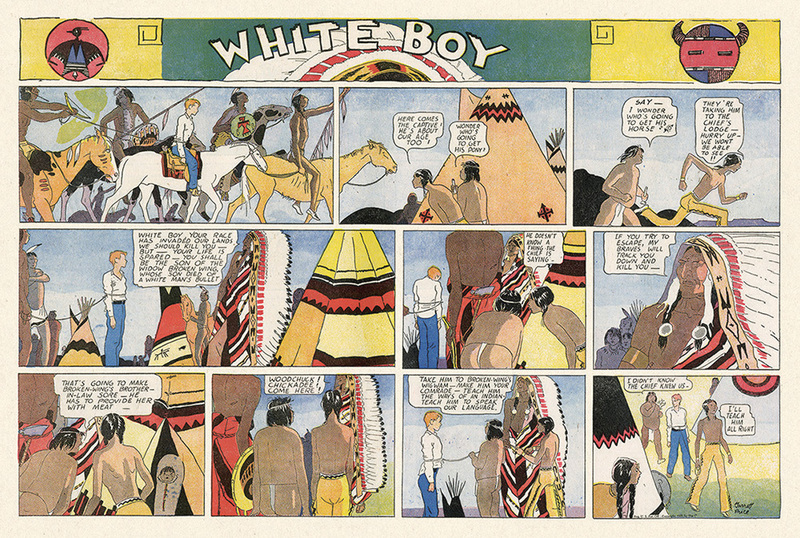 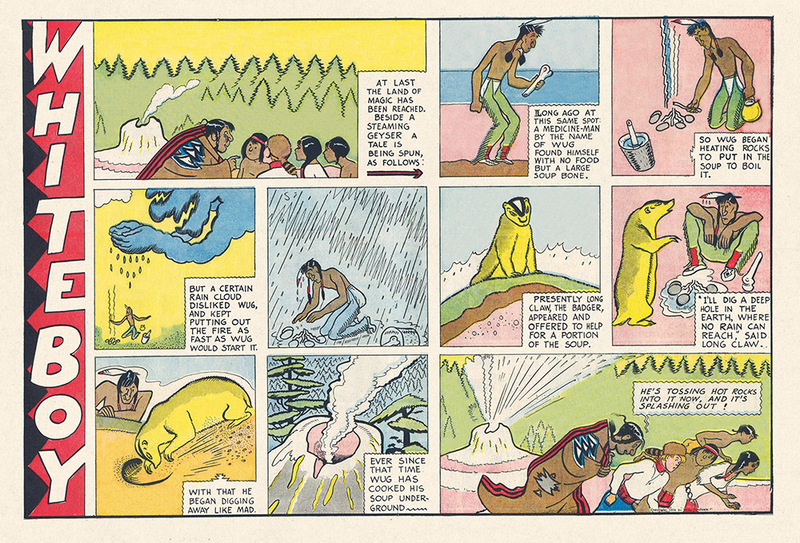 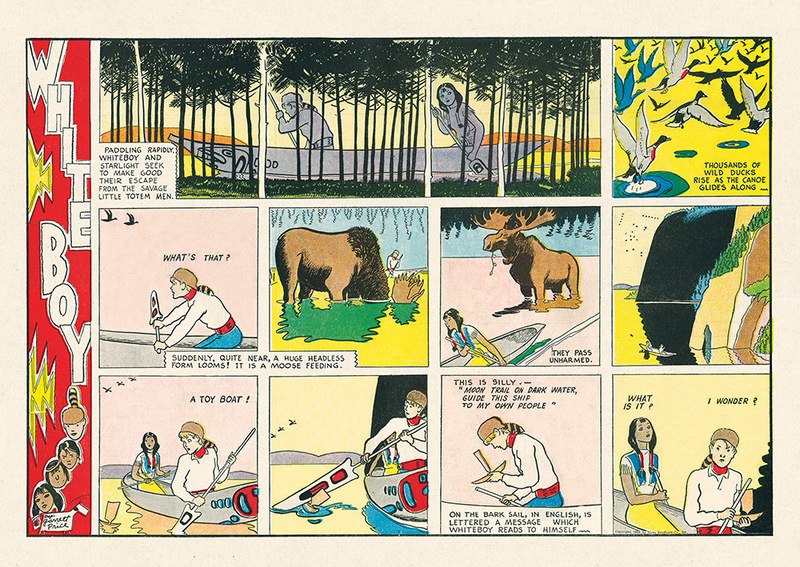 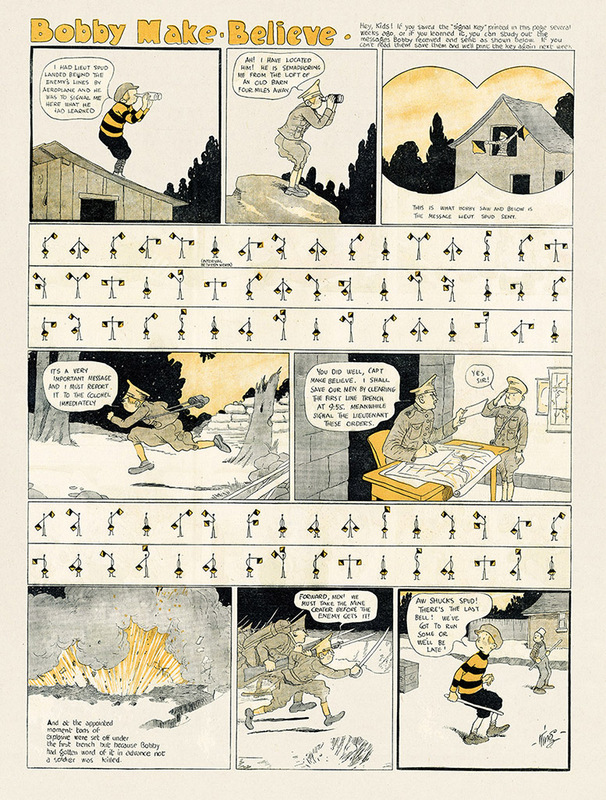 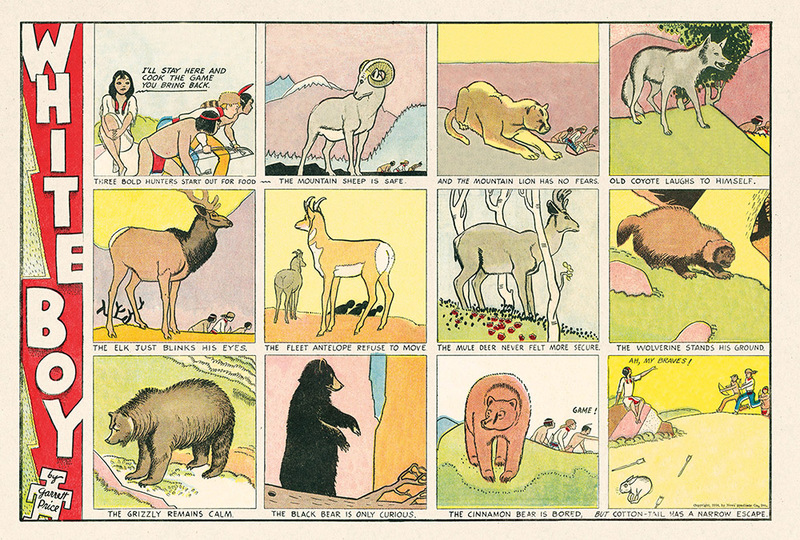 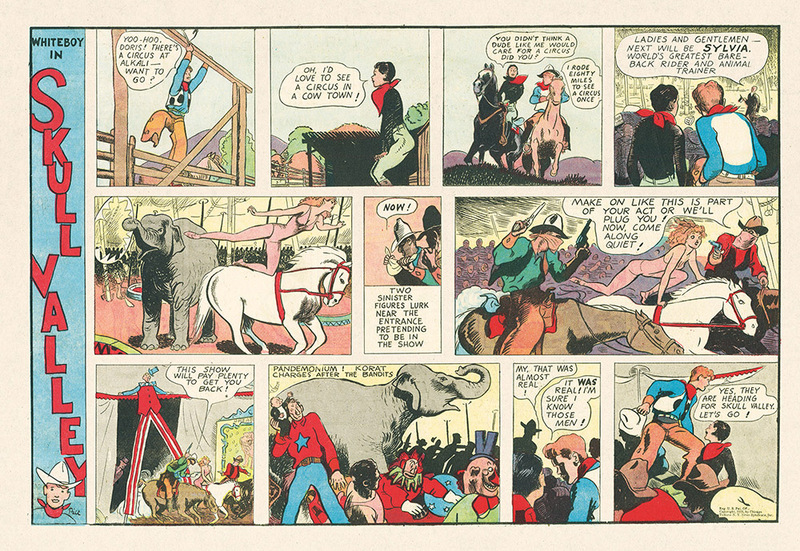 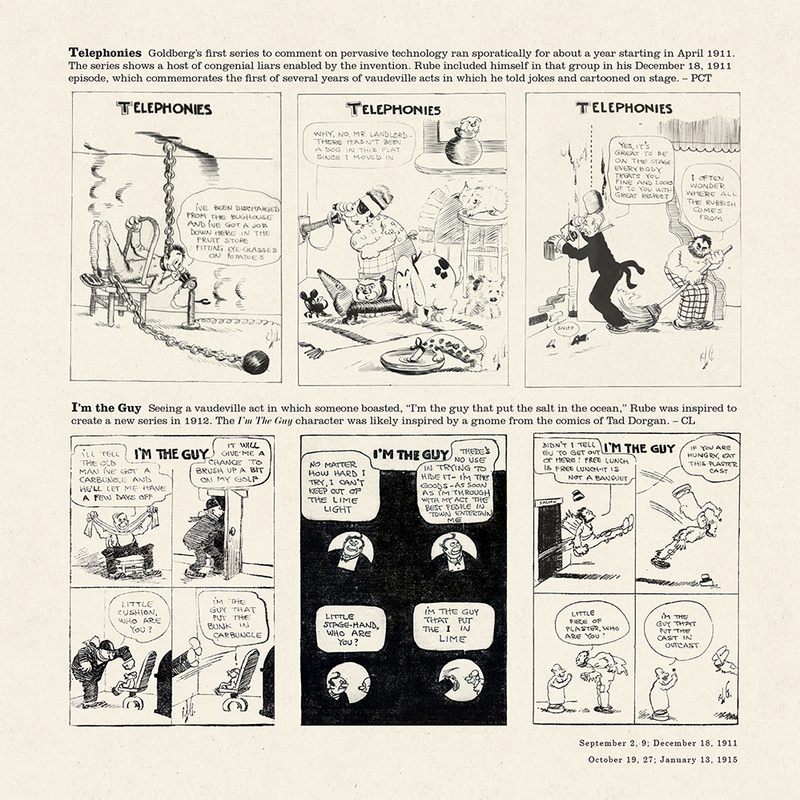 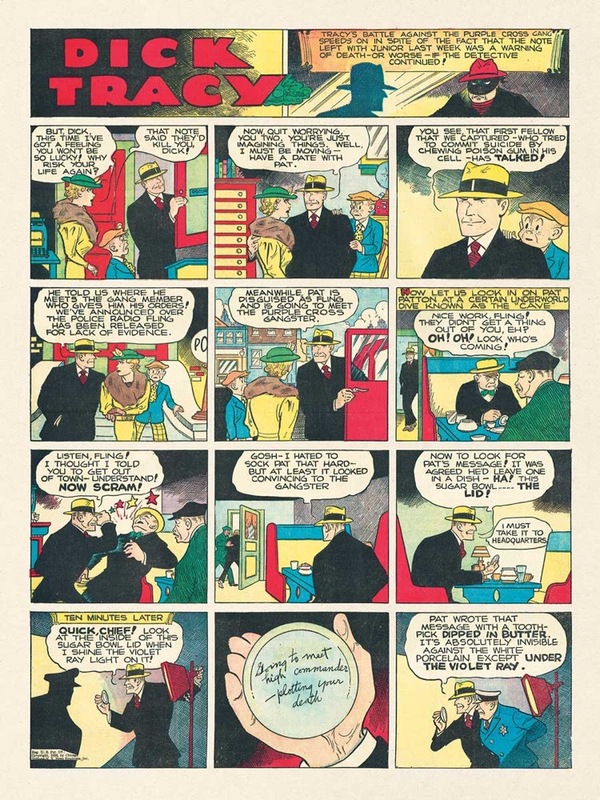 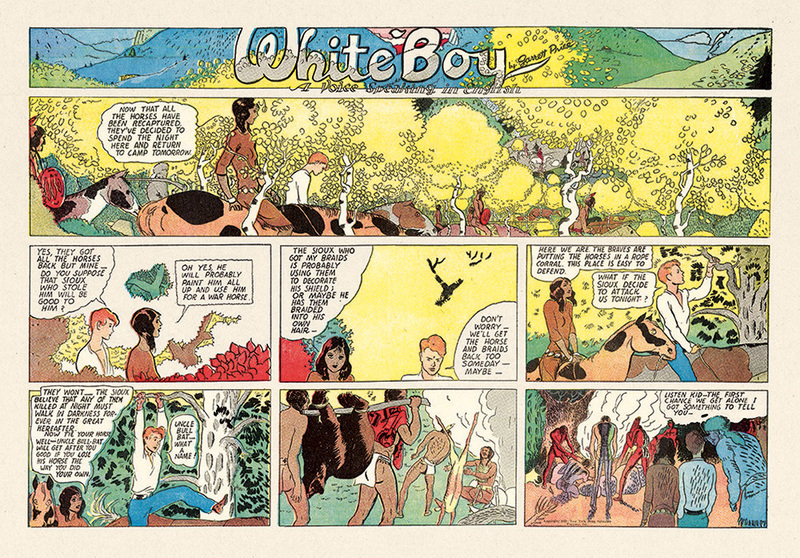 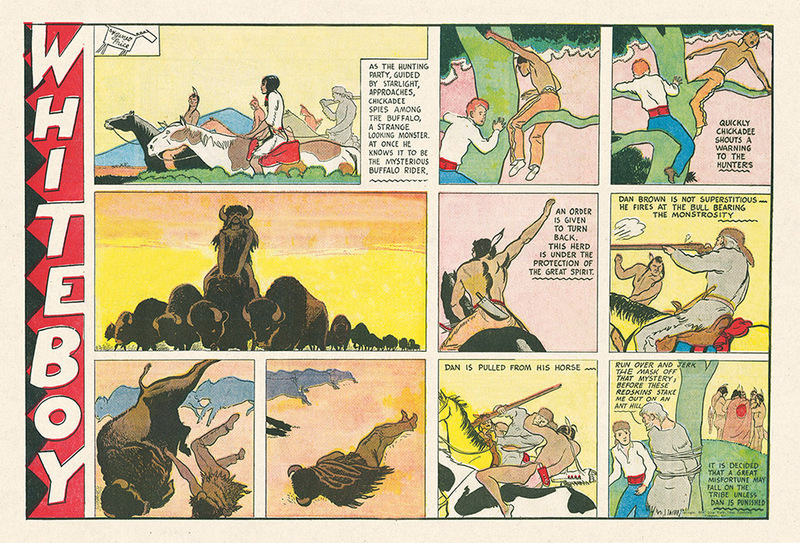 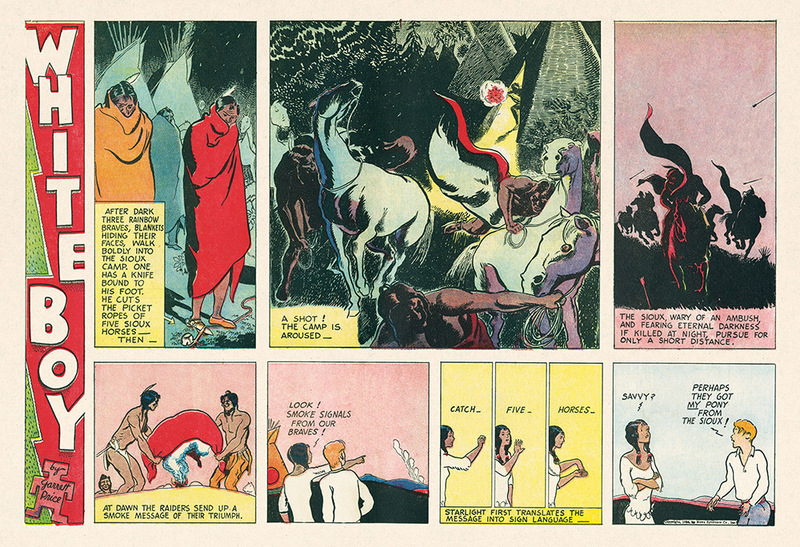 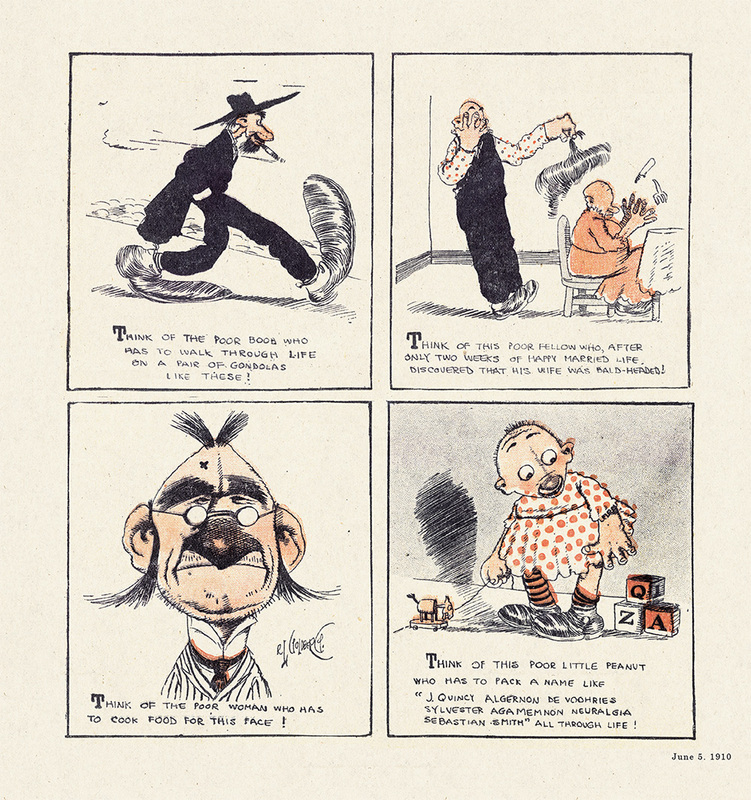 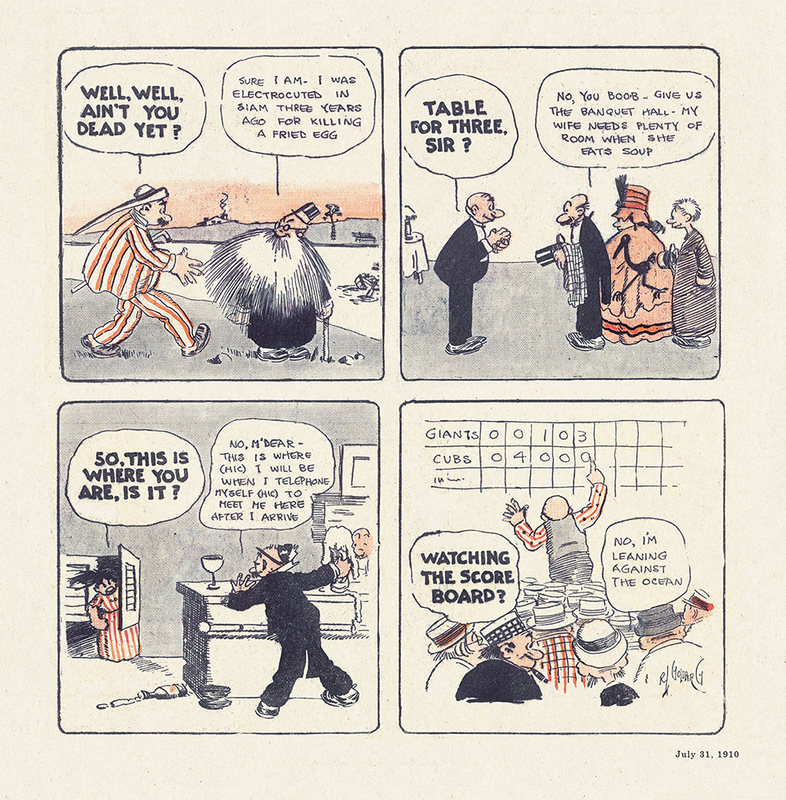 Baum's text for each episode is distinct from the drawings by Philadelphia cartoonist Walt McDougall, but McDougall's art dominates each page, surrounds the text, and contributes significantly to the interest of each story. 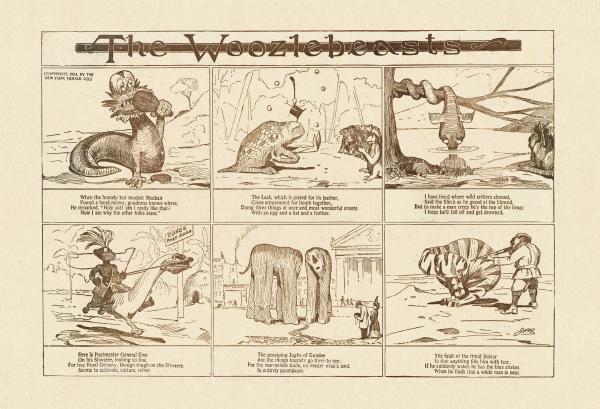 In what is possibly the first use of a narrative comic in this way, the first seventeen stories provided a weekly contestIn the course of each story, the Wogglebug answered a question, but his answer was not revealed to the audience. 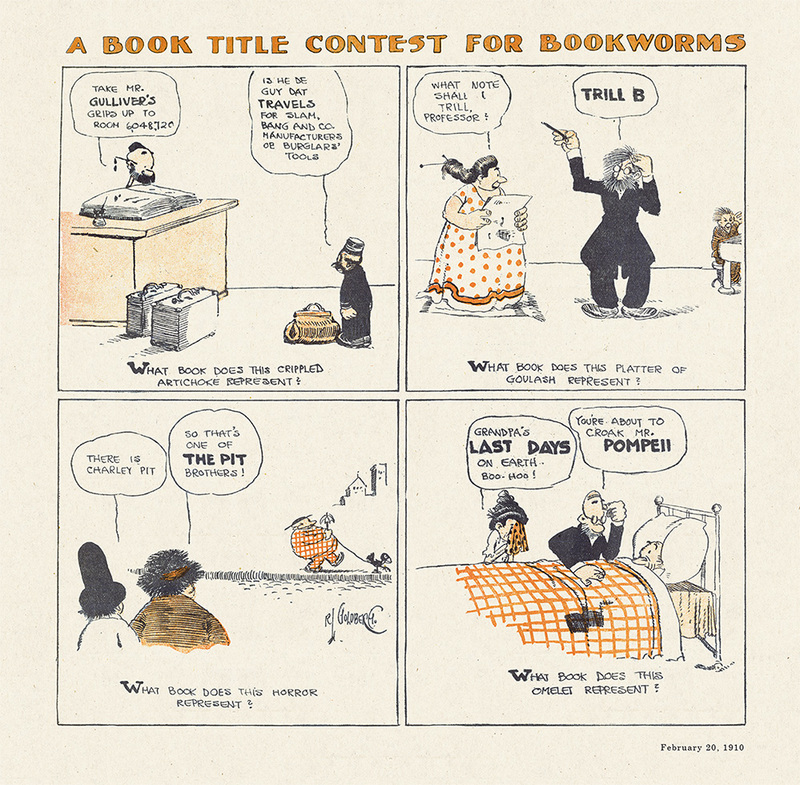 At each story's end readers were asked, "What did the Wogglebug say?" 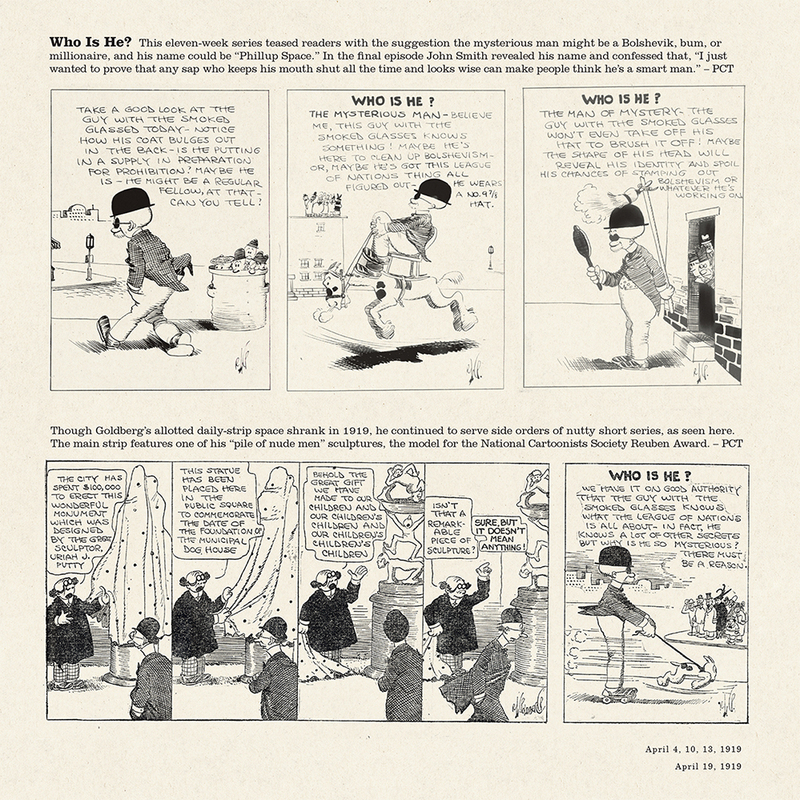 and invited to submit their answers to the newspaper. 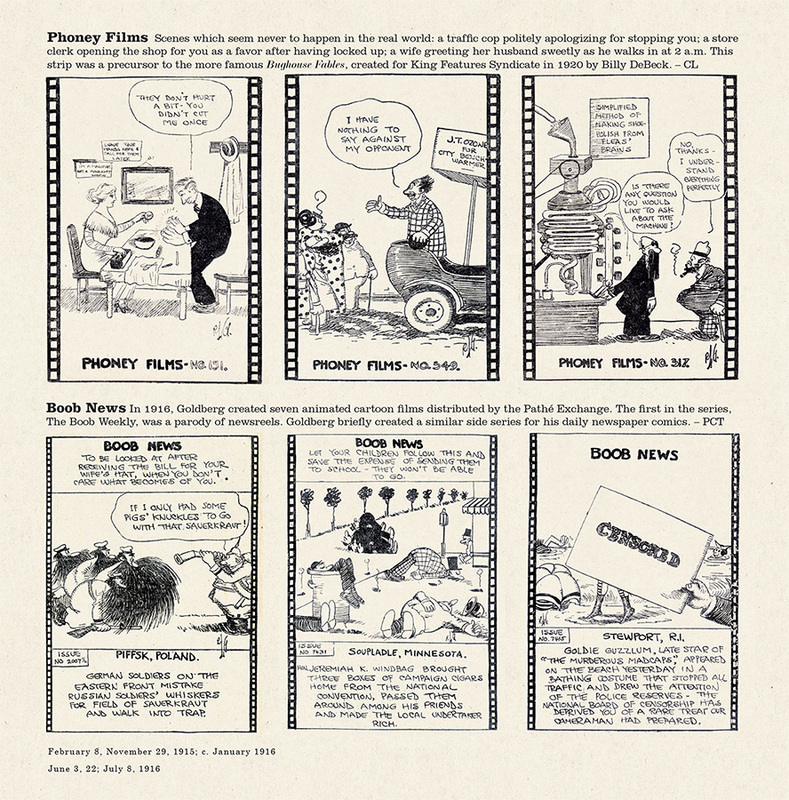 Cash prizes were offered, totaling five hundred dollars every month. 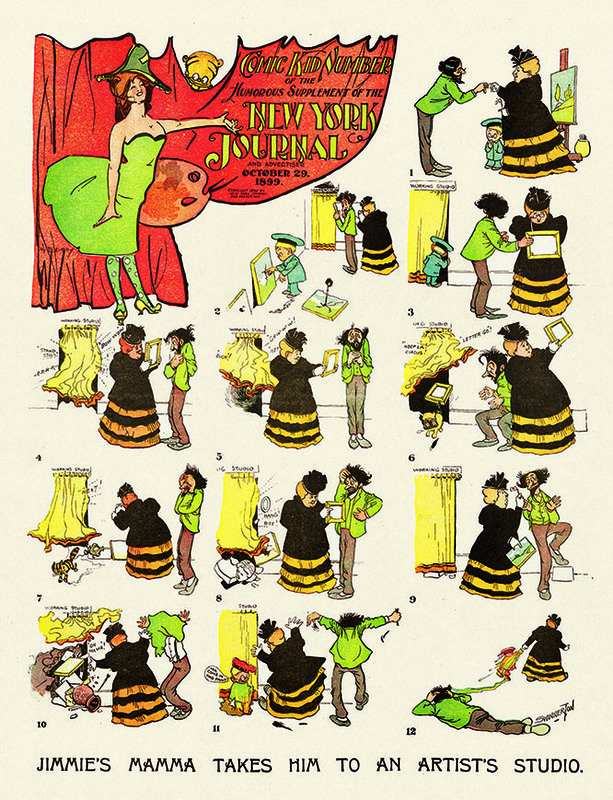 Often the only clues to the answers were provided in the illustrations. 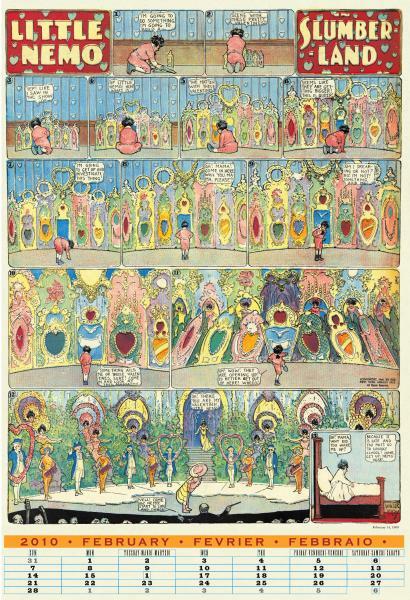 The events chronicled by the Queer Visitors series begin shortly after the end of The Marvelous Land of Oz . 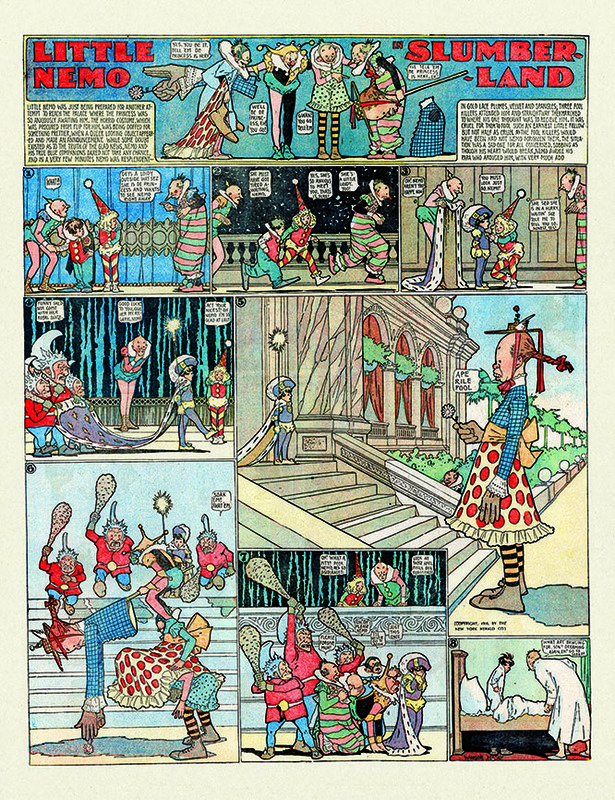 Ozma, the new ruler of Oz, performs her first recorded act of international diplomacy. 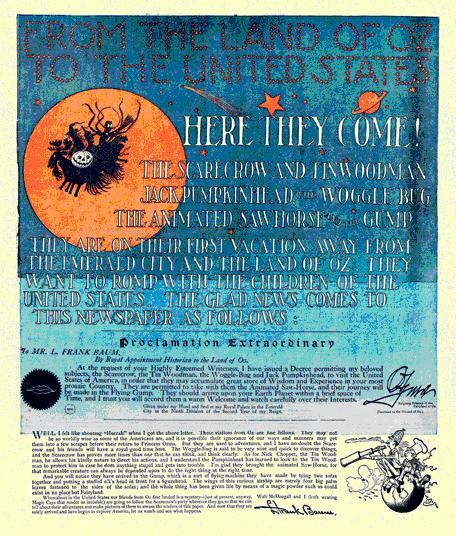 She authorizes the visit of the Scarecrow, the Tin Woodman, Jack Pumpkinhead, the Saw-Horse, and the Wogglebug to the United States of America. 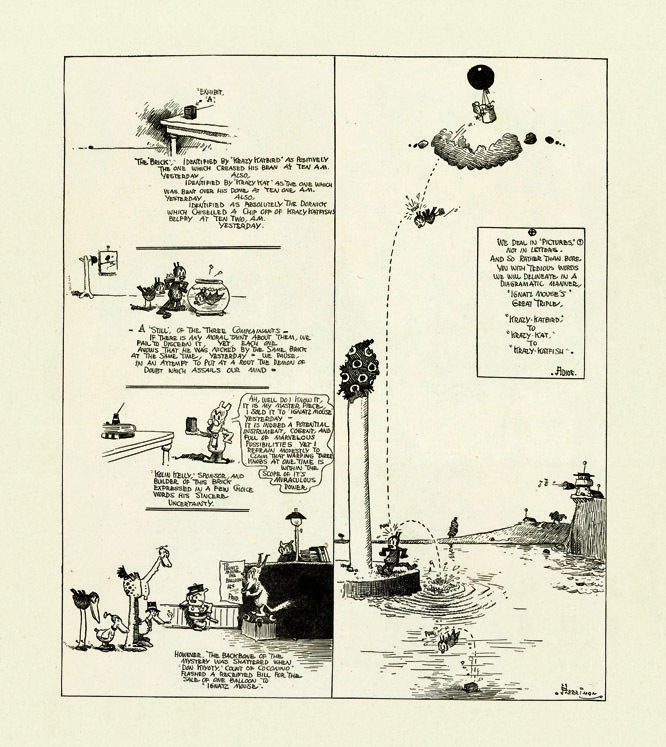 The flying contraption known as the Gump had been taken apart toward the end of the second Oz book, but has been reassembled to provide transport to the USA. 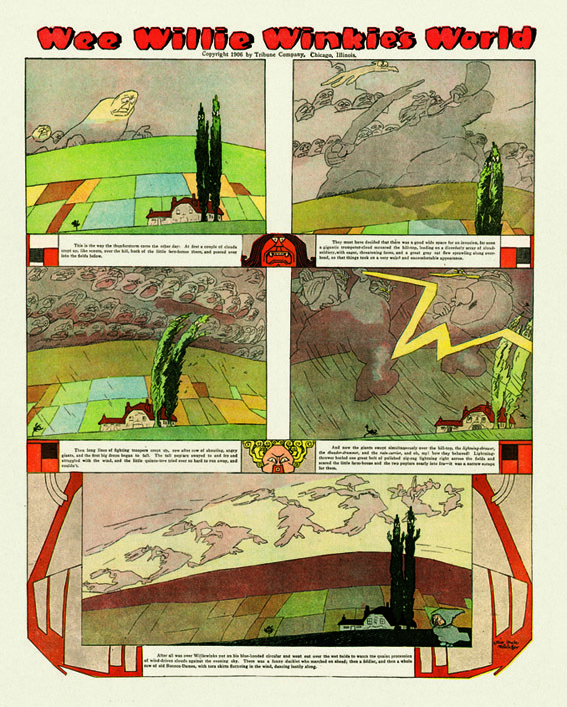 One curious aspect of the Queer Visitors stories is Baum's conception of the location of the Land of Oz. 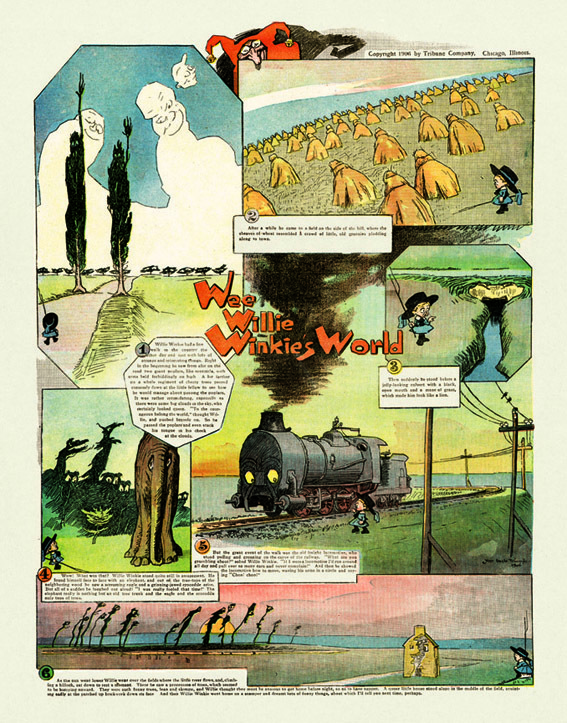 In The Wonderful Wizard of Oz and The Marvelous Land of Oz, a broad desert separates Oz from Kansas and the rest of our "Great Outside World." 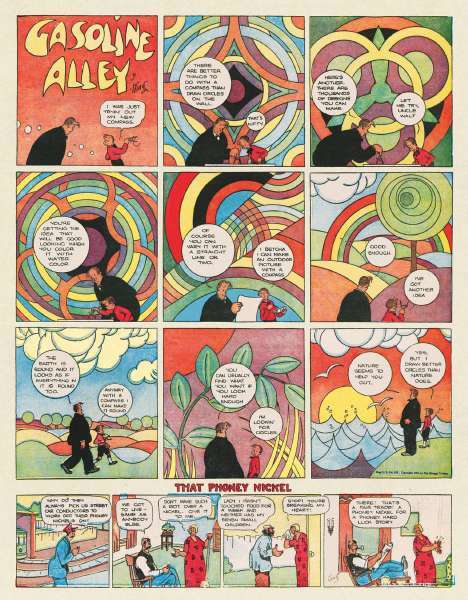 But in Queer Visitors, Oz seems to be located somewhere far off in the Milky Way galaxy or even beyond. 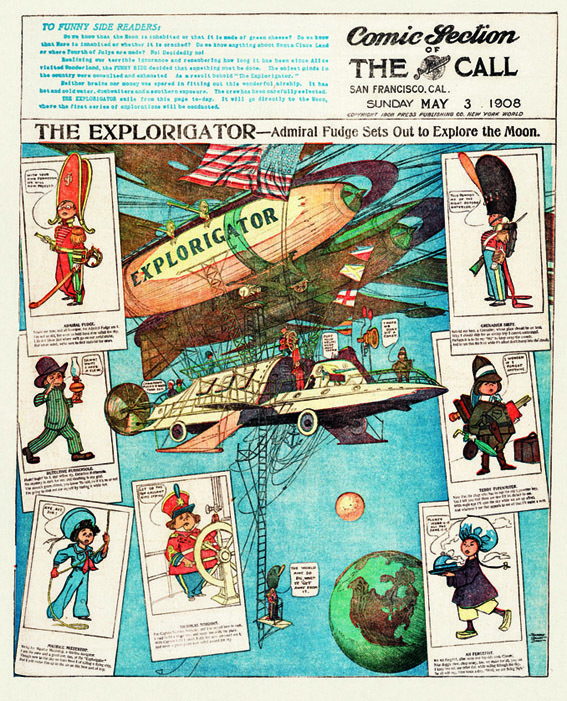 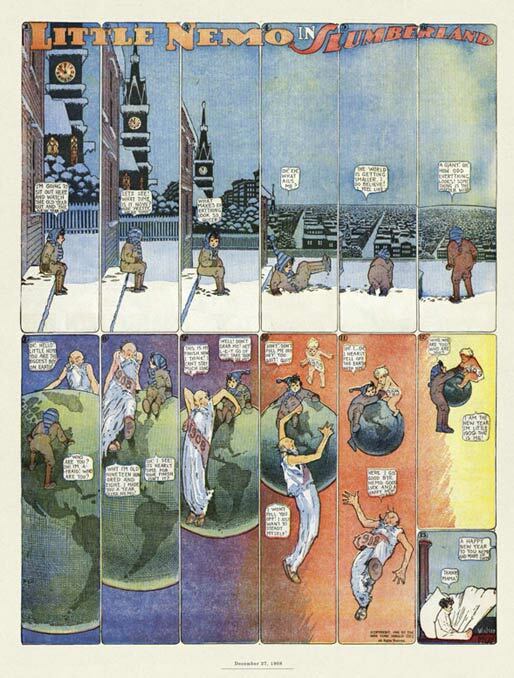 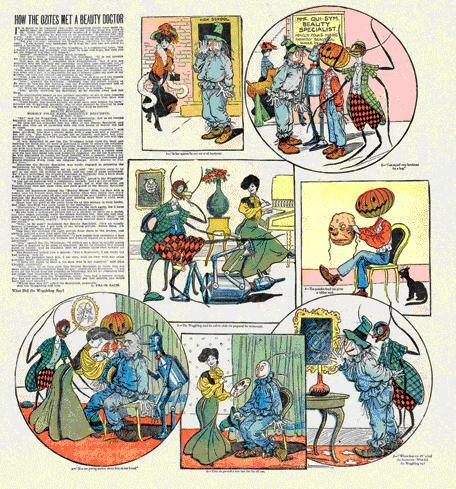 Newspaper articles announcing the series detail the Oz characters' visits to several constellations, the North Star, and five planets on their approach to the United States; and Ozma's "Proclamation Extraordinary" mentions their arrival on "your earth planet." 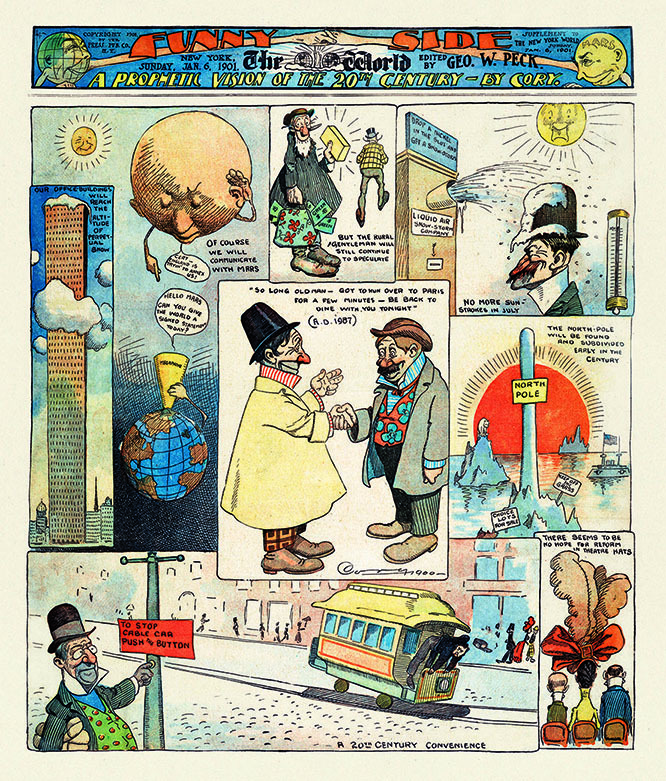 At the turn of the century, Walt McDougall was working simultaneously for three rival newspapers. 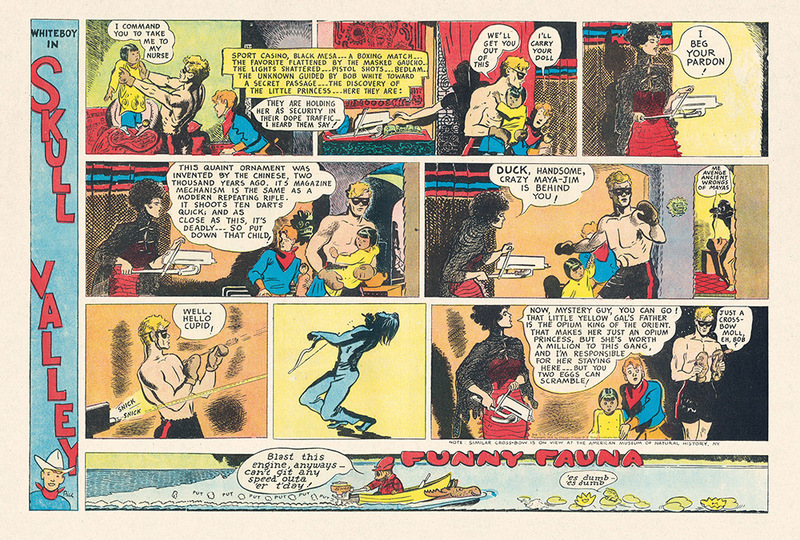 This was not a "First" though: at the time this mercenary behavior was apparently quite common. 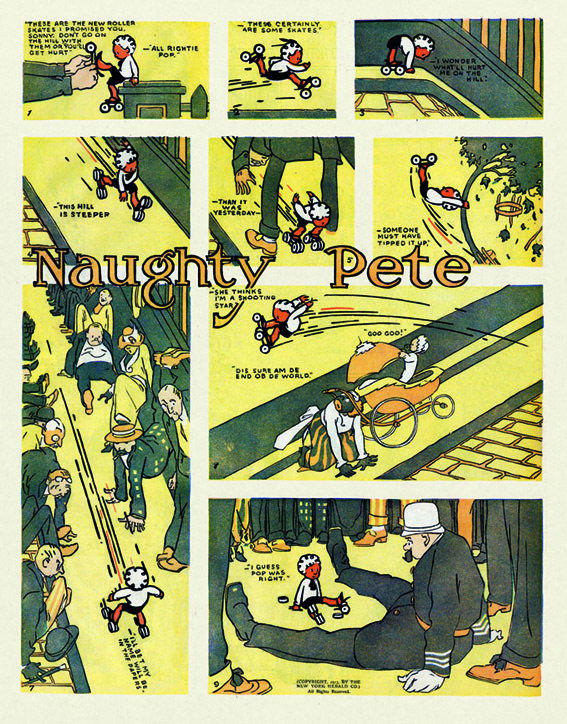 He occasionally contributed to the New York Herald "Colored Section," to the New York World "Humor Section," and to the New York Journal "American Humorist" supplement. 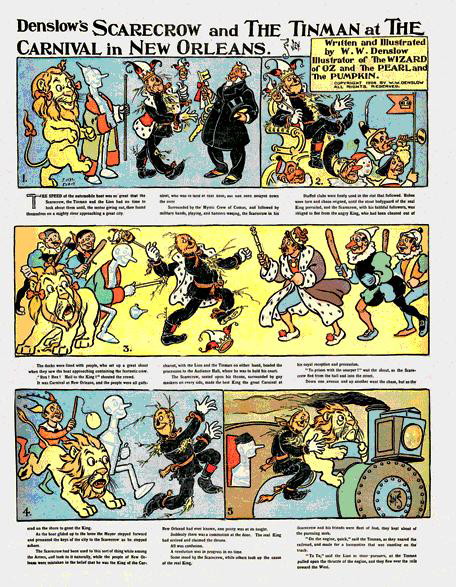 For the latter two papers, he produced both the front-page cartoon and one-shot gags. 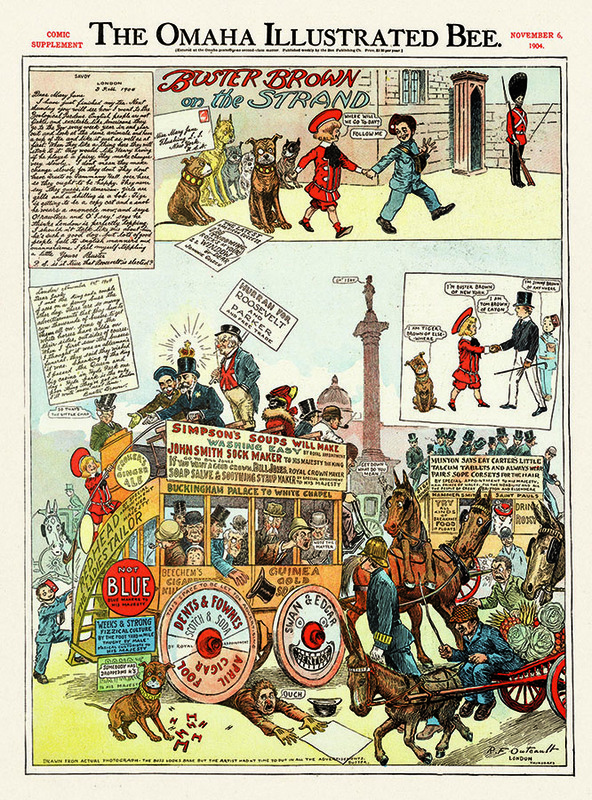 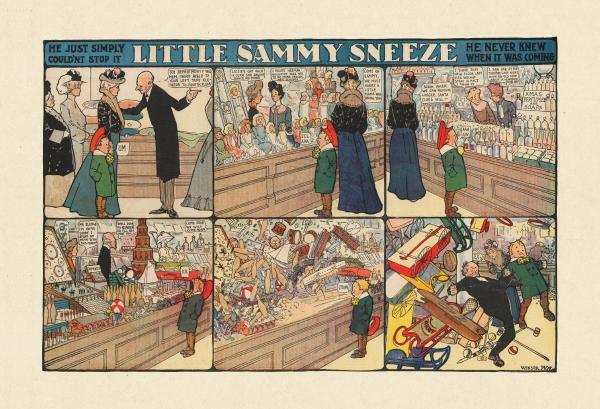 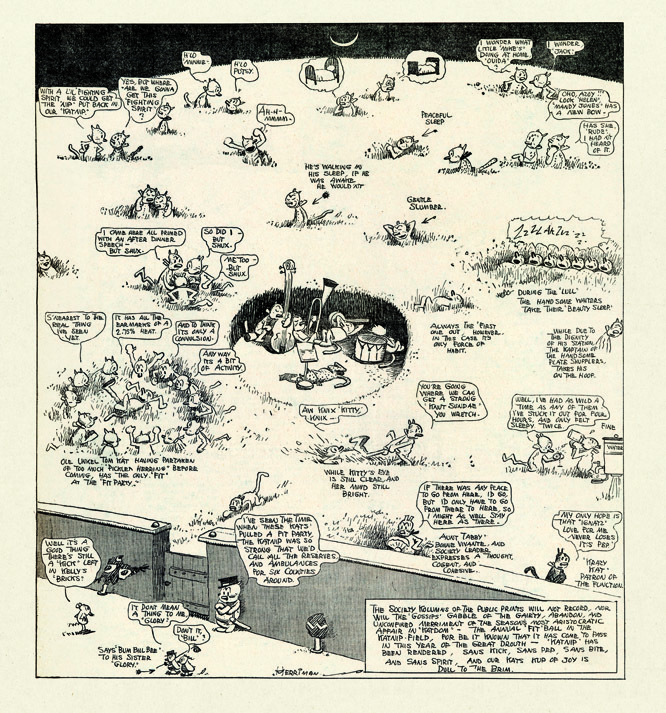 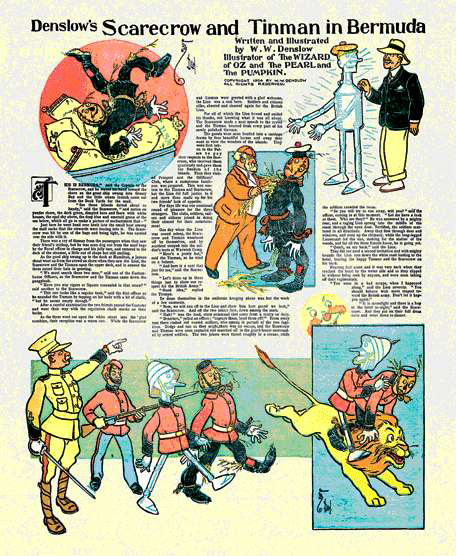 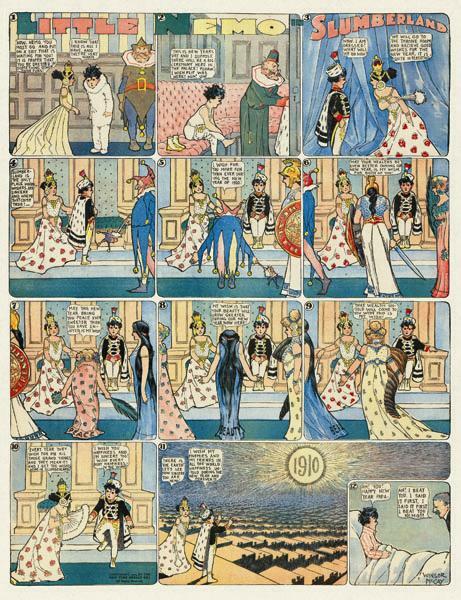 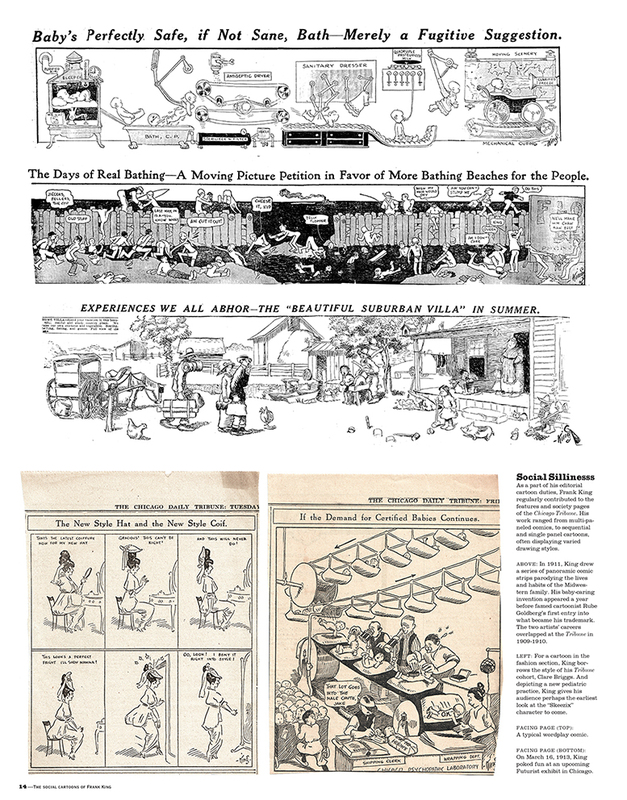 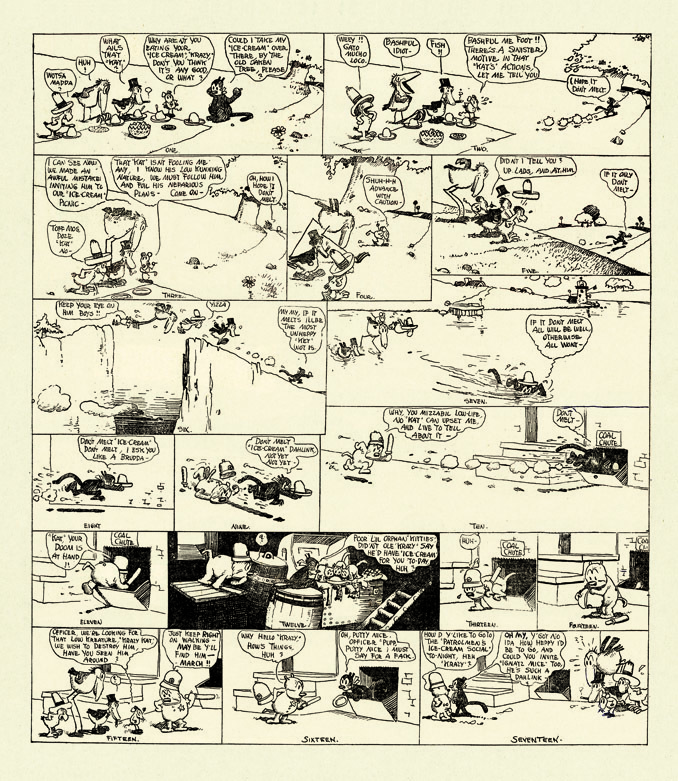 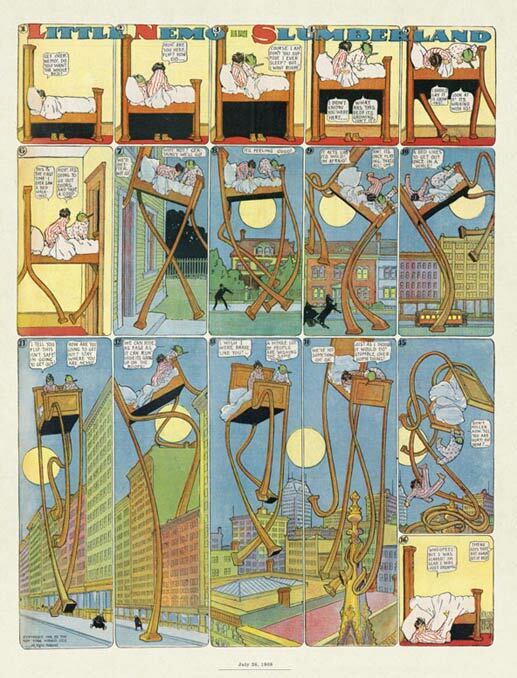 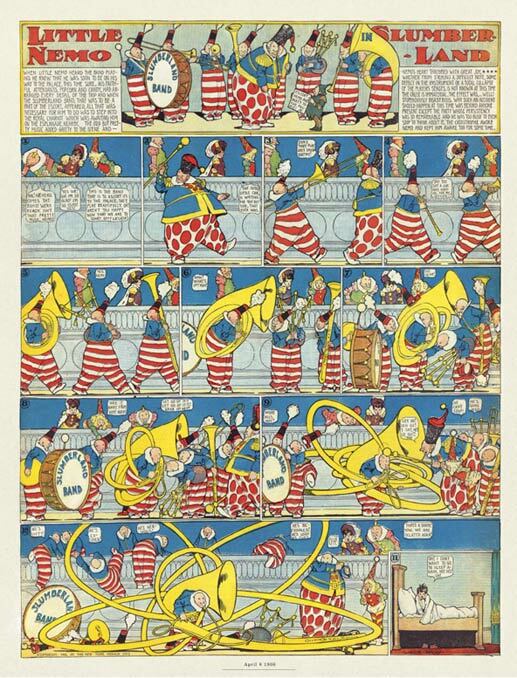 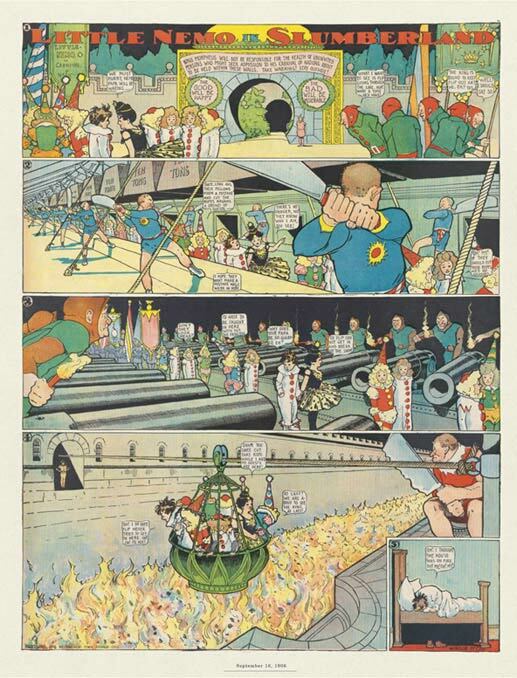 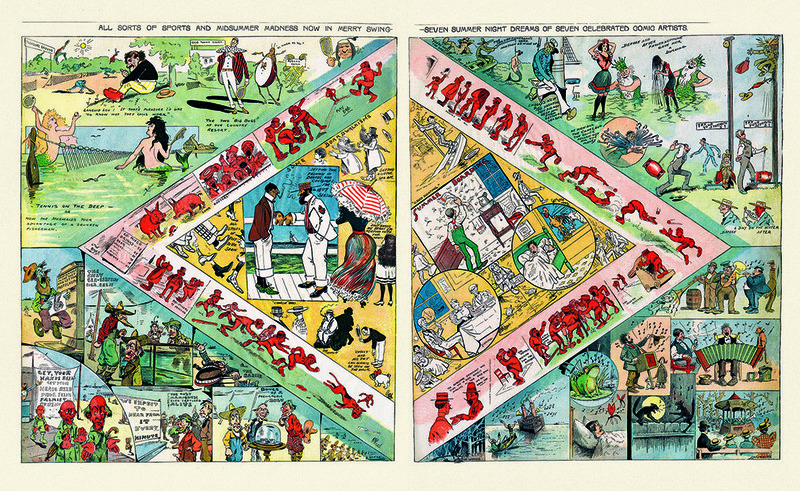 In 1898, for The Humorist , he drew the biggest cartoon ever, taking up two full pages. 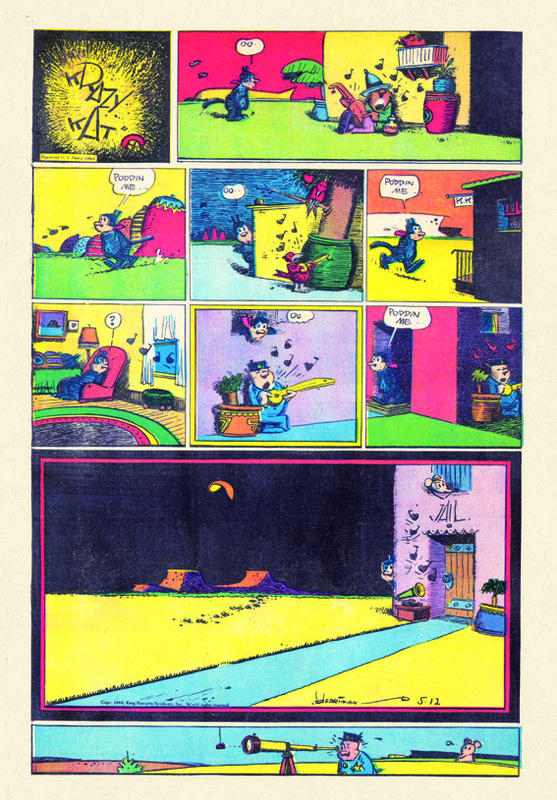 Some of these pages were extraordinarily prophetic. 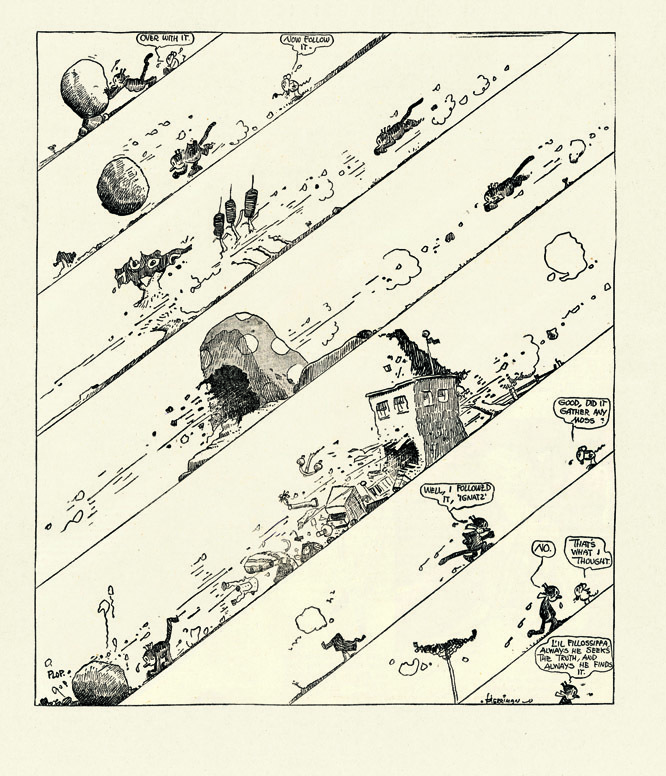 In what is perhaps another "First," McDougall created cartoons concerning pollution, the frantic pace of living, and even air traffic congestion - imagining a sky crowded with airships. 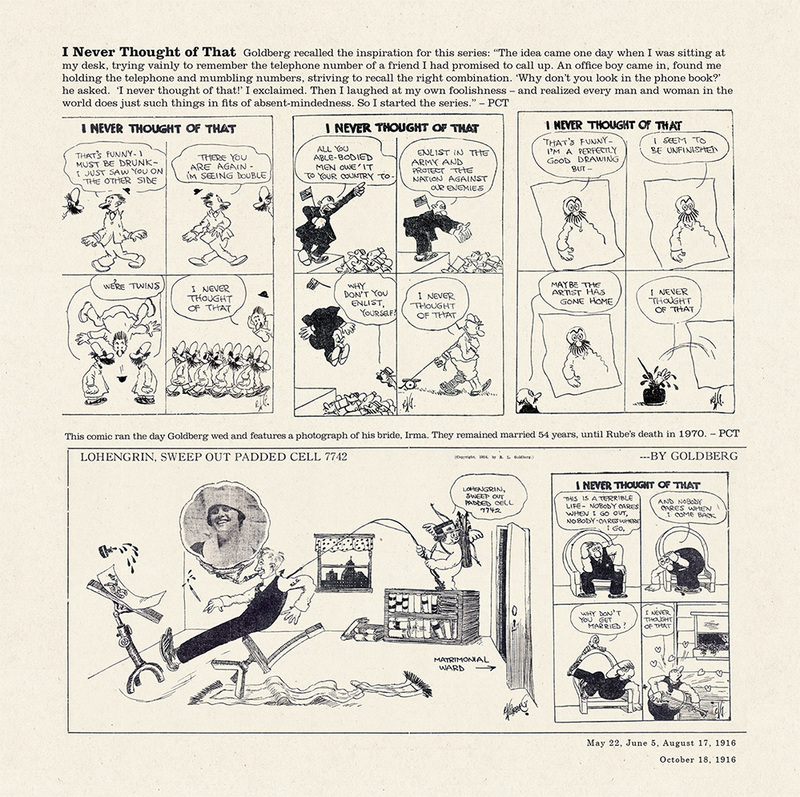 At the same time, he authored a daily editorial cartoon and a handful of Sunday series with recurring characters such as Fatty Felix, Chatterton, Professor Jyblits , and, of course, Queer Visitors from the Marvelous Land of Oz , for which he was paid the then enviable figure of one thousand dollars a month. 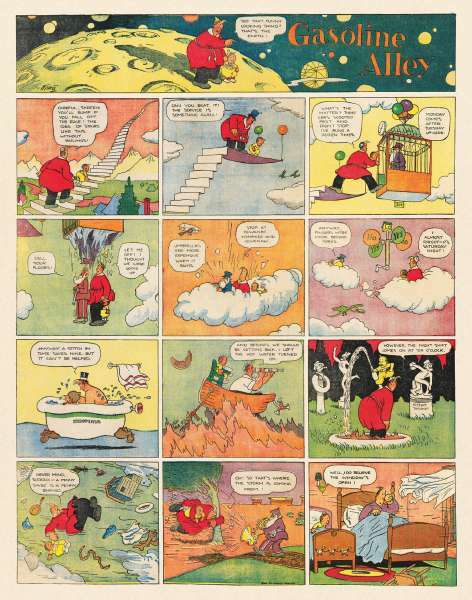 As if this prolific work weren't enough, he created and self-syndicated the series Good Stories for Children. 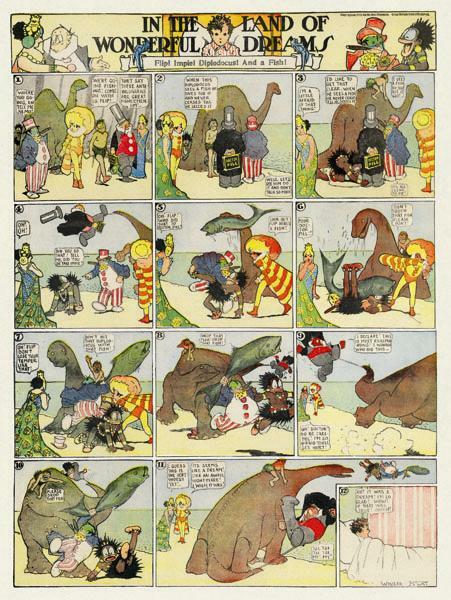 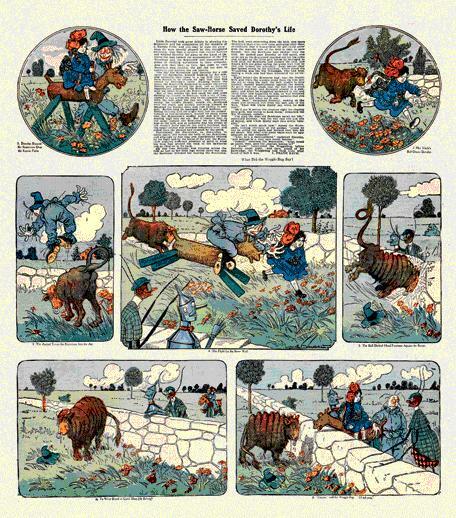 Walt liked fairy tales: in 1890 he illustrated Comic Animals for Charles E. Graham & Co, and in 1903, the Rambillicus Book , a collection of narratives for young people published by George W. Jacobs and Company of Philadelphia. 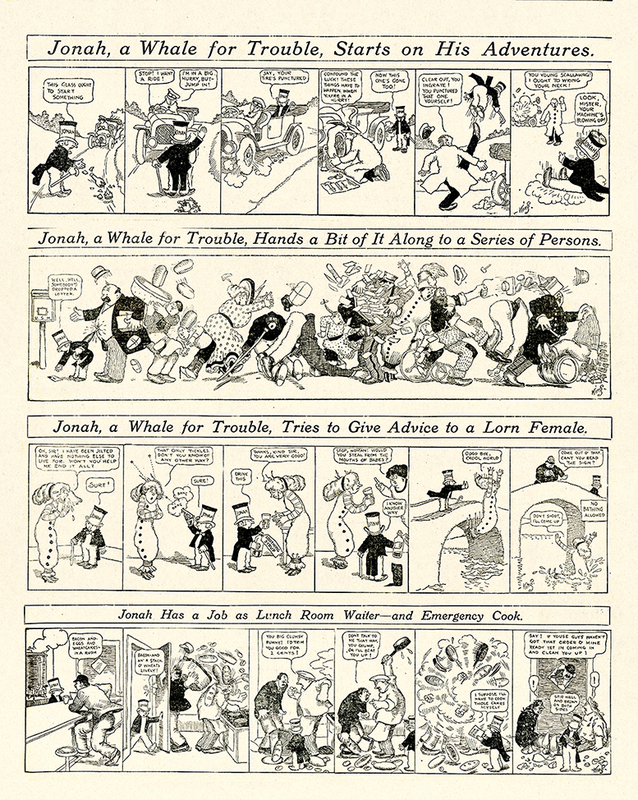 McDougall had obtained a position of total creative independence, and the power of his satire had considerably grown; he was rebuked by the Supreme Court for a cartoon showing justices chewing tobacco, and was arrested "about once a month" for libeling Mayor Reyburn of Philadelphia. 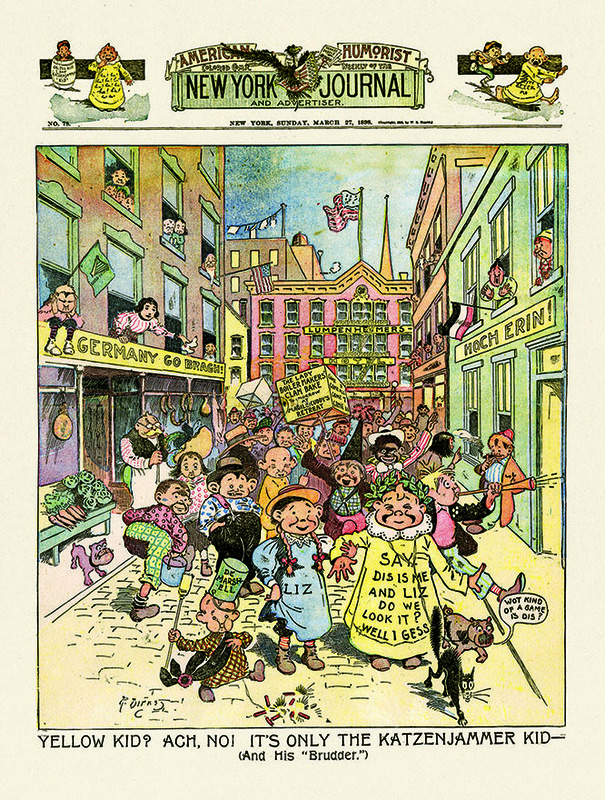 According to the stories, local politicians offered Walt $1,500.00 to stay out of town in the crucial weeks of the 1904 presidential campaign. 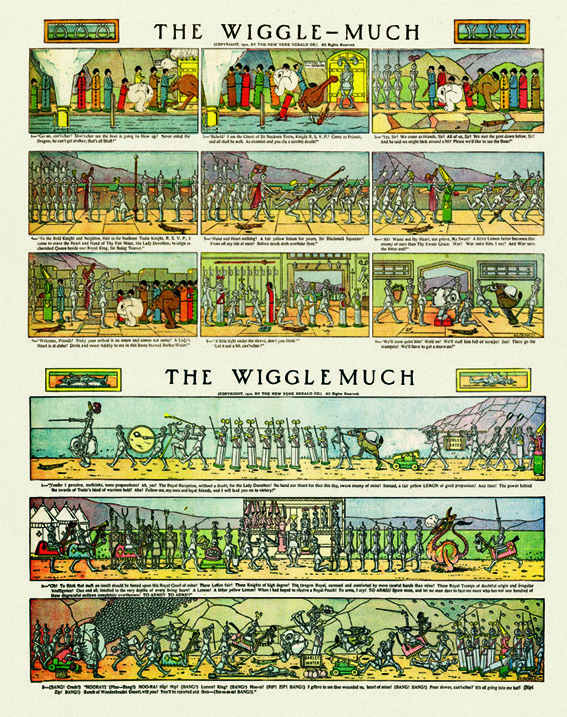 But friction had developed between McDougall and Wanamaker, and in 1905 McDougall left the North American for what he called in his biography, "a trolley park". 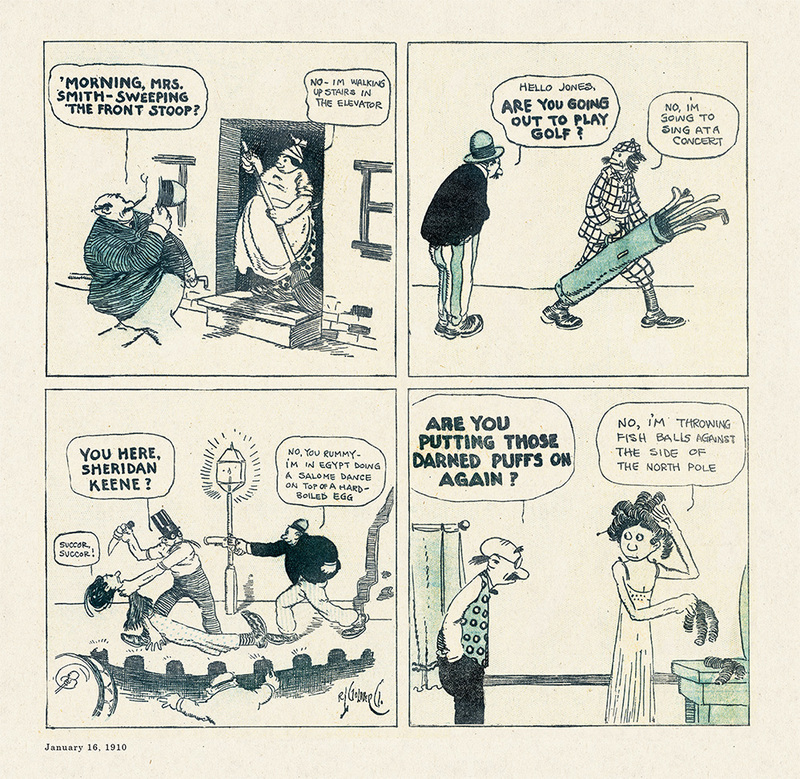 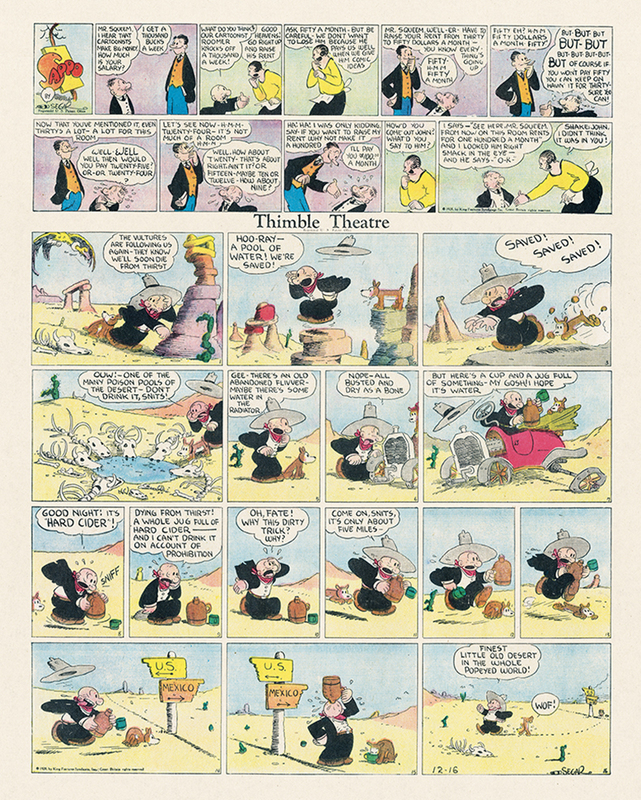 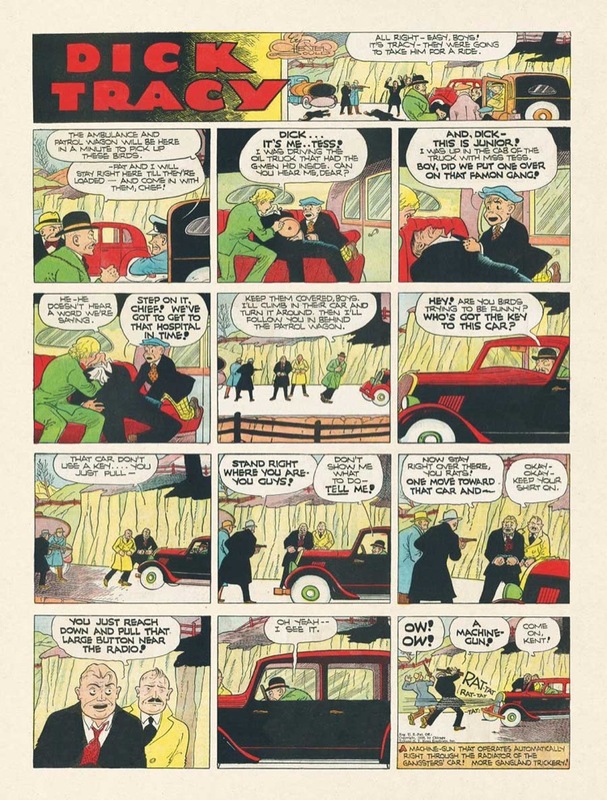 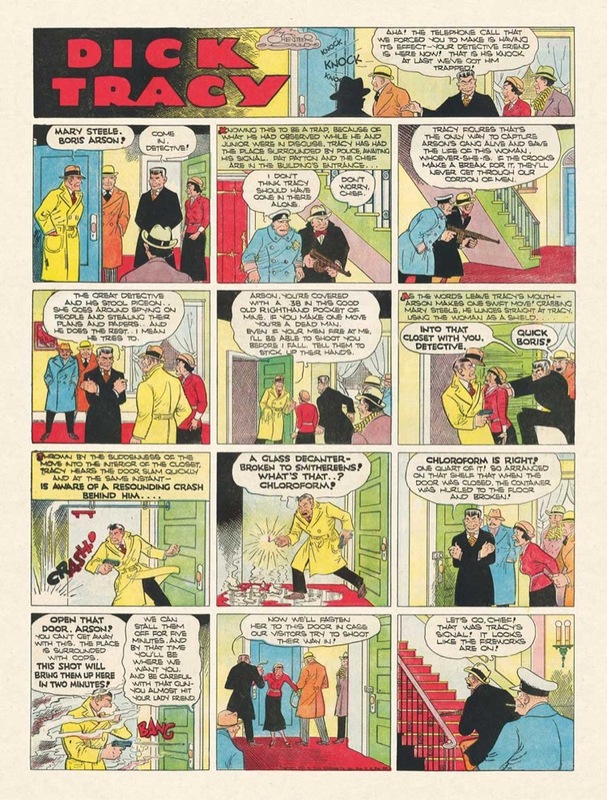 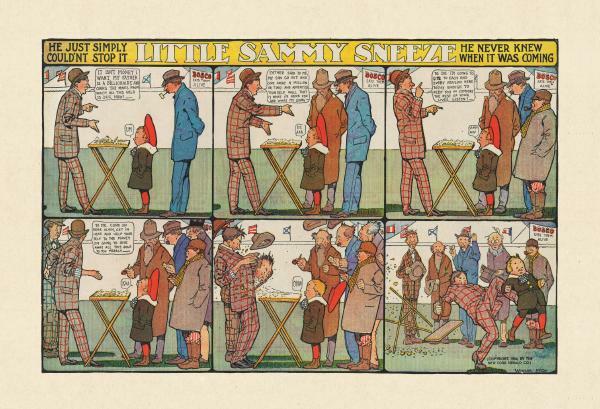 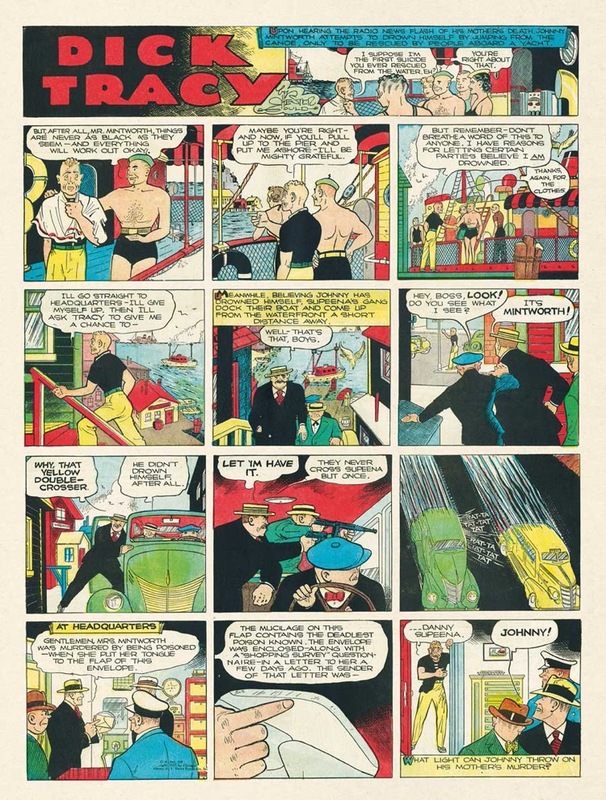 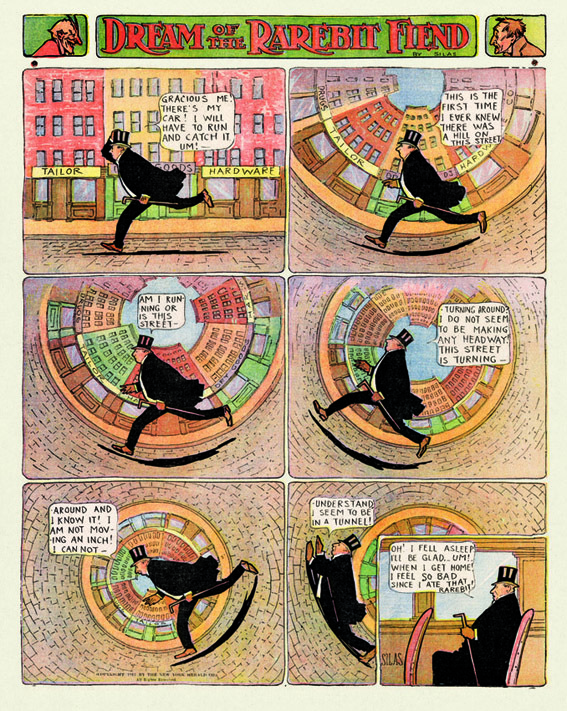 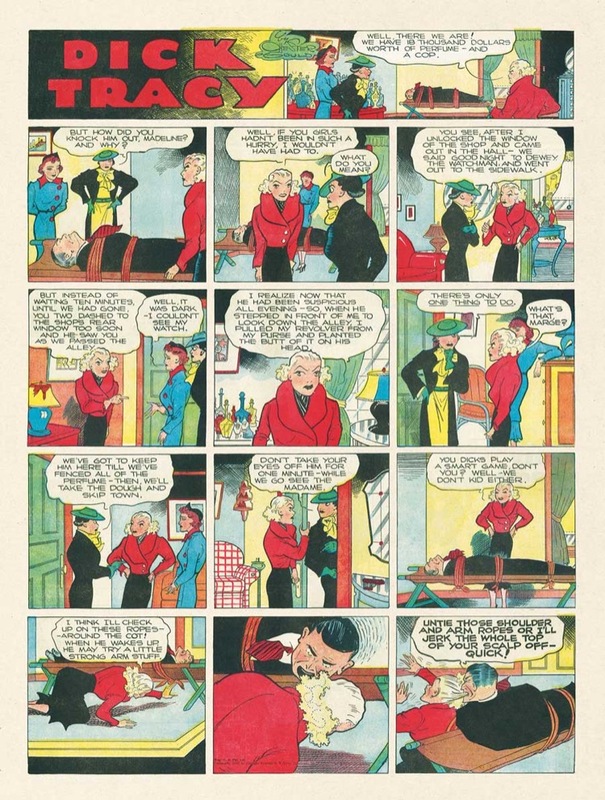 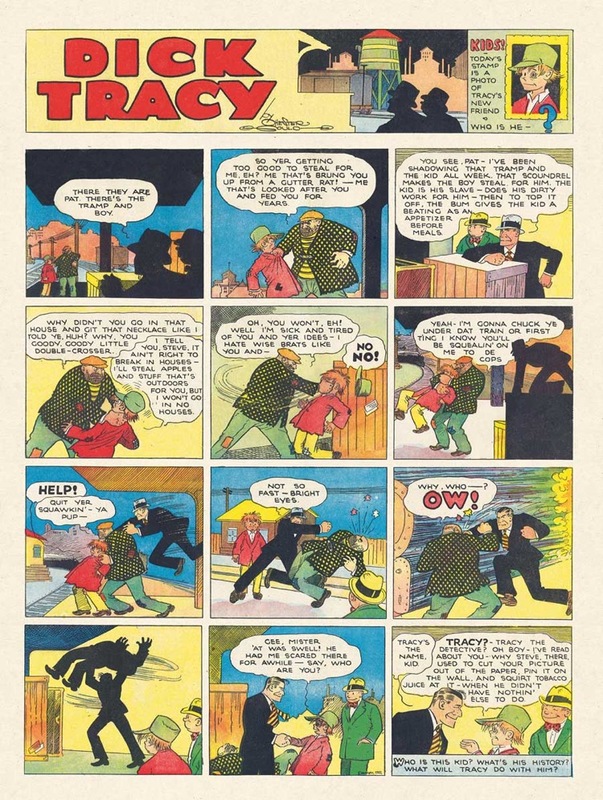 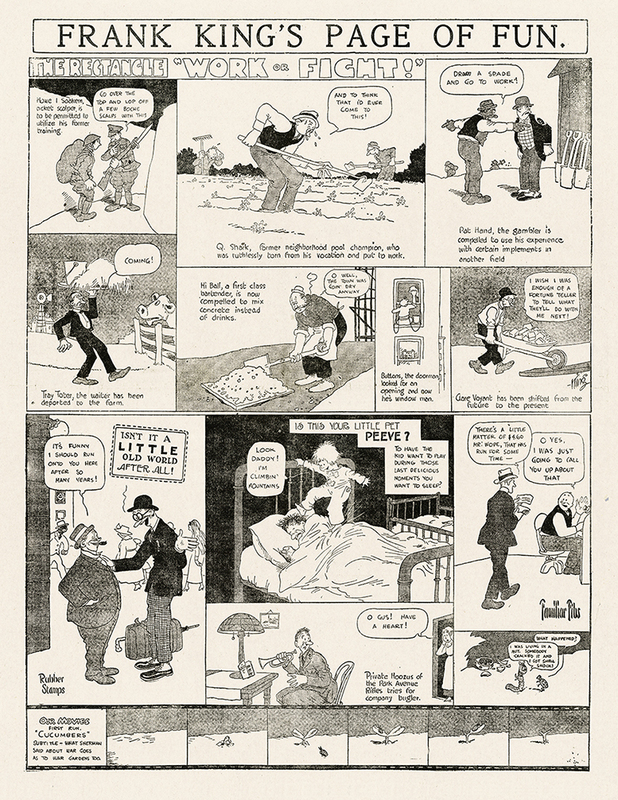 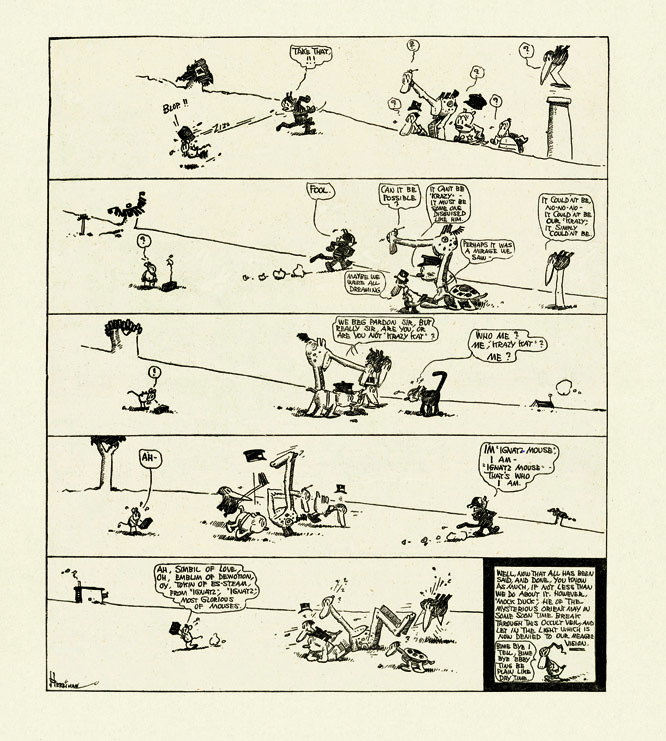 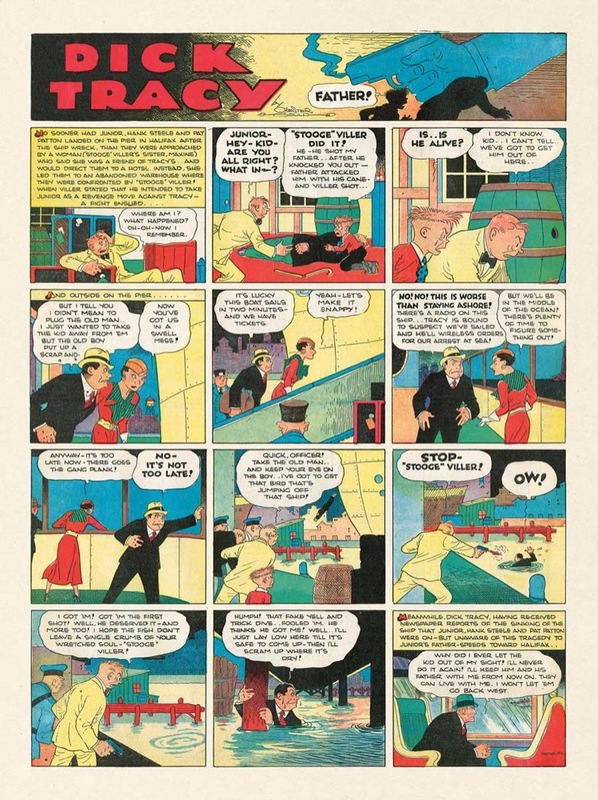 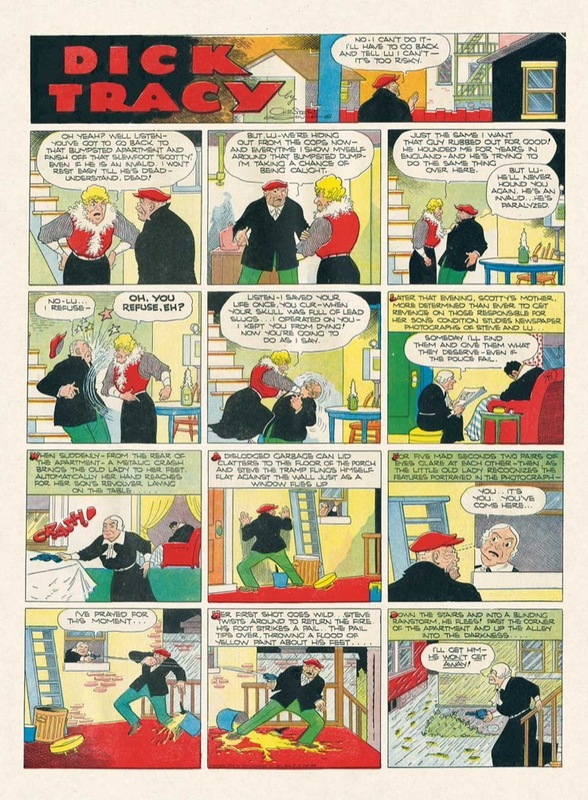 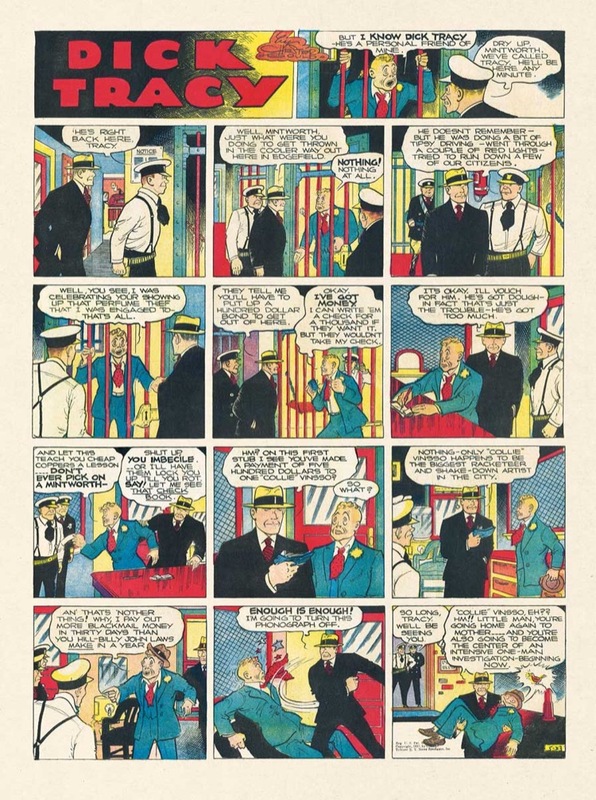 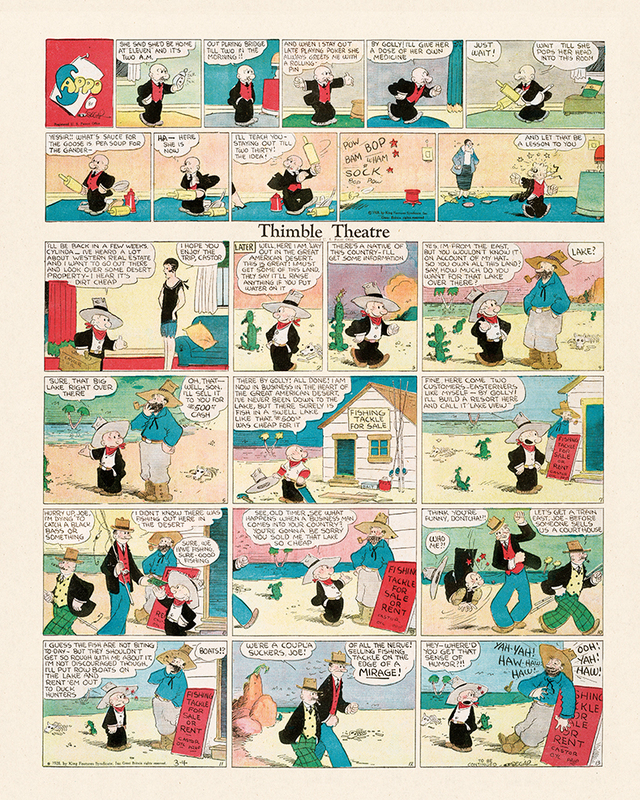 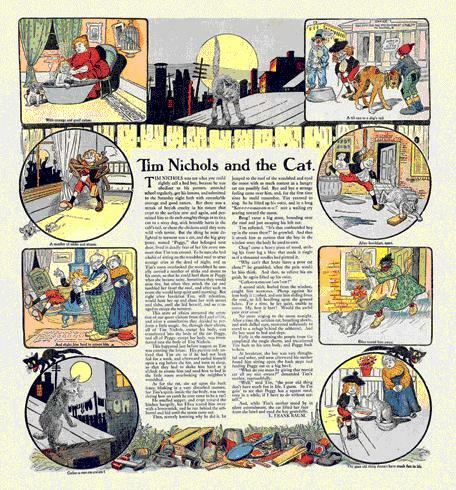 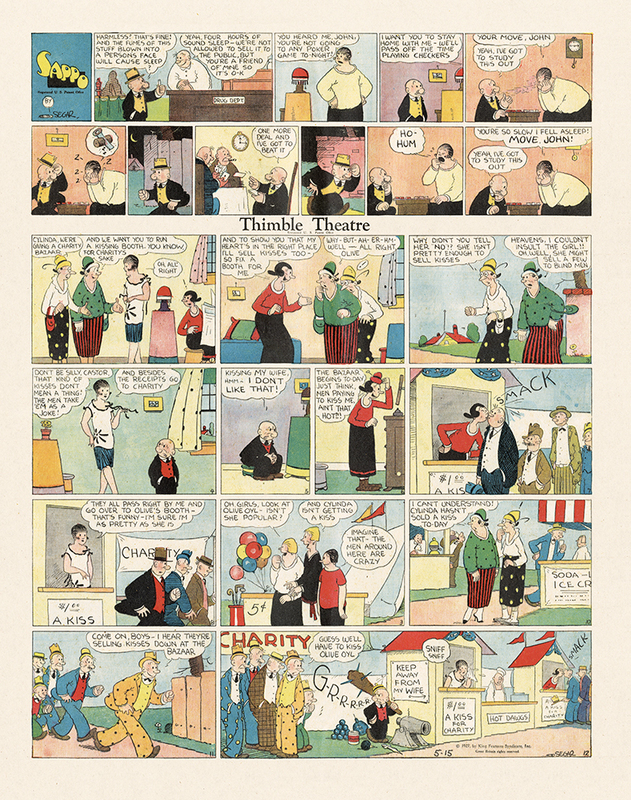 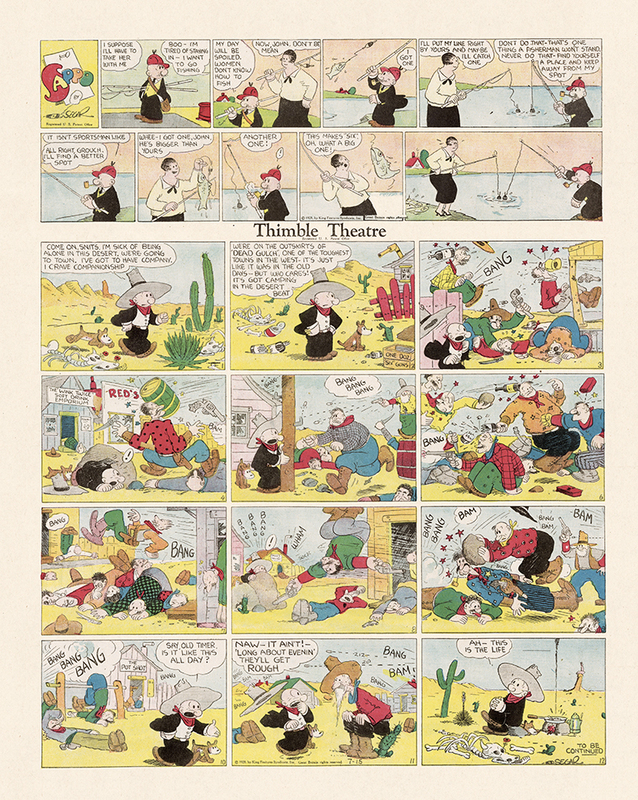 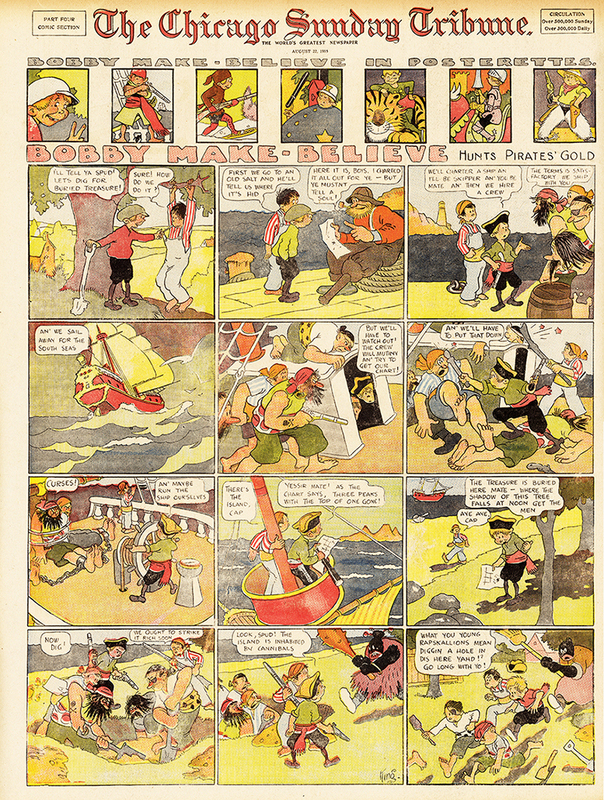 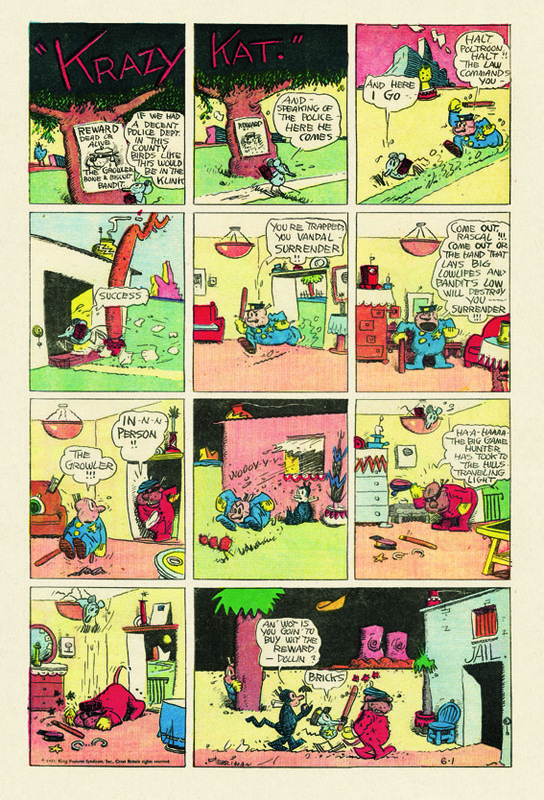 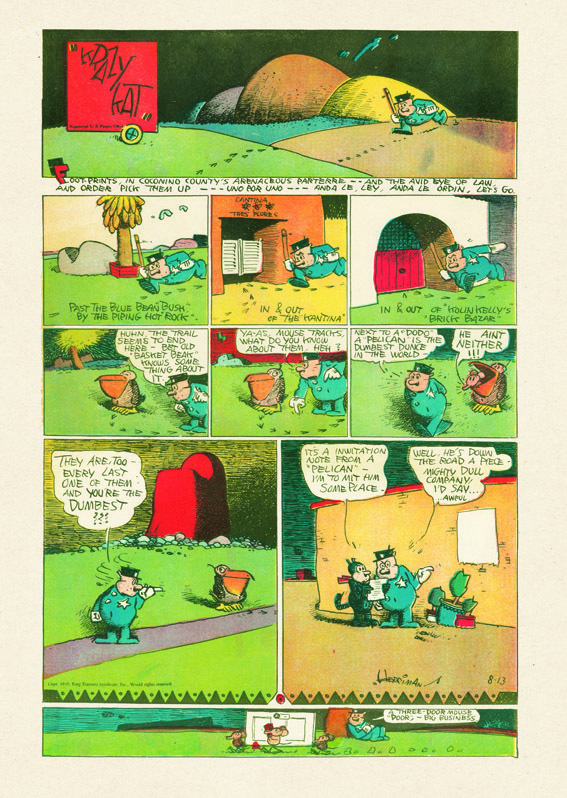 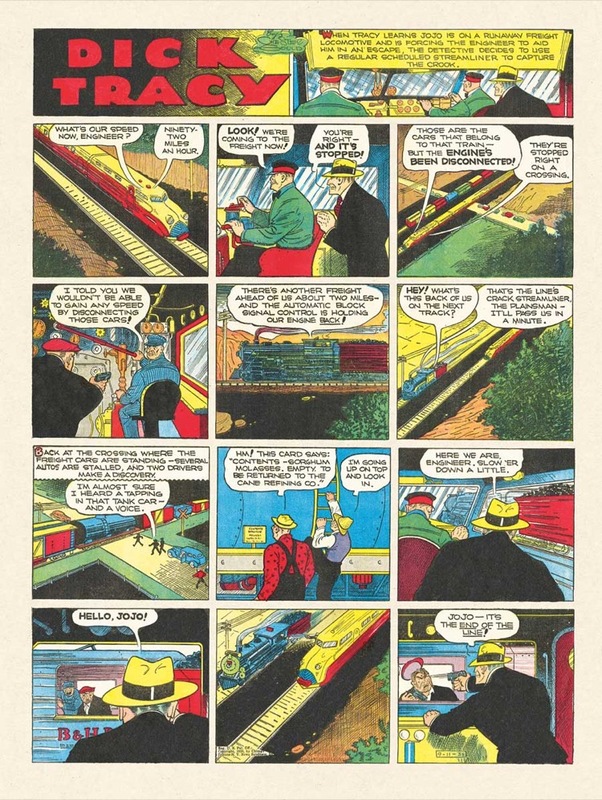 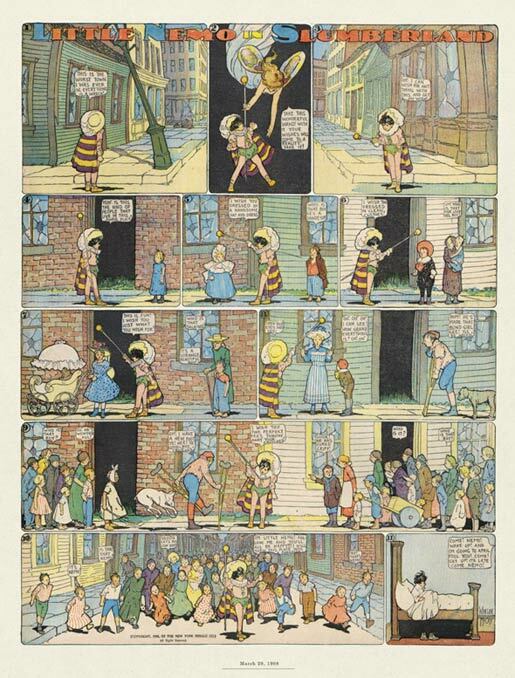 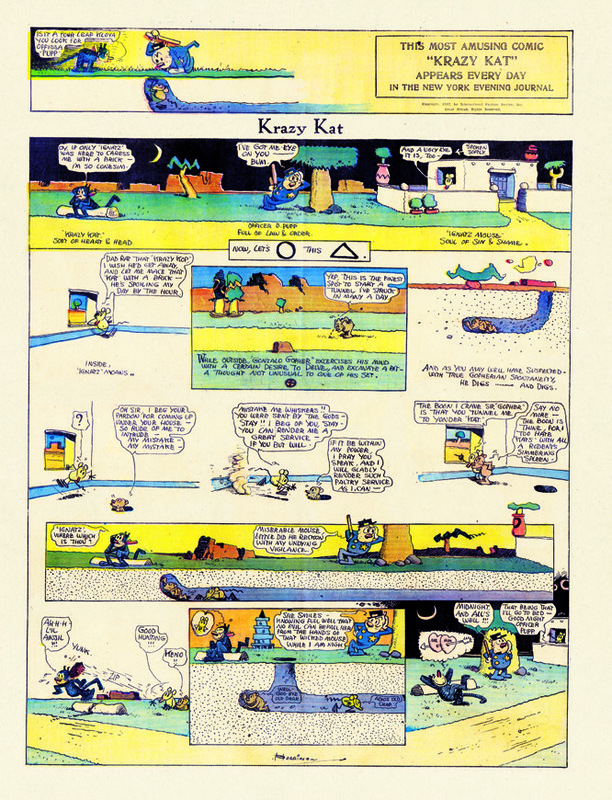 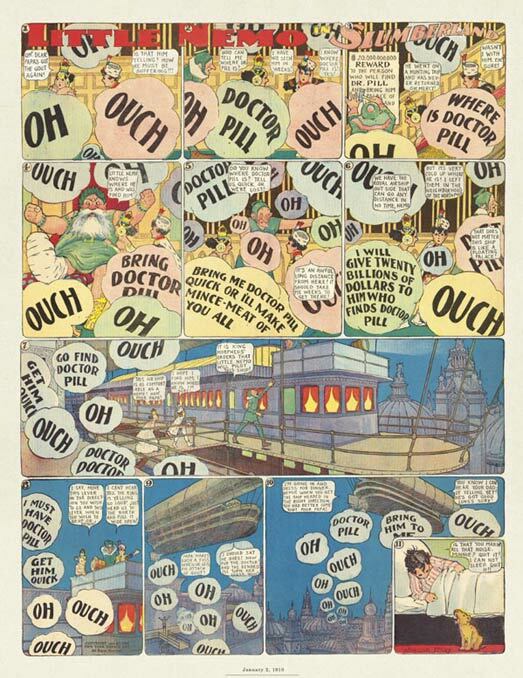 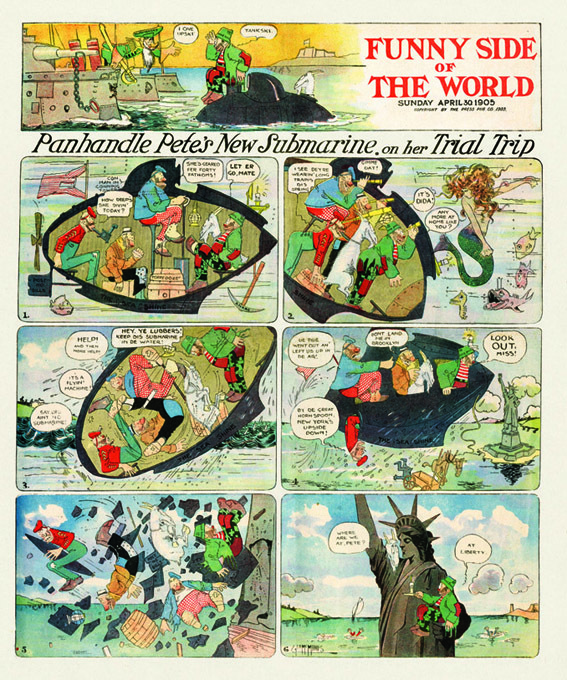 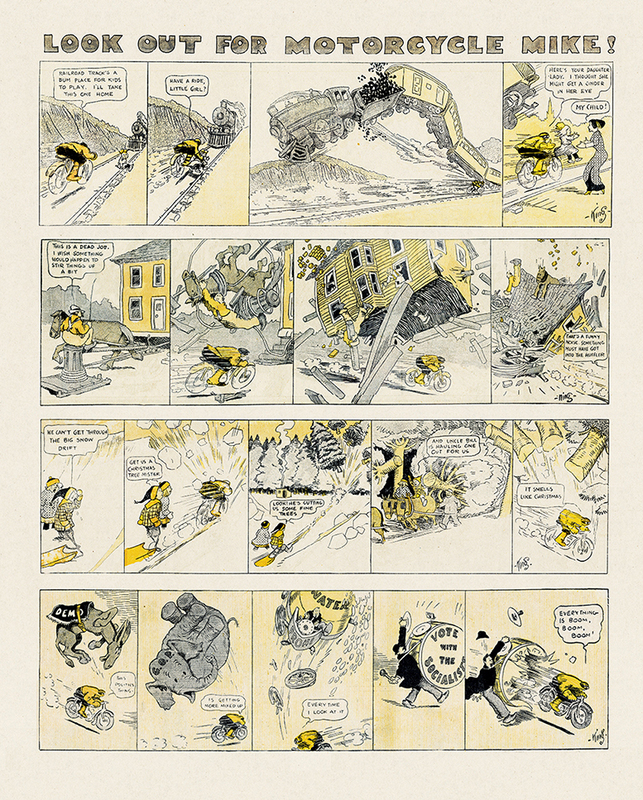 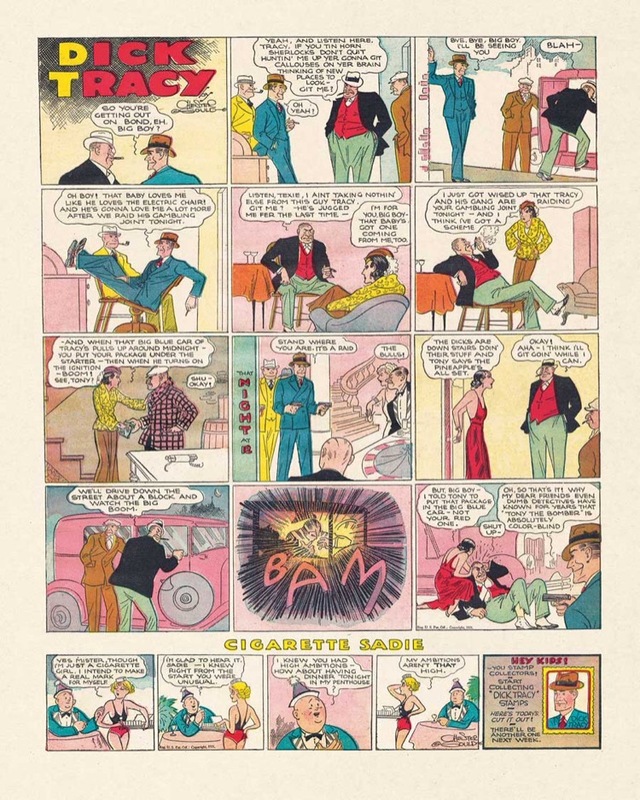 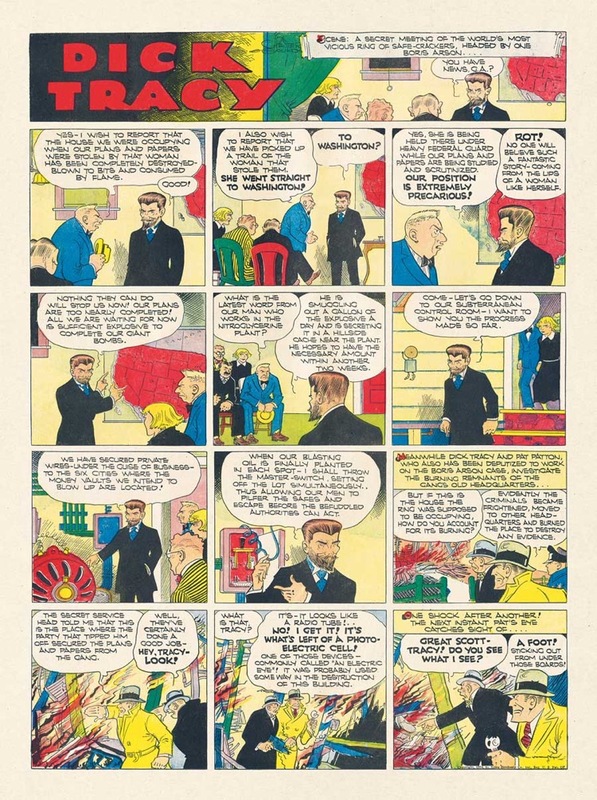 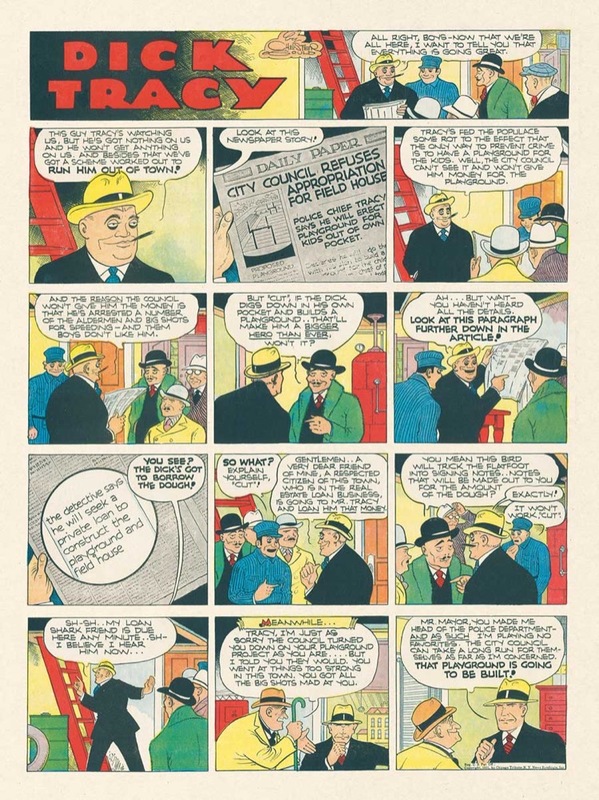 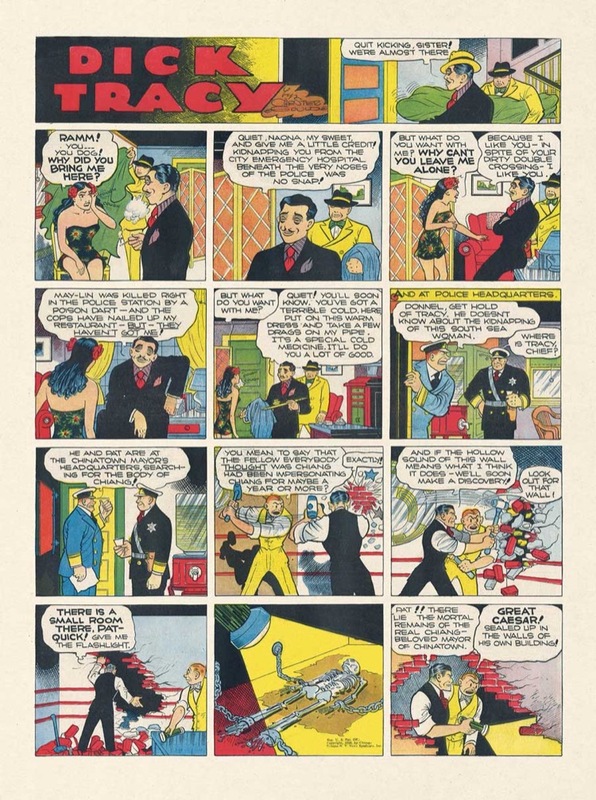 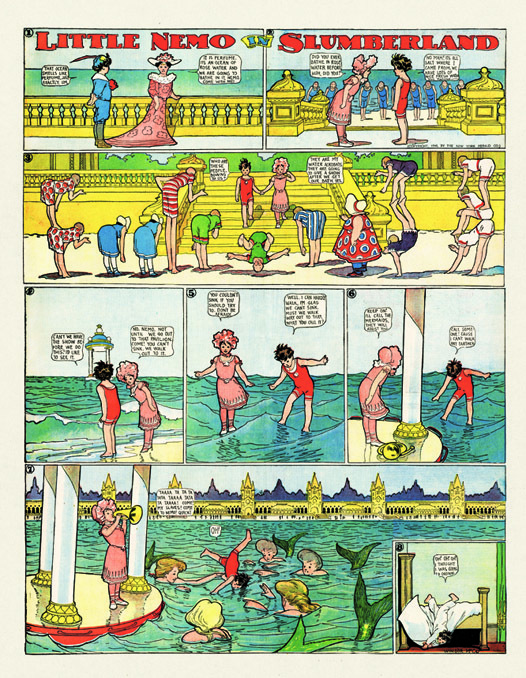 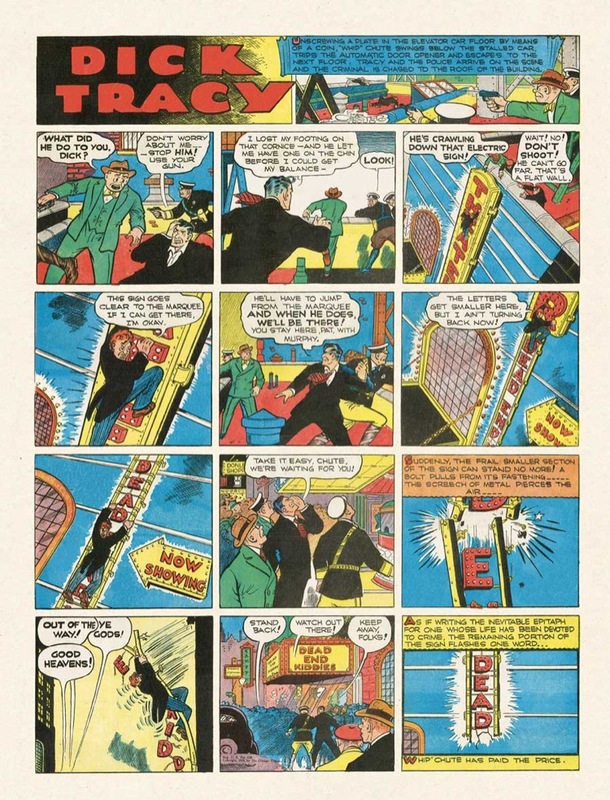 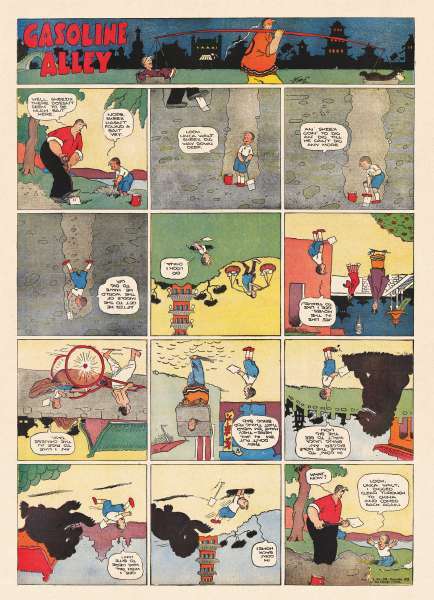 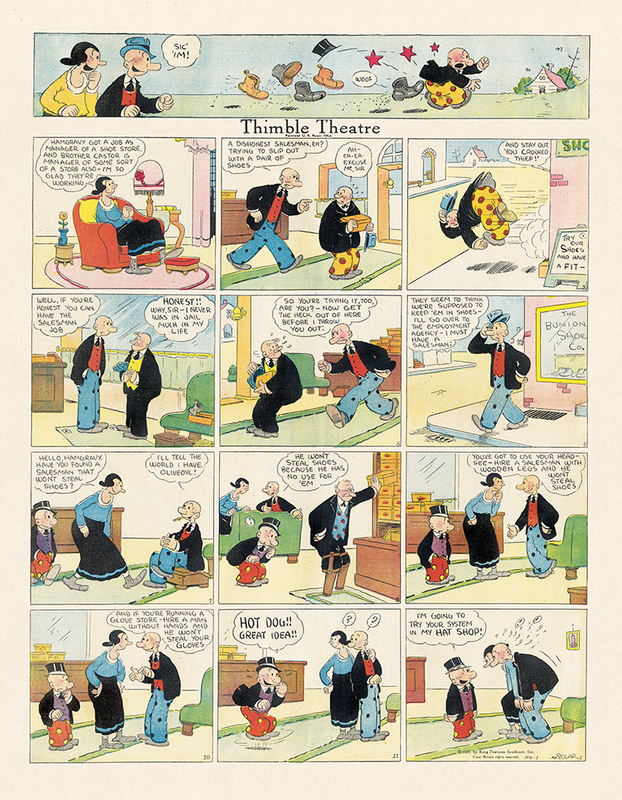 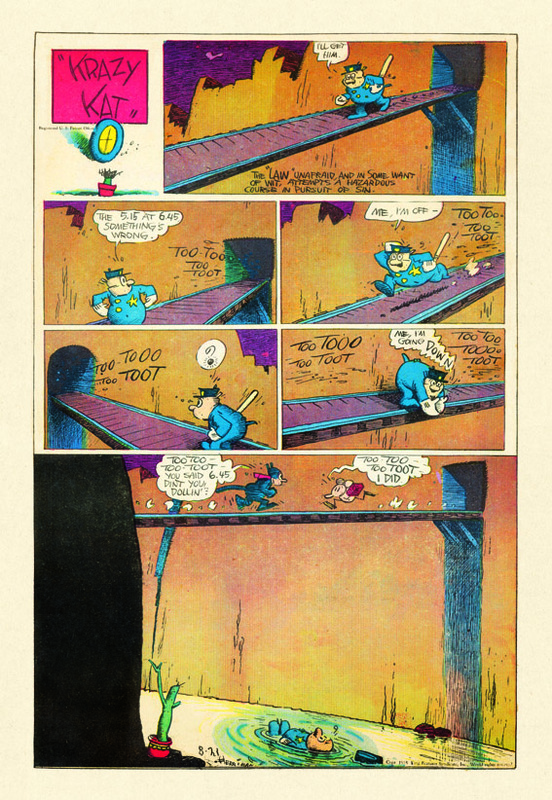 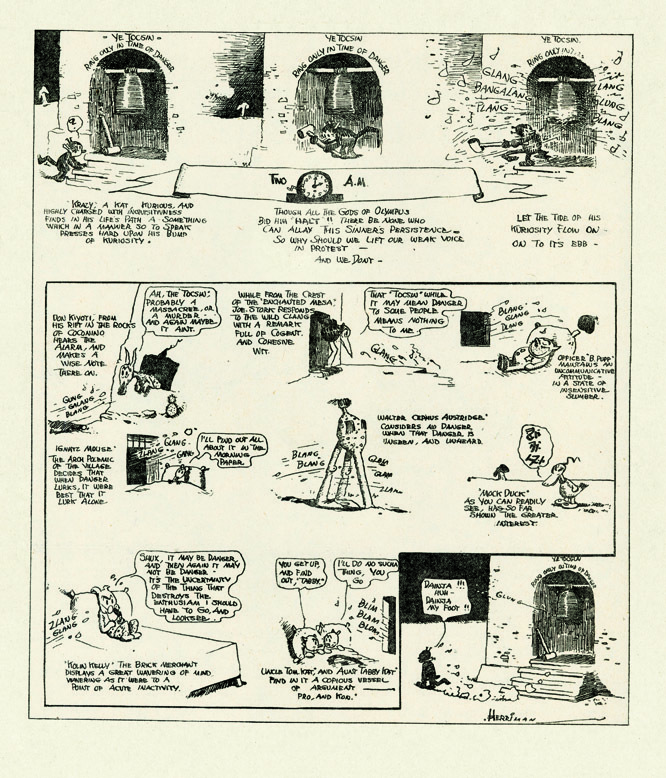 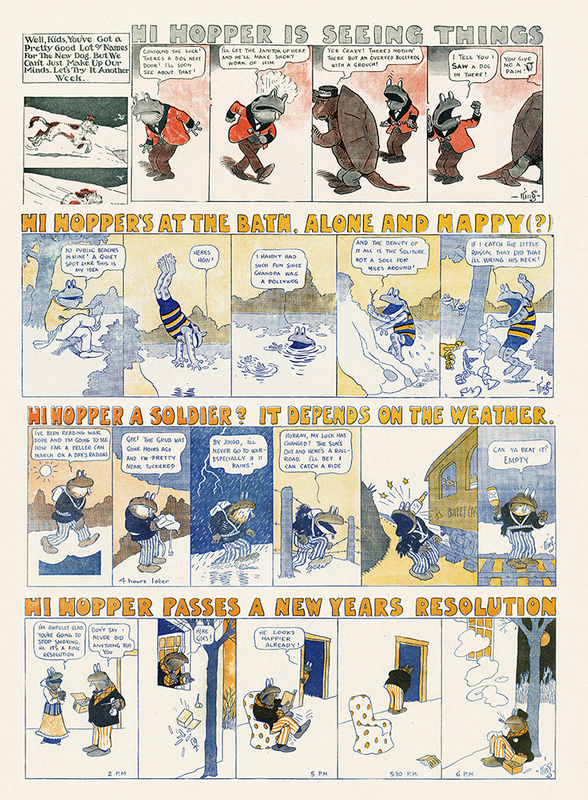 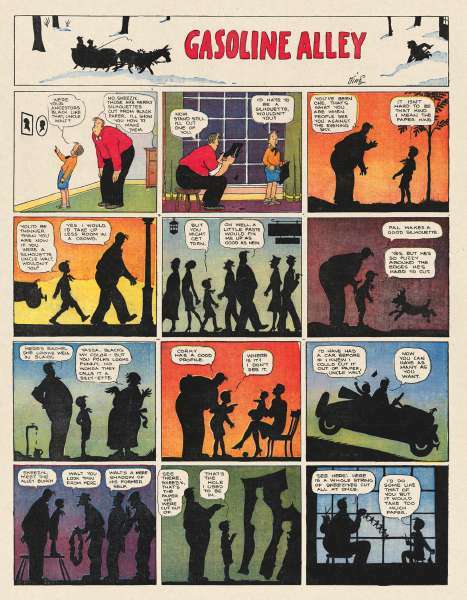 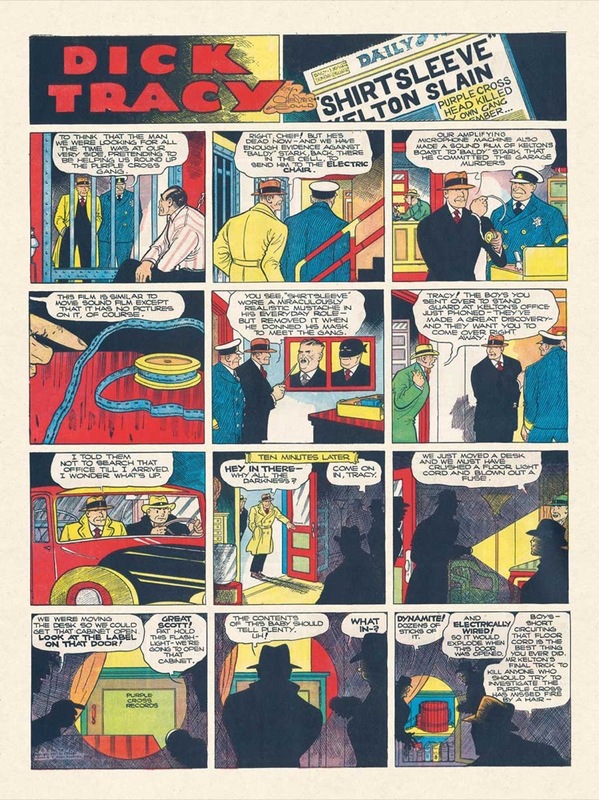 During the "Trolley Park" period, he created and self-syndicated Mr. Makepeace , a strip published three times a week, as well as another feature for the New York World . 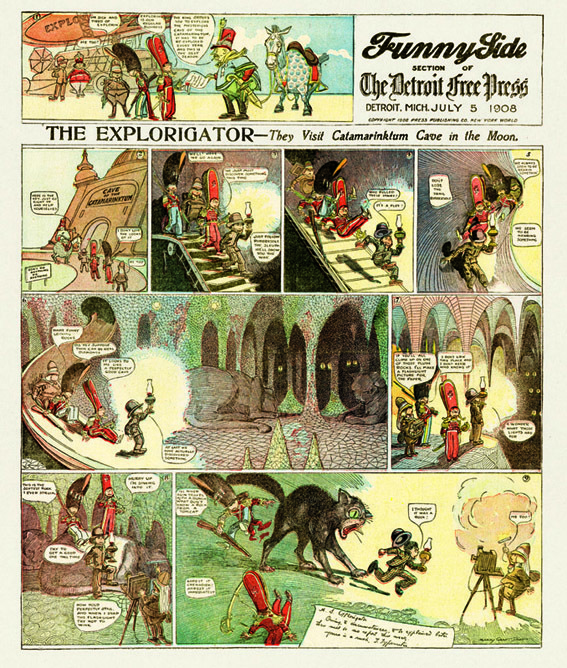 McDougall went back to the Philadelphia paper in 1906 and his Satires on Timely Topics started again. 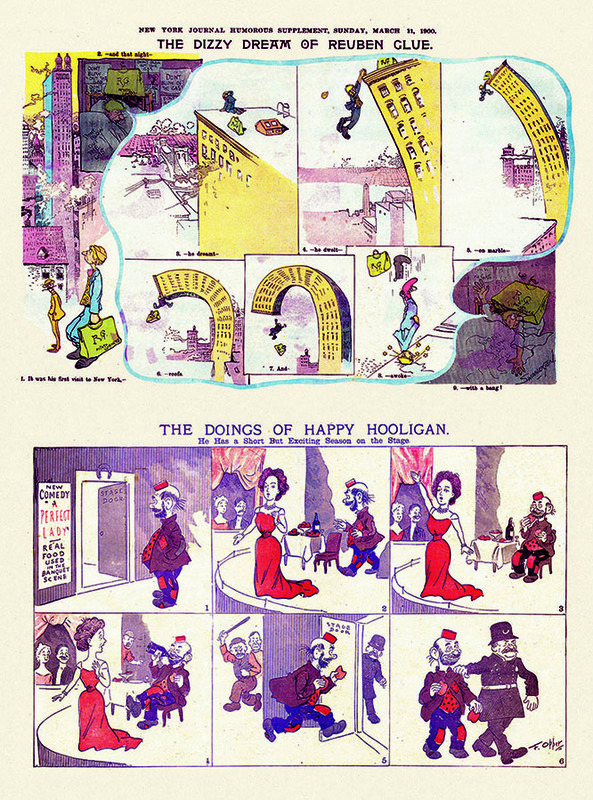 At this time, he also started Handsome Hautrey , a series starring a funny pair composed of a Commodore and his aide Faithful Fritz, a well as a comic version of Peck's Bad Boy , the eponymous character of George Peck's novel that, in 1875, had launched the literary figure of the young troublemaker. 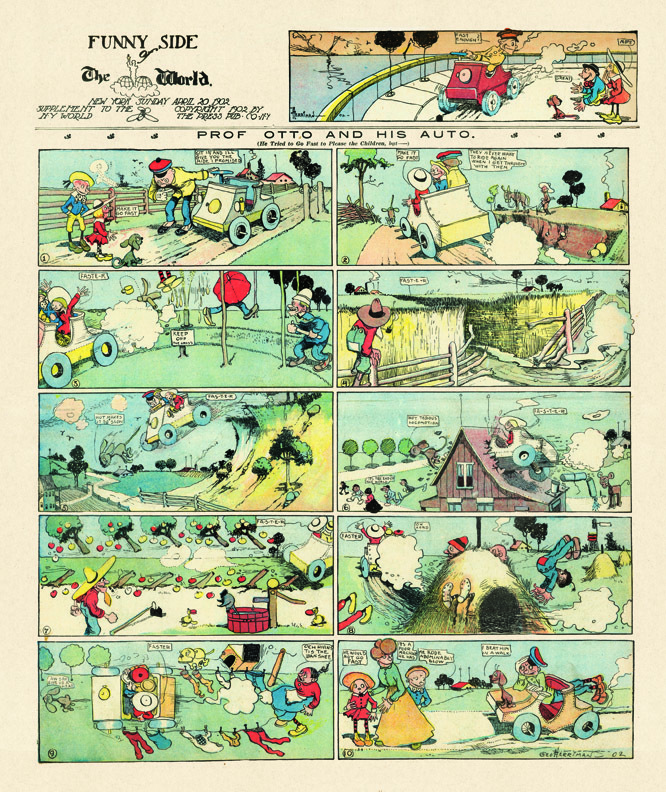 In the book's section on Walt McDougall, we mistkenly identified the illustration on page 10 as the cover of the first World Color Supplement. 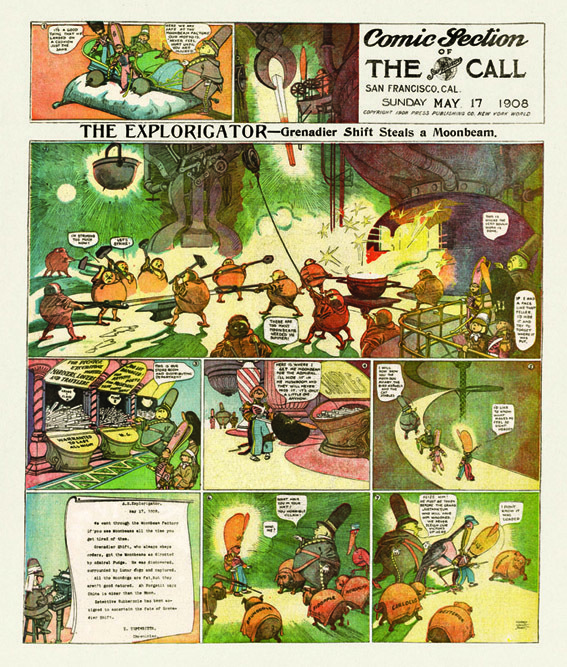 As mentioned in the text, that "first" McDougall piece was May 21, 1893, and is seen here on the bottom left.